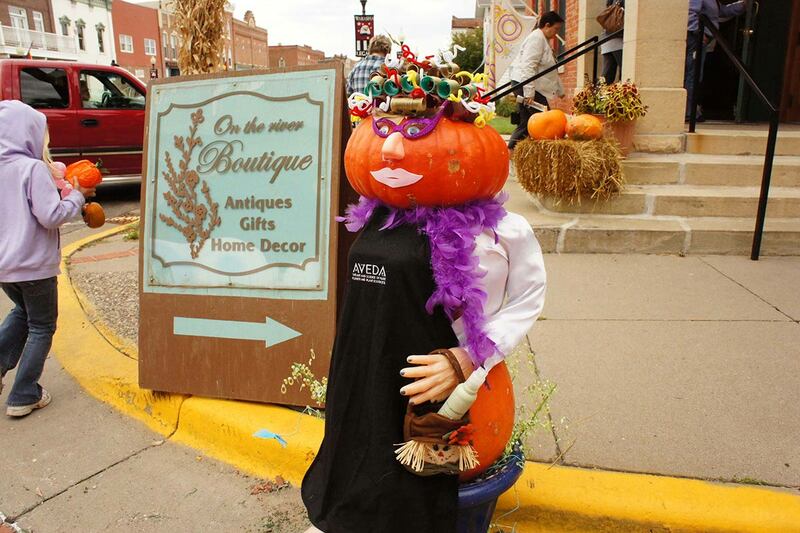 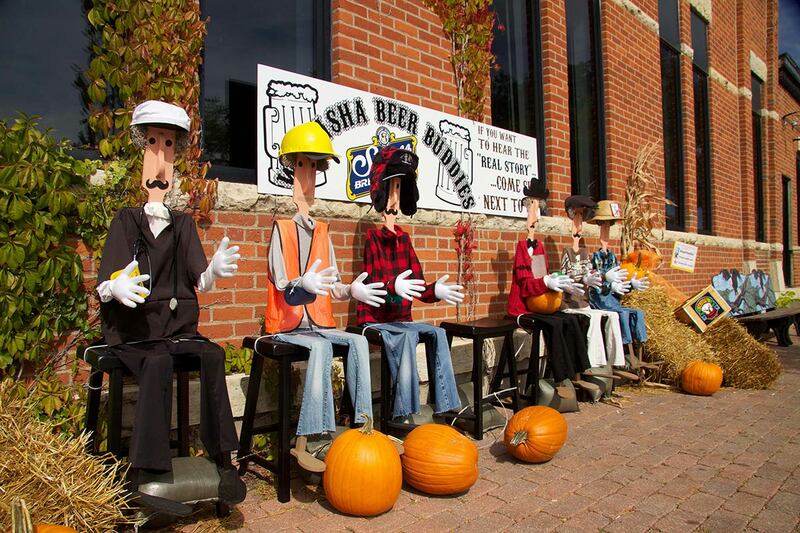 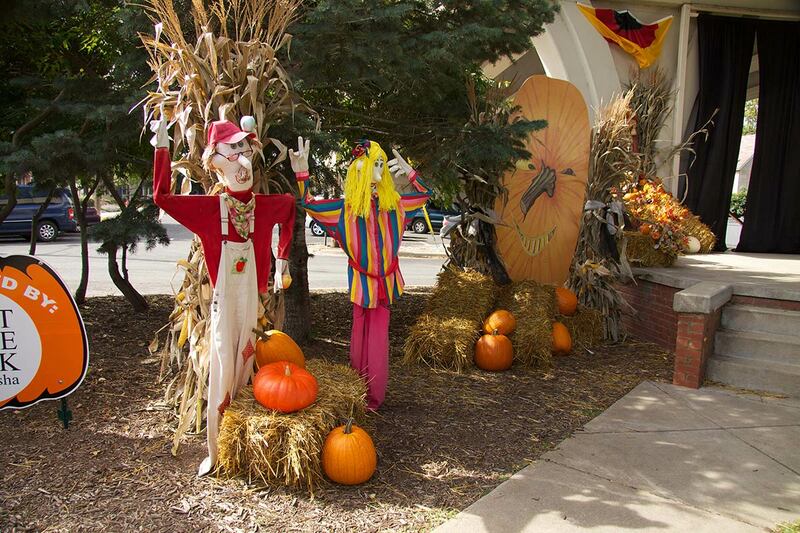 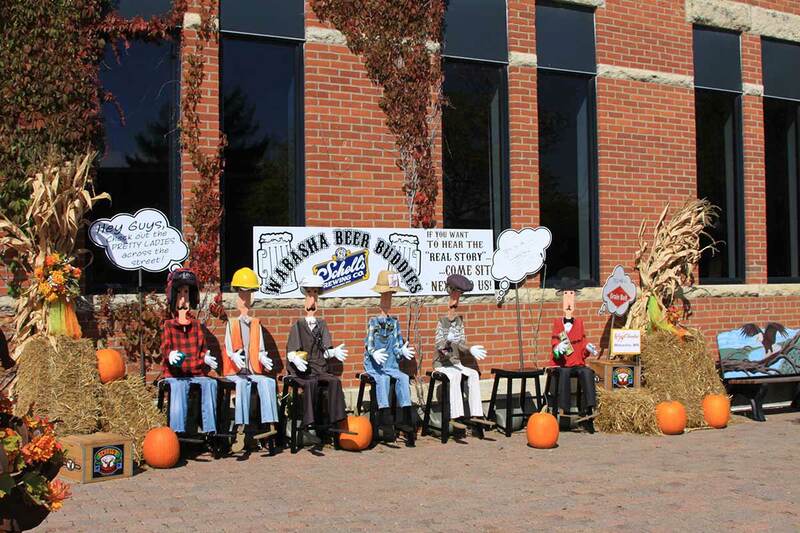 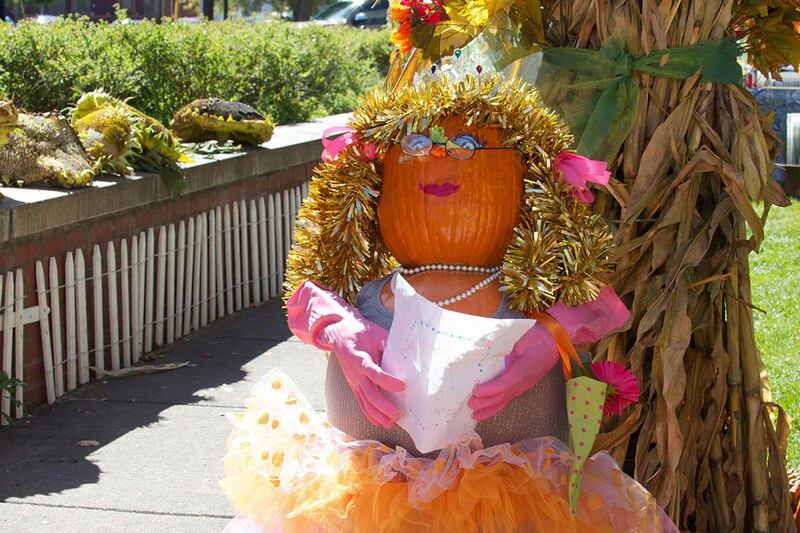 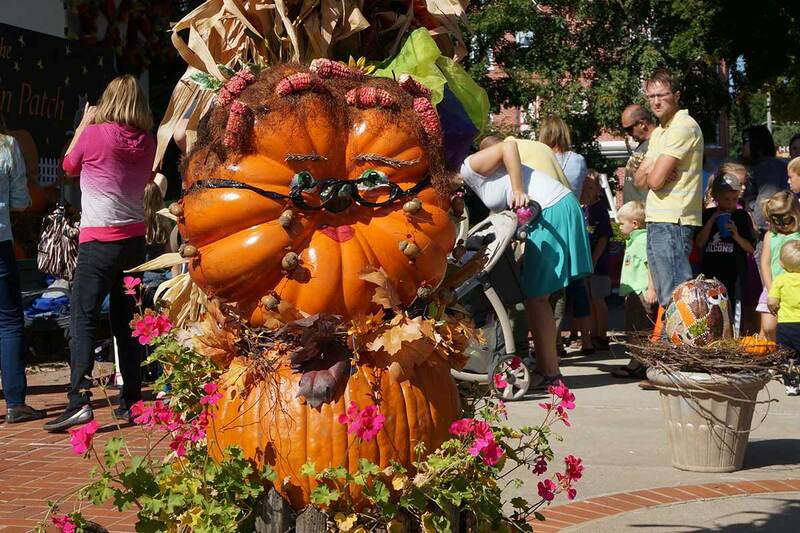 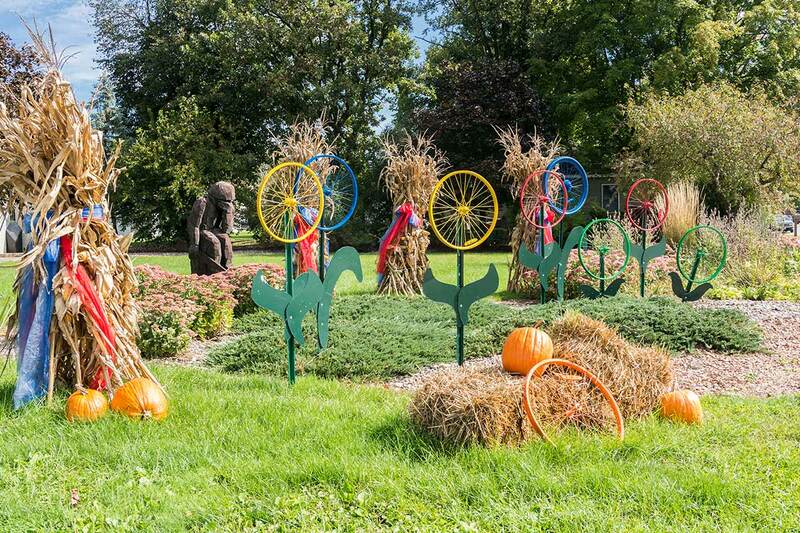 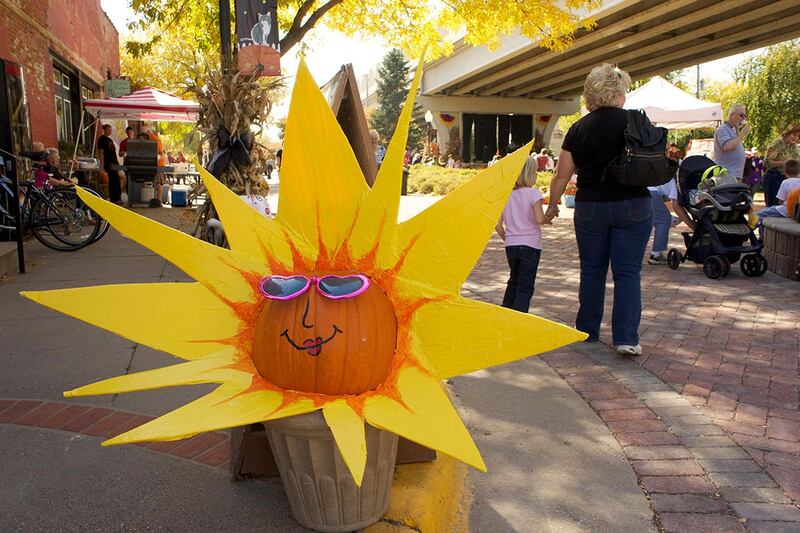 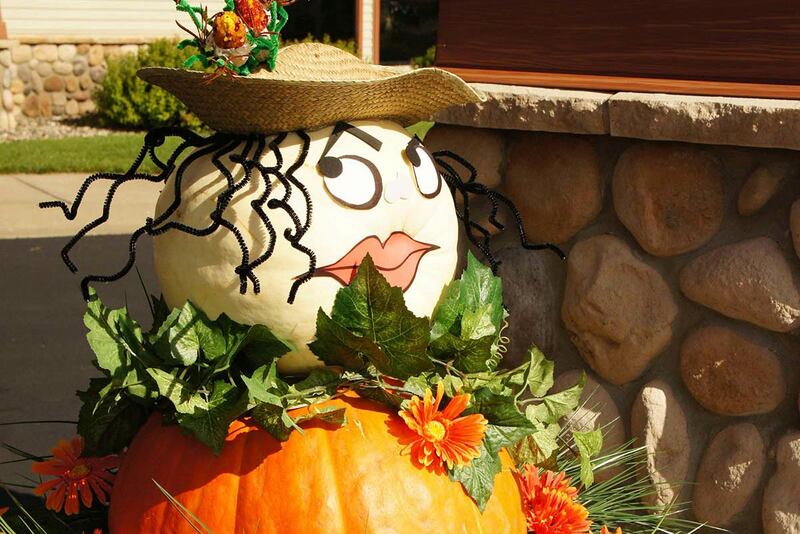 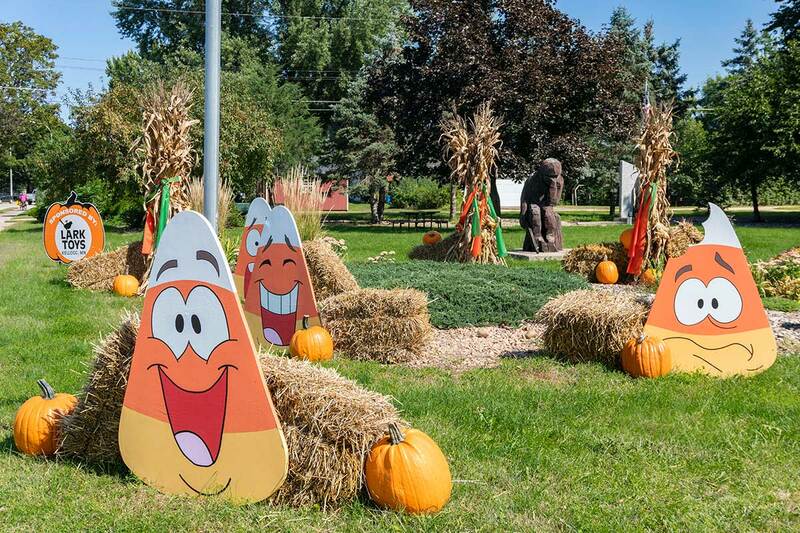 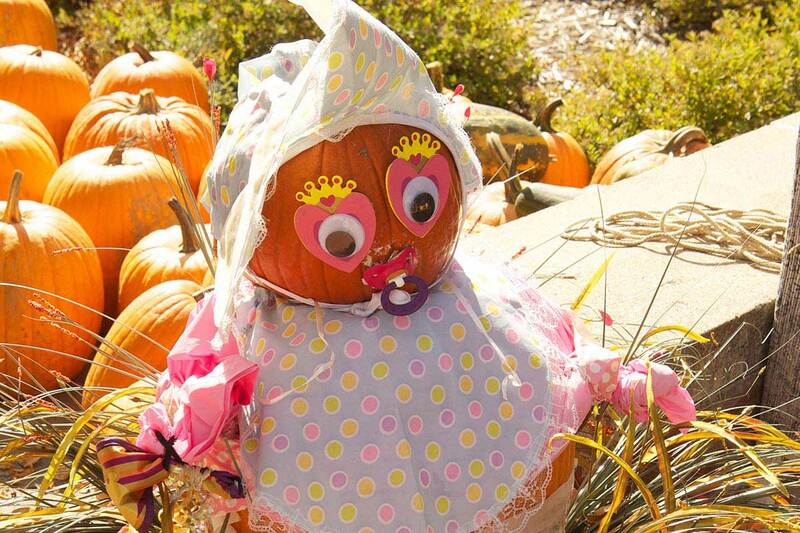 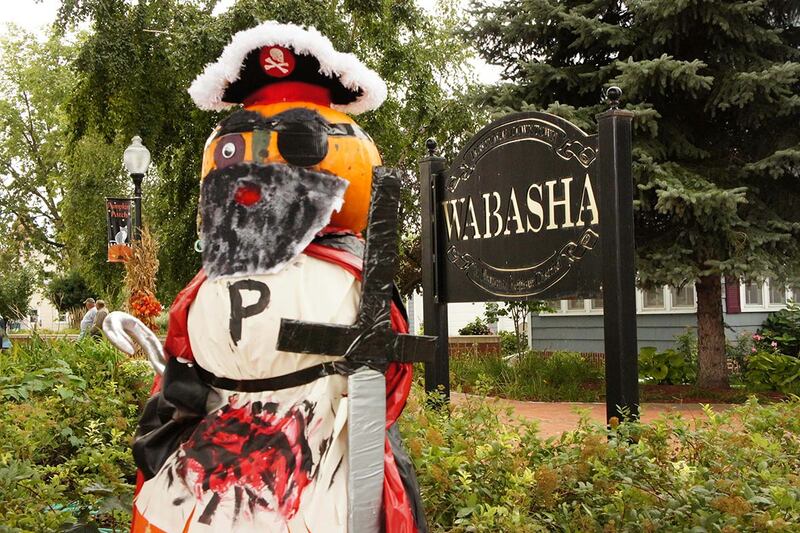 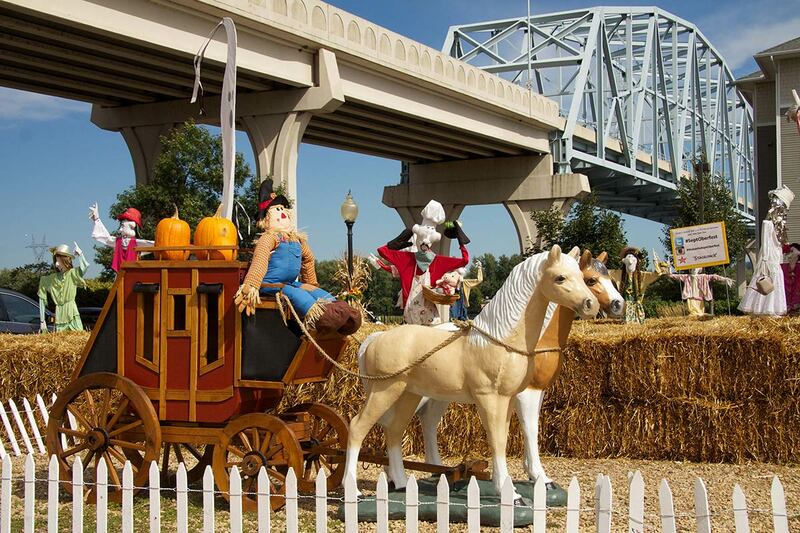 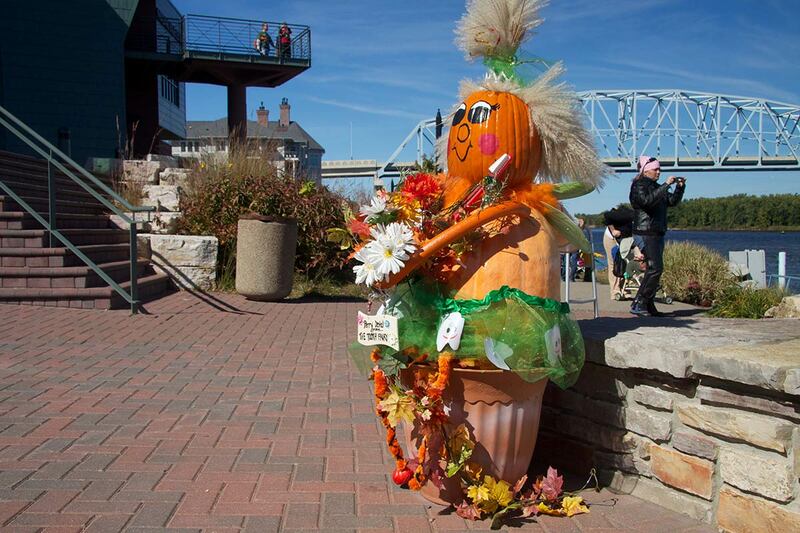 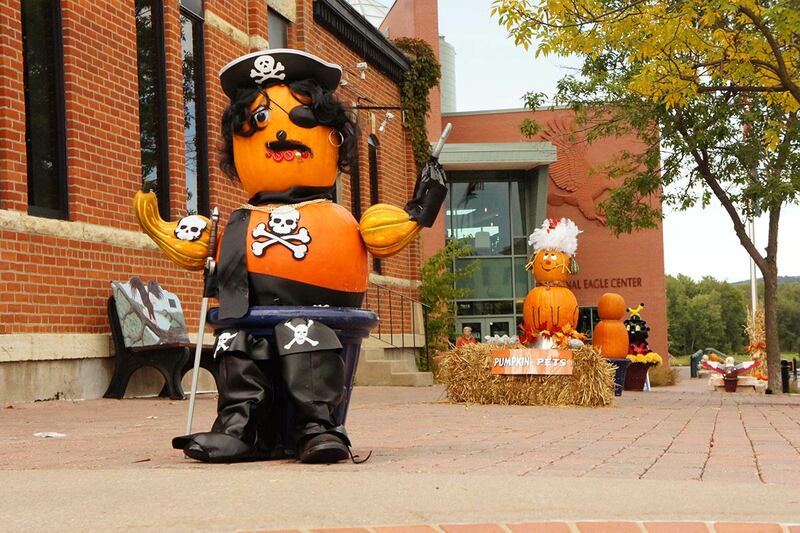 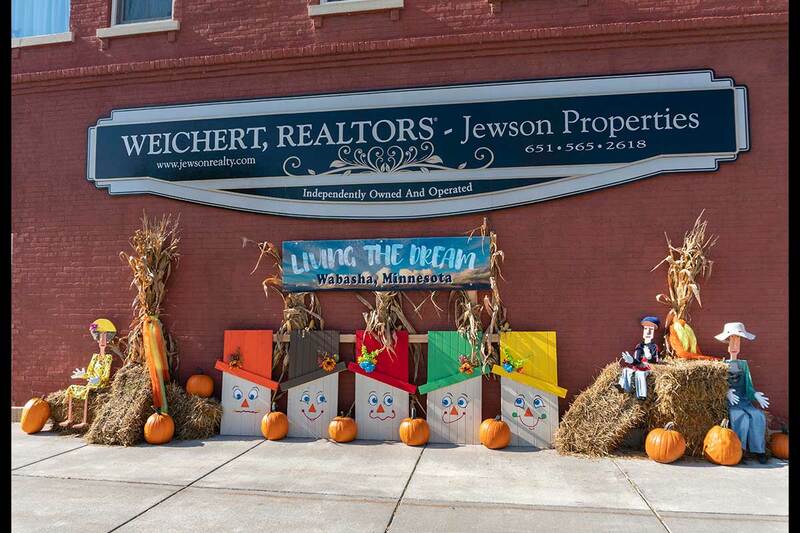 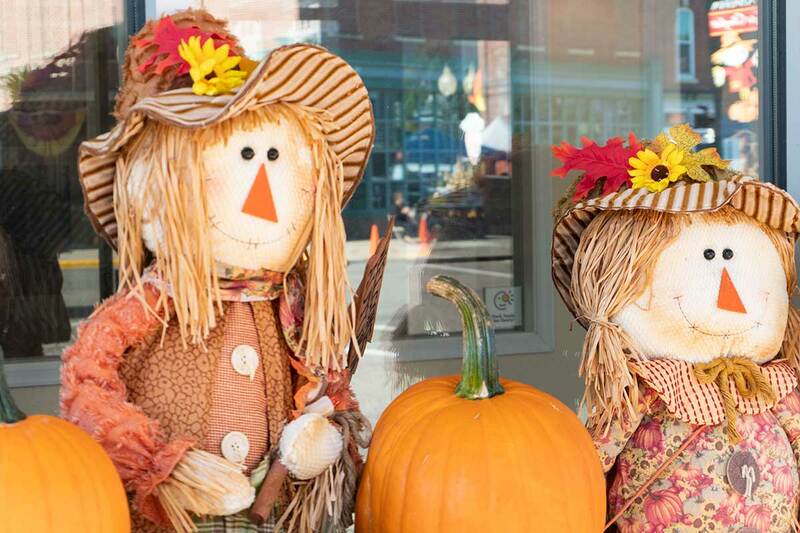 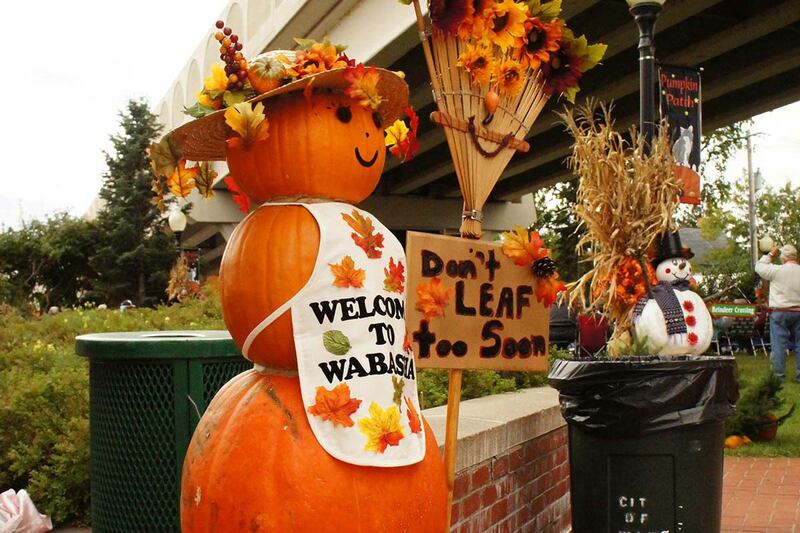 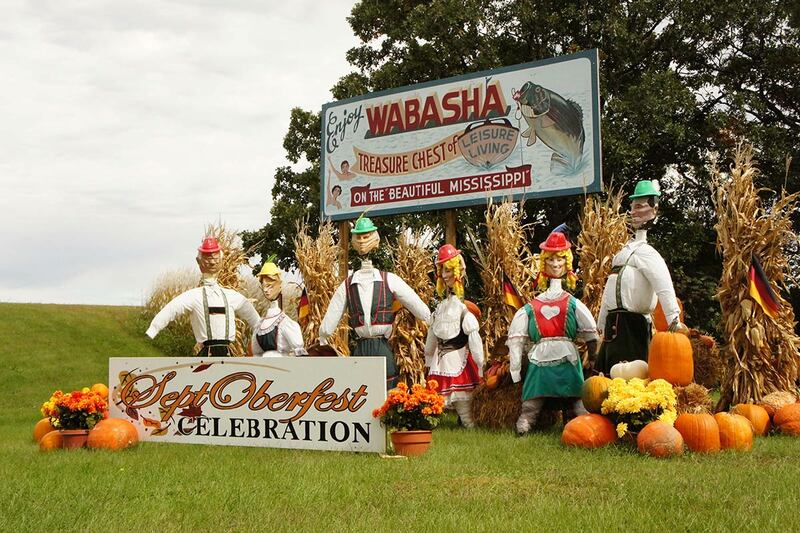 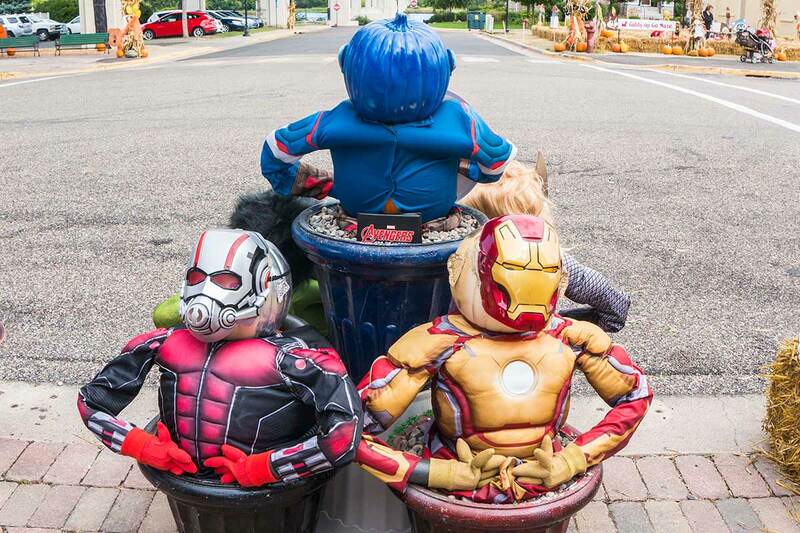 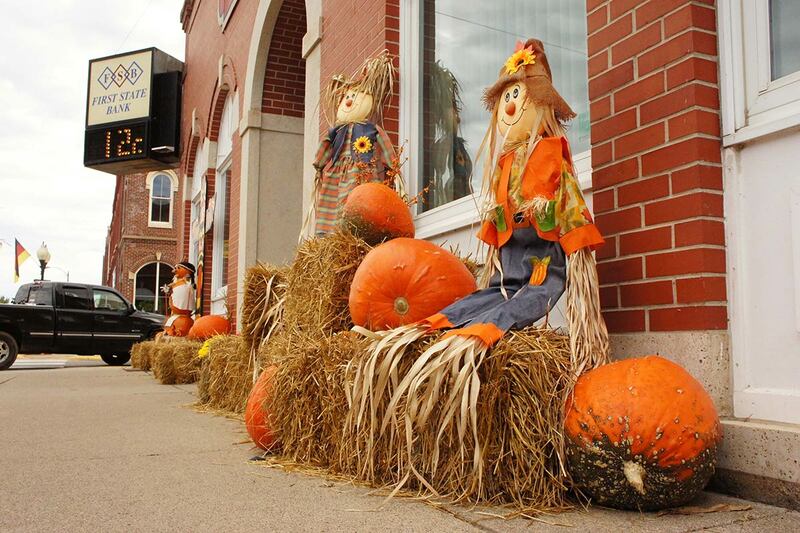 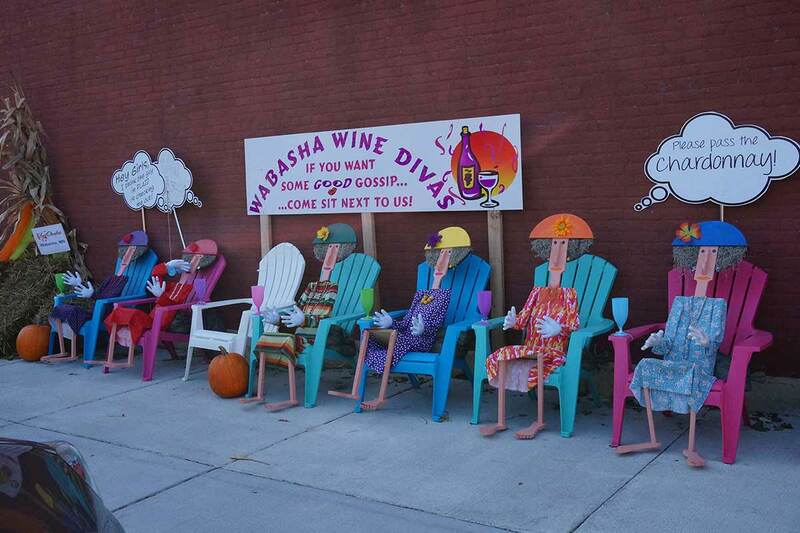 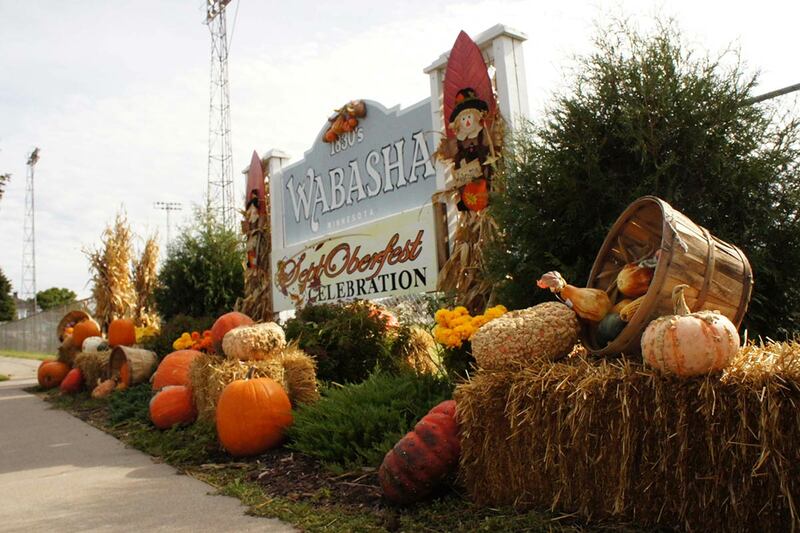 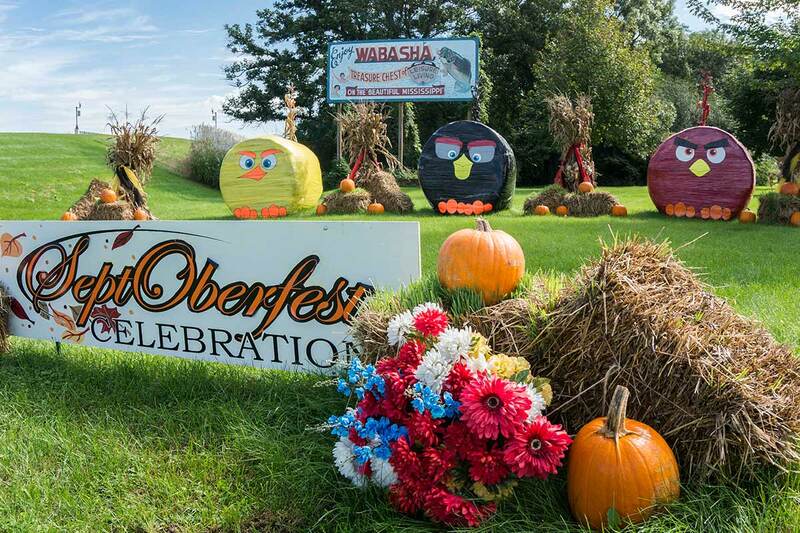 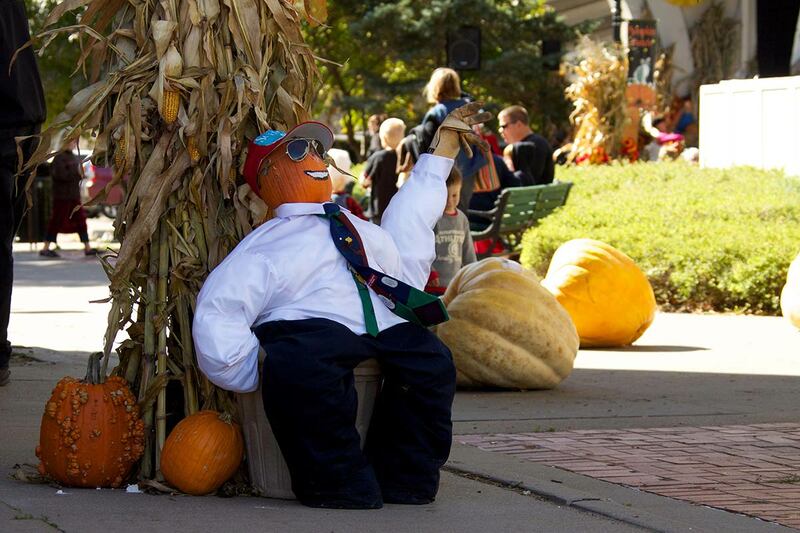 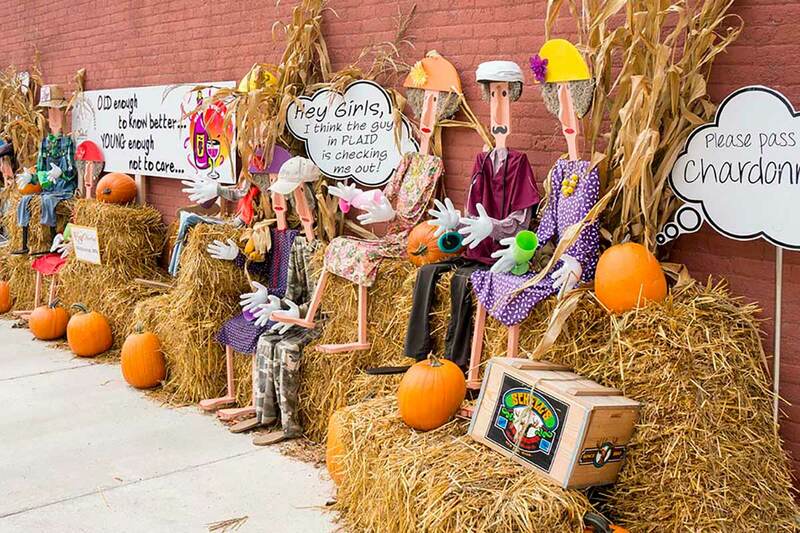 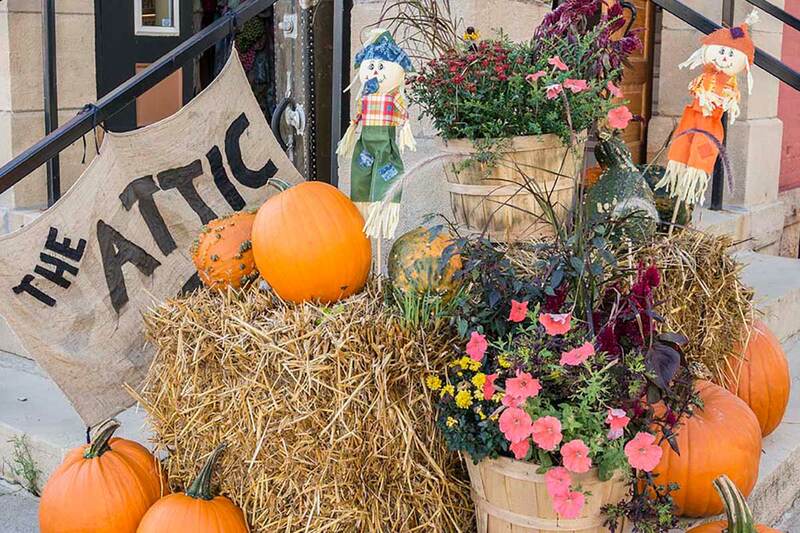 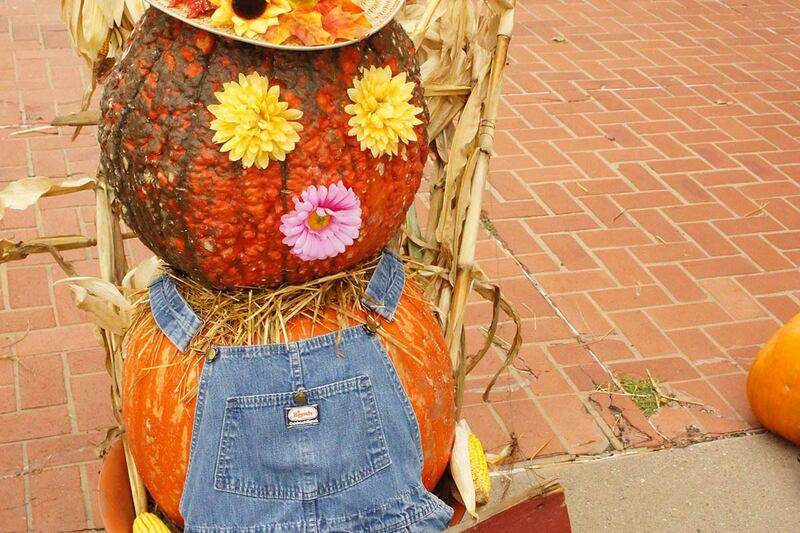 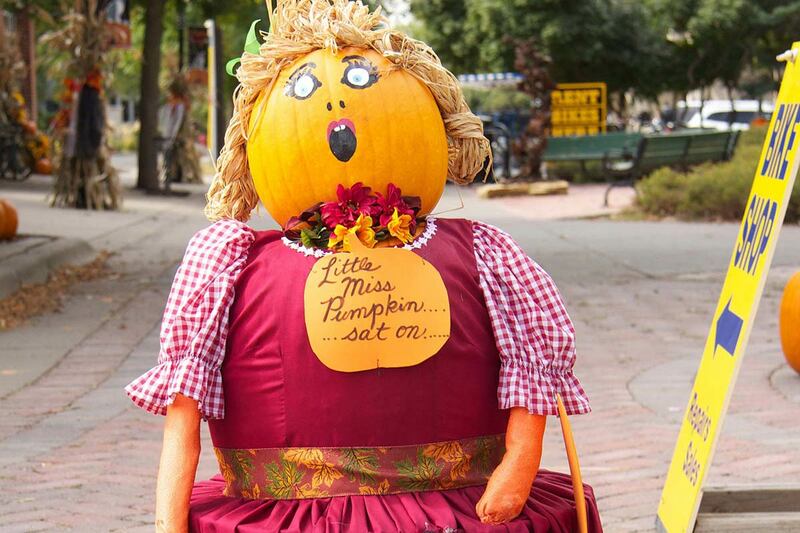 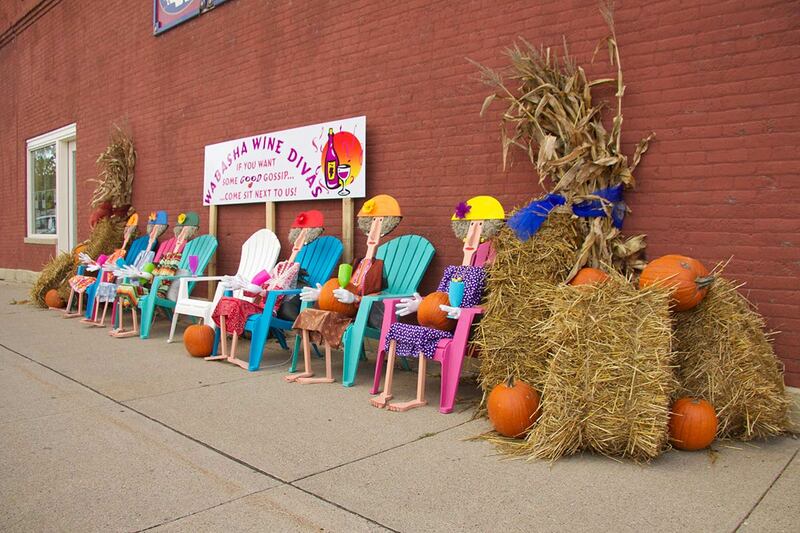 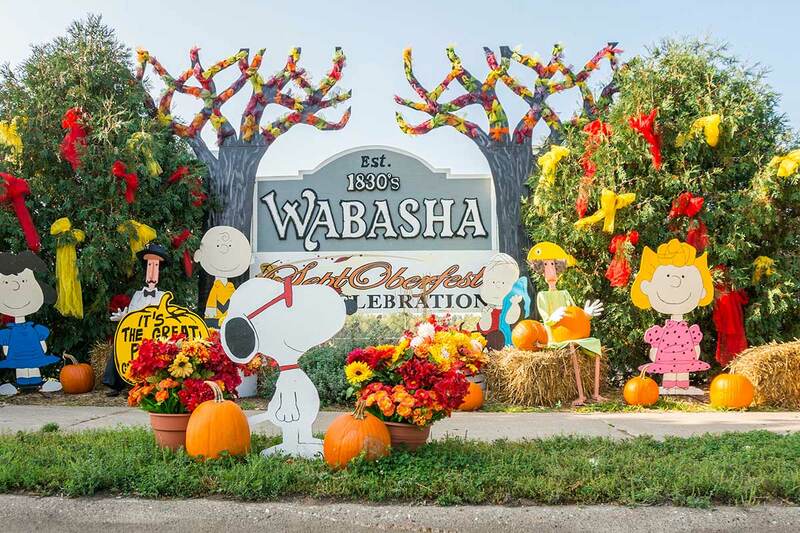 Every year during SeptOberfest, Wabasha’s streets come to life with colorful and crazy pumpkin topiaries! 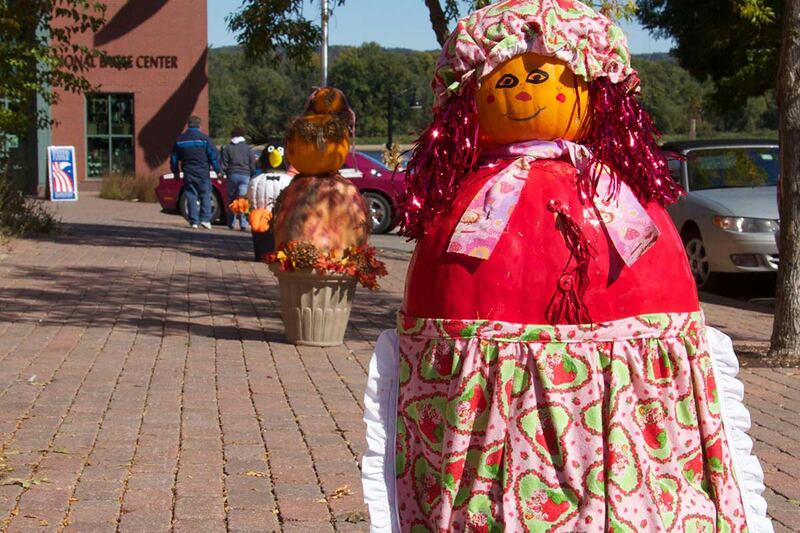 The first pumpkin displays made their debut in 2009. 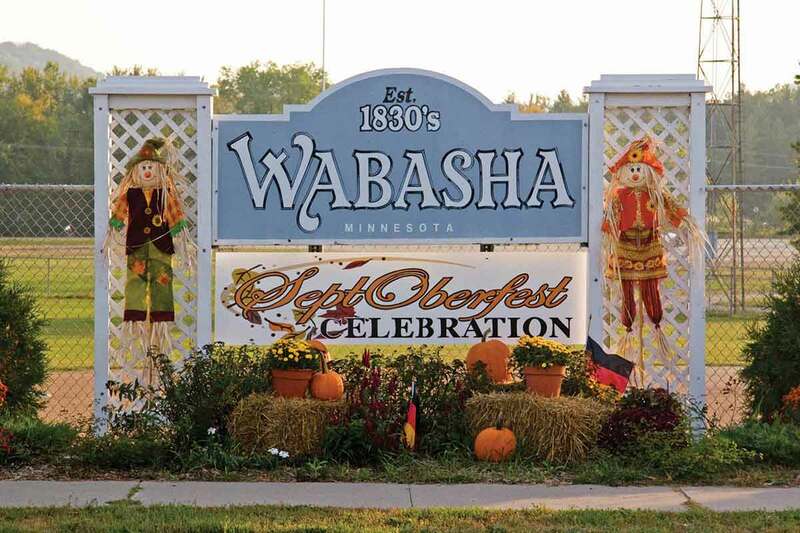 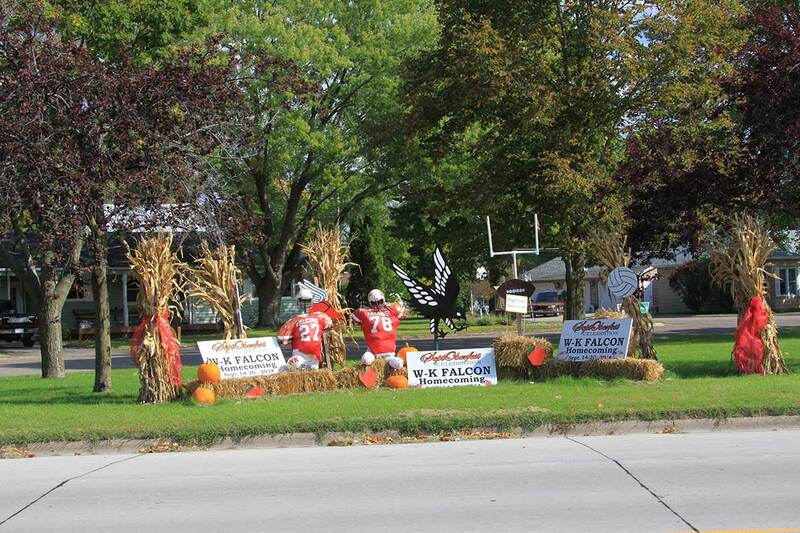 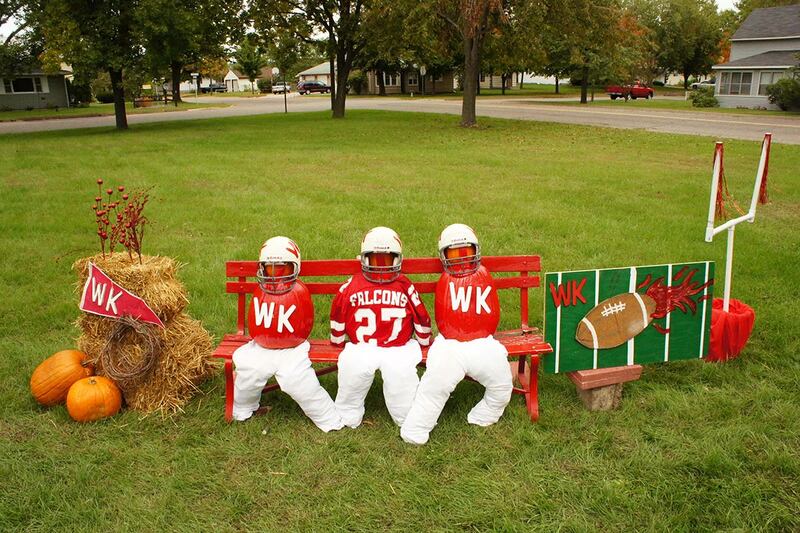 Since then, it has grown into a tradition that the Wabasha-Kellogg community has come to love. 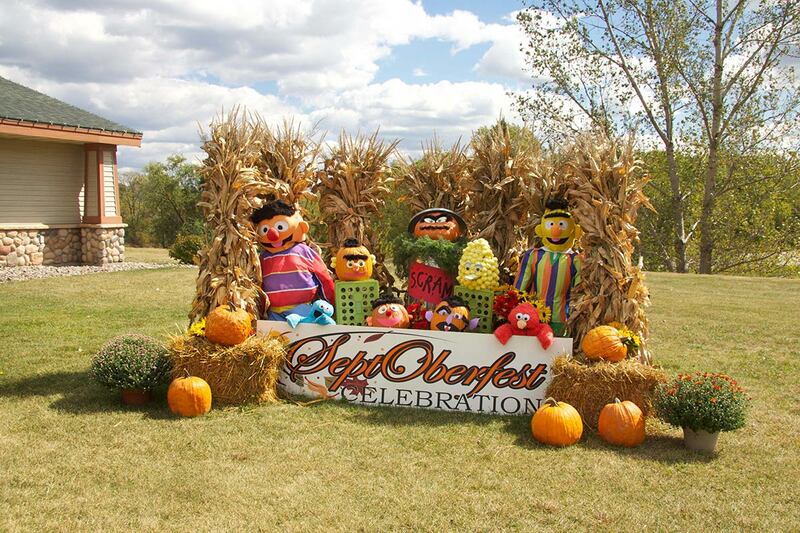 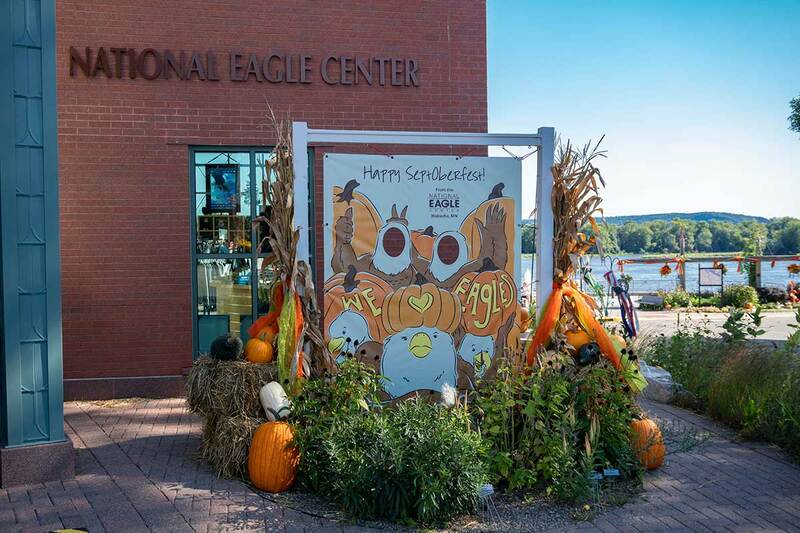 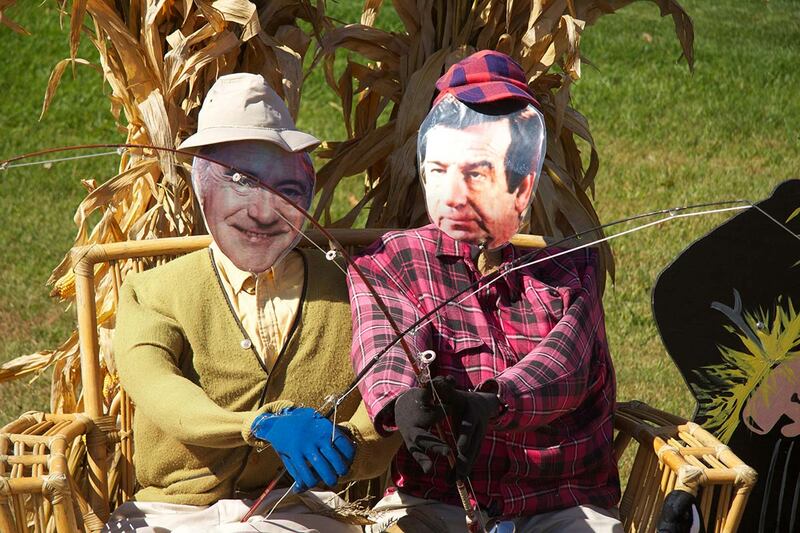 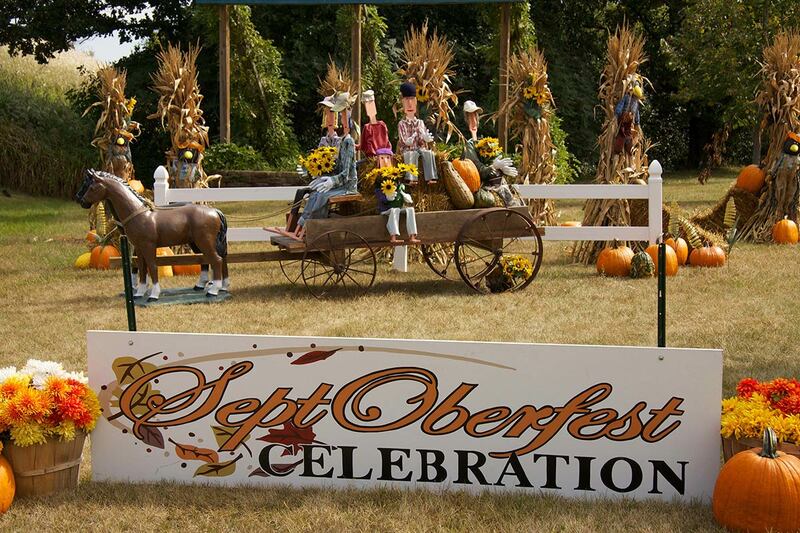 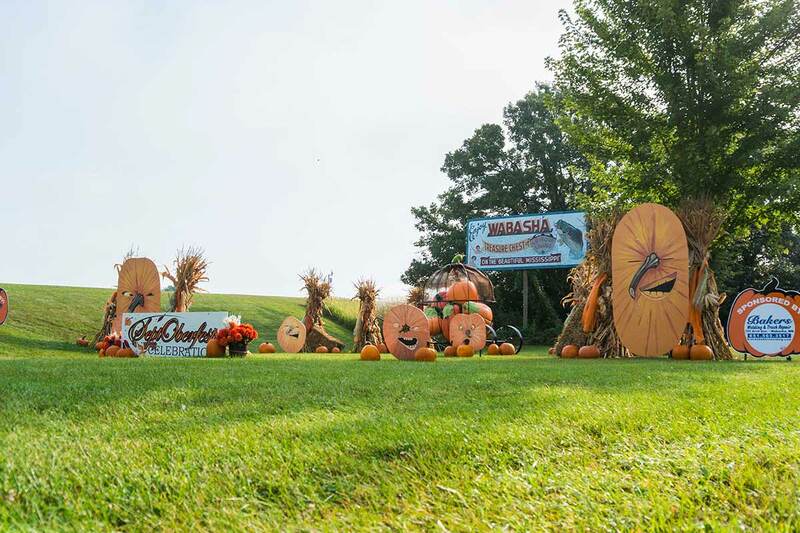 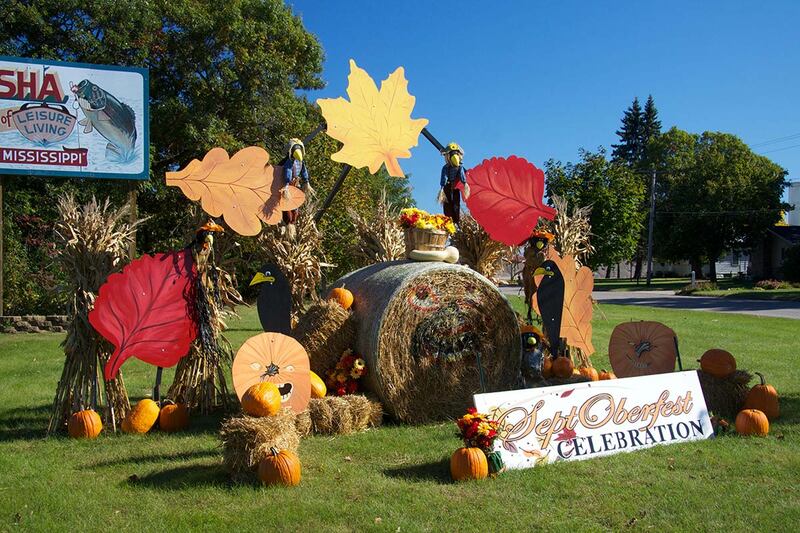 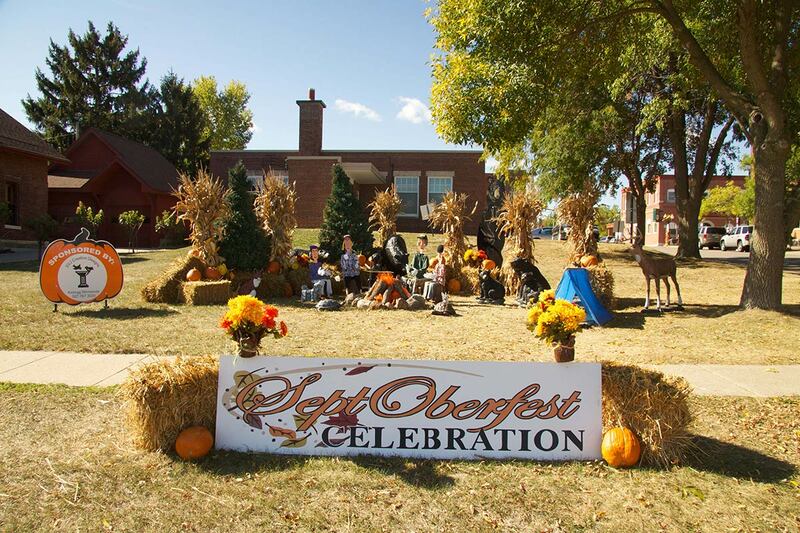 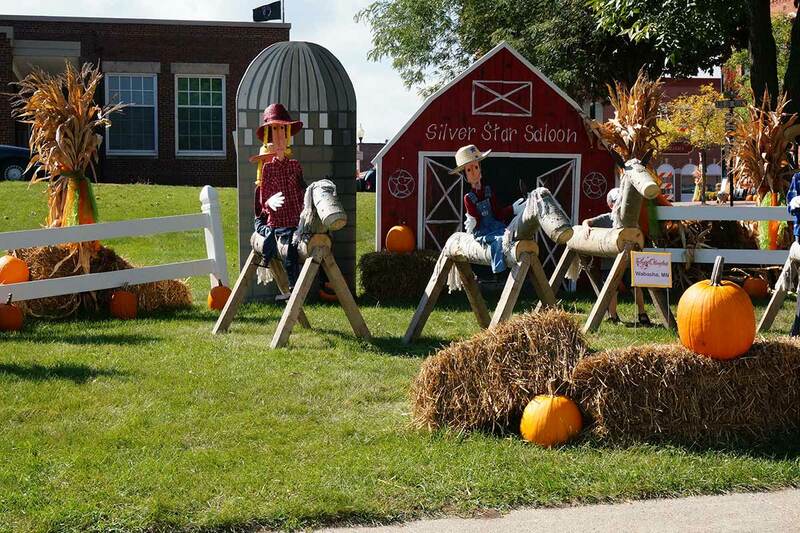 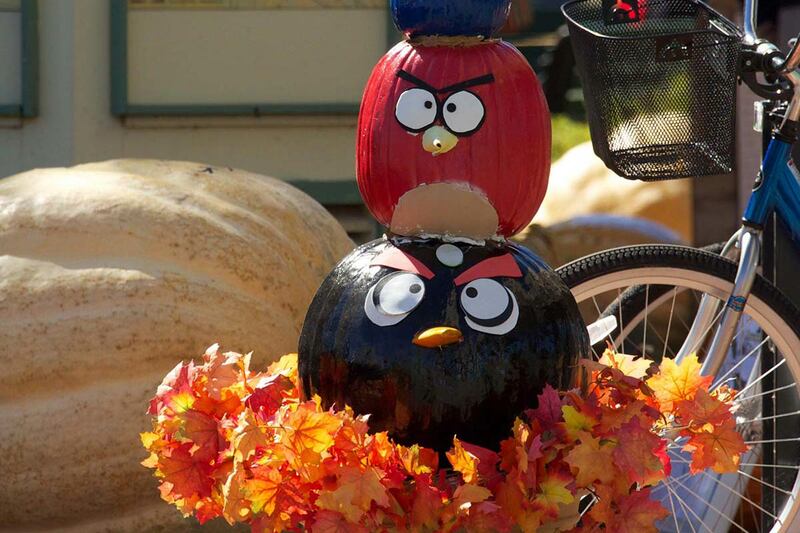 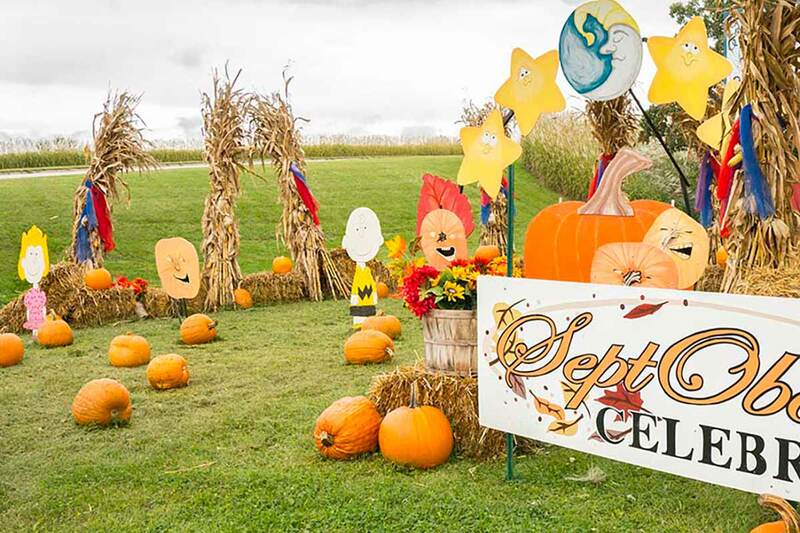 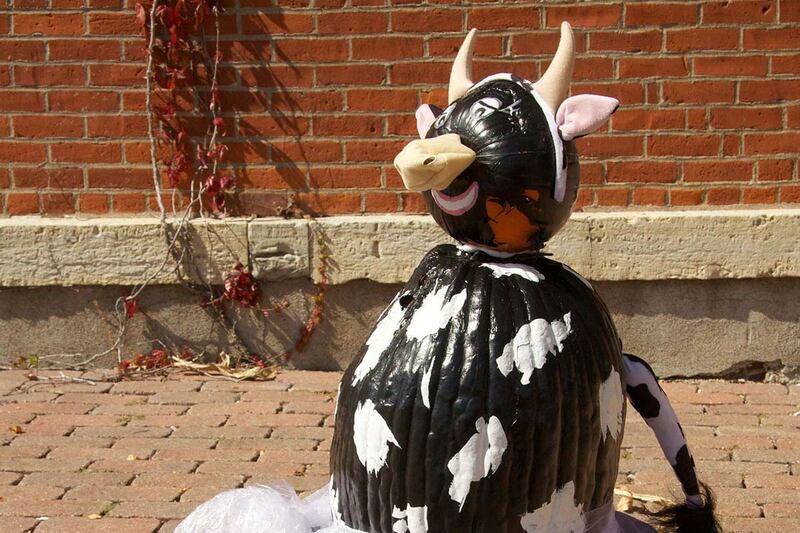 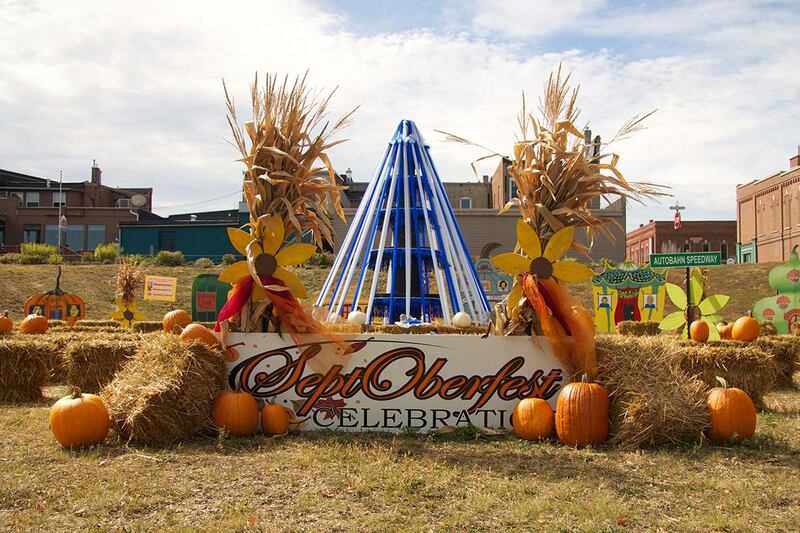 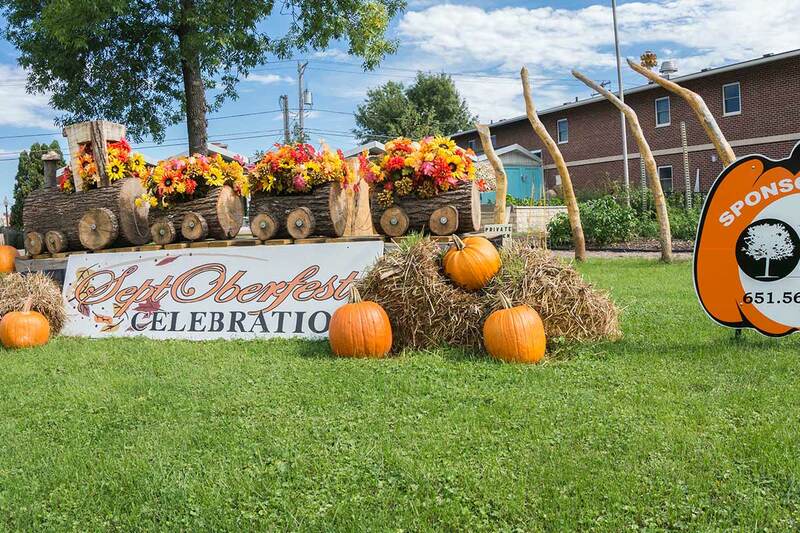 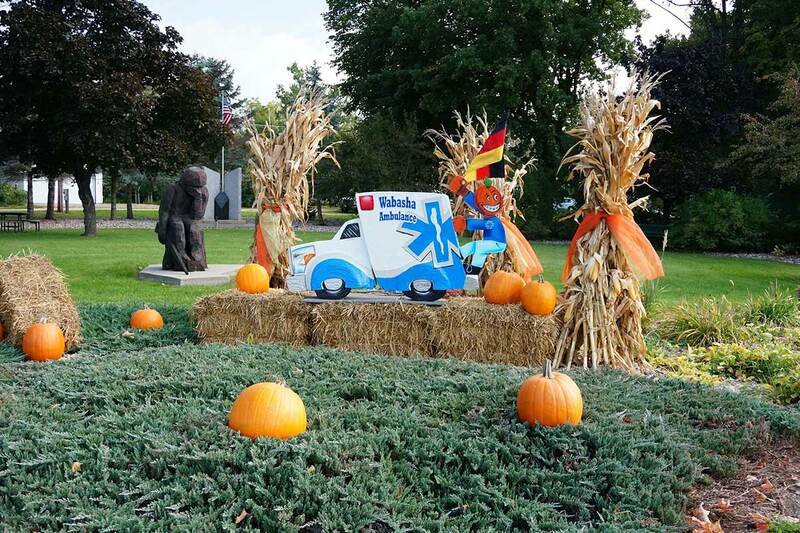 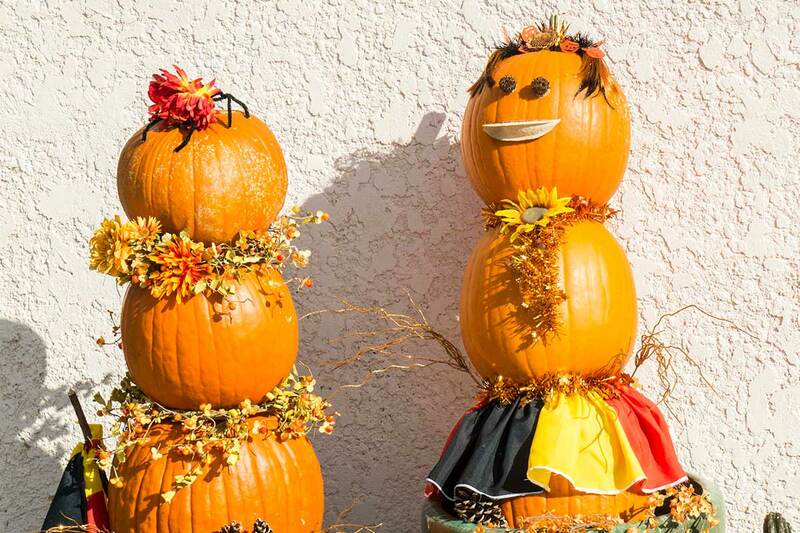 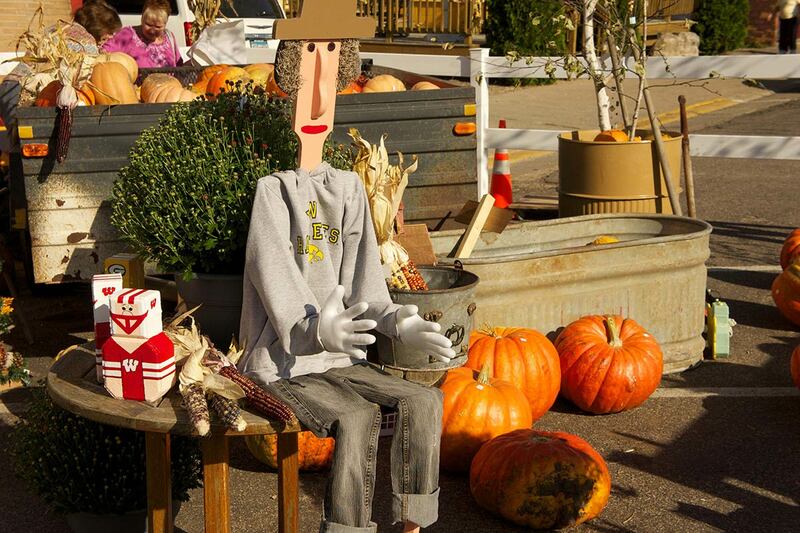 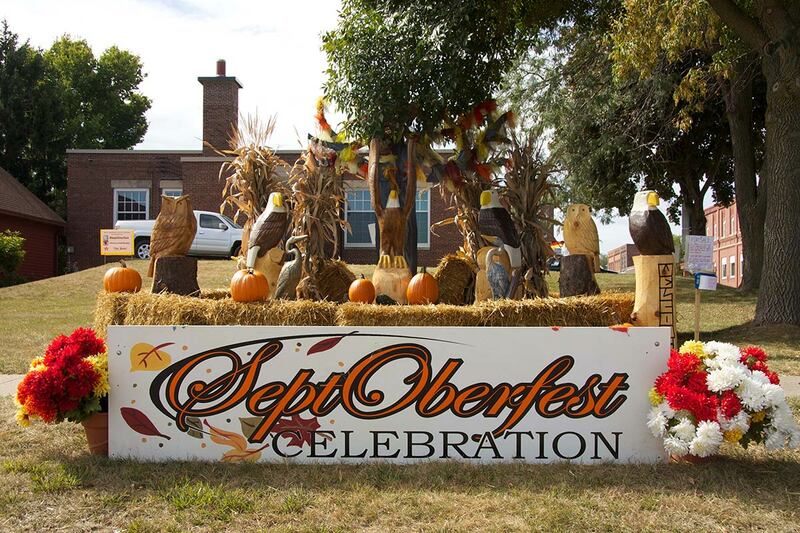 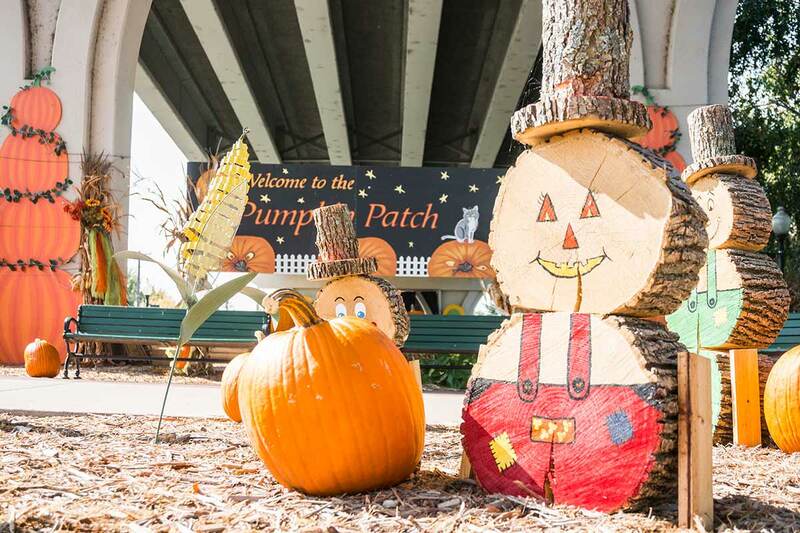 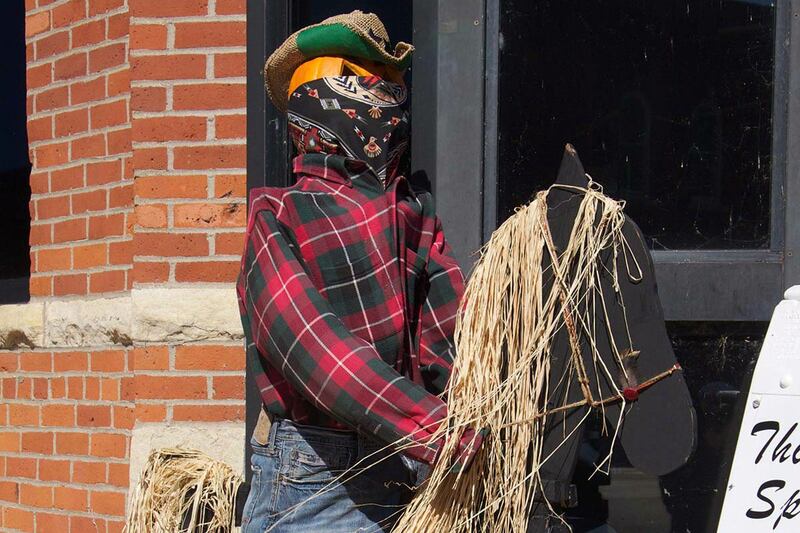 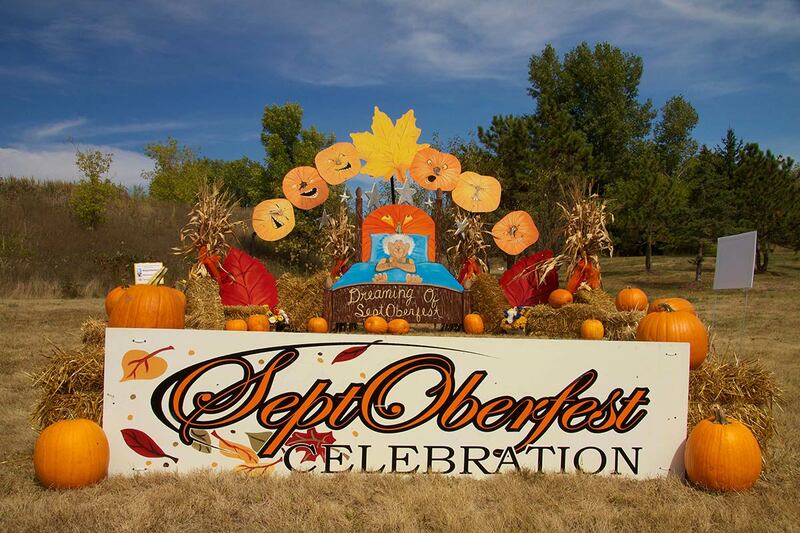 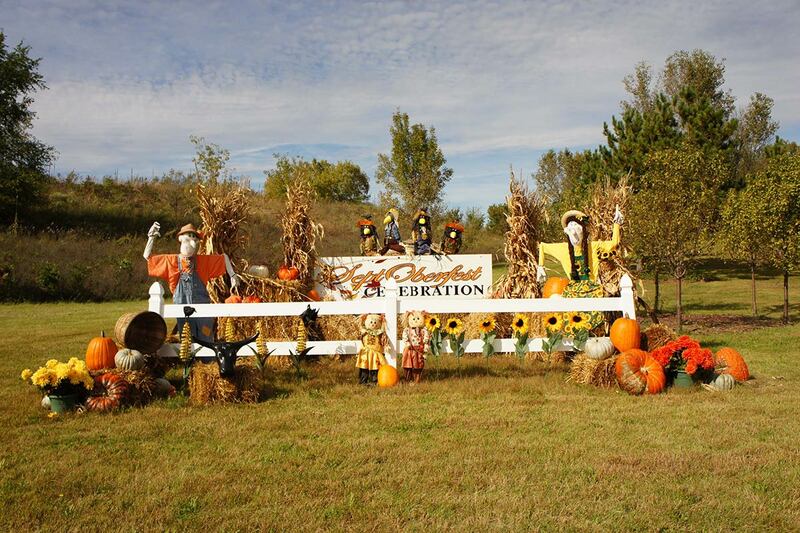 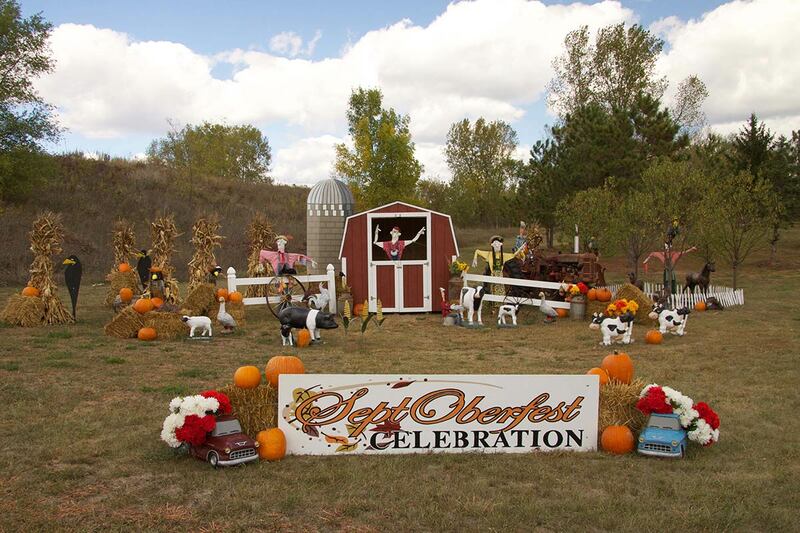 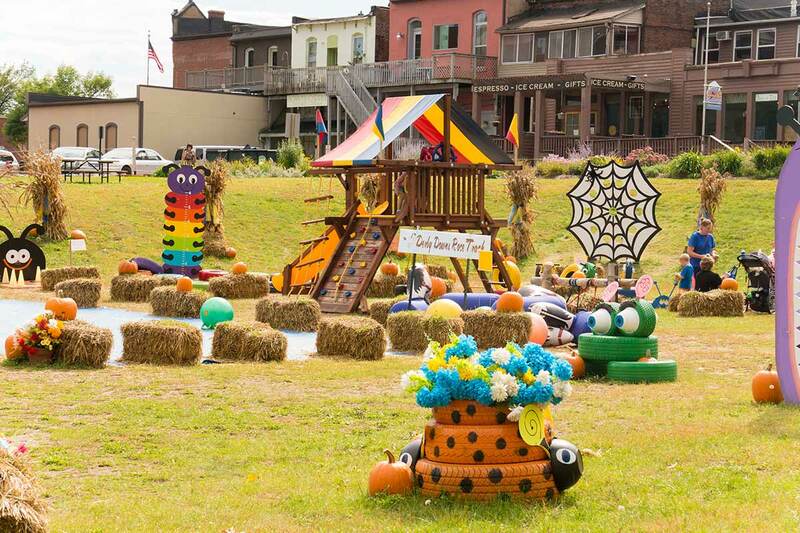 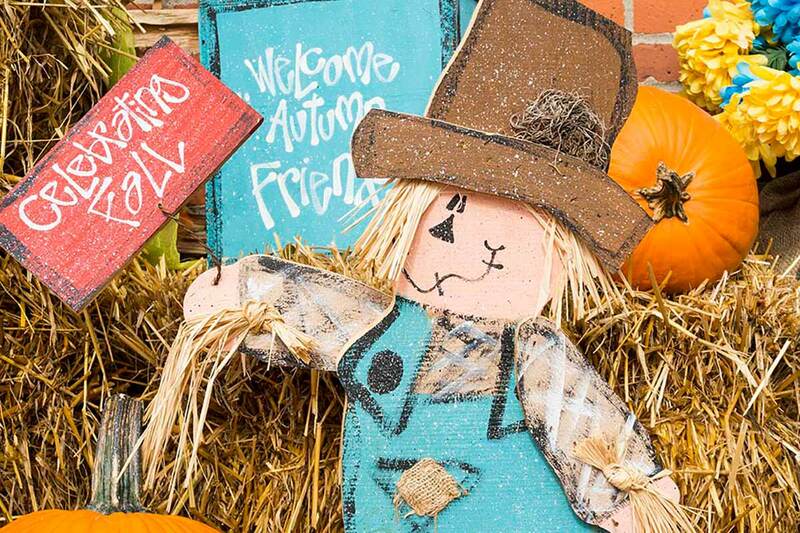 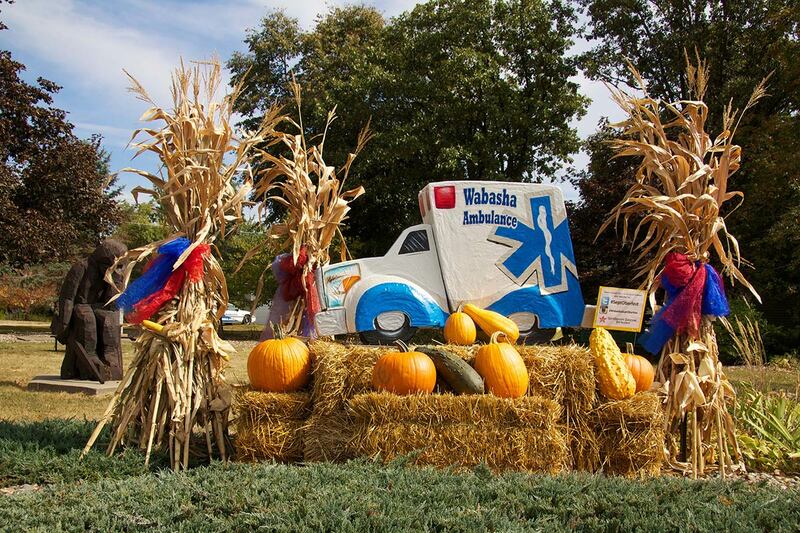 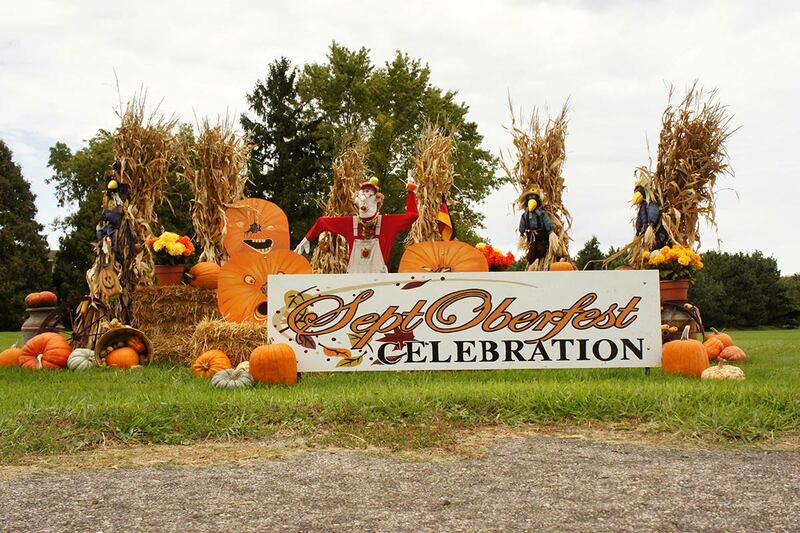 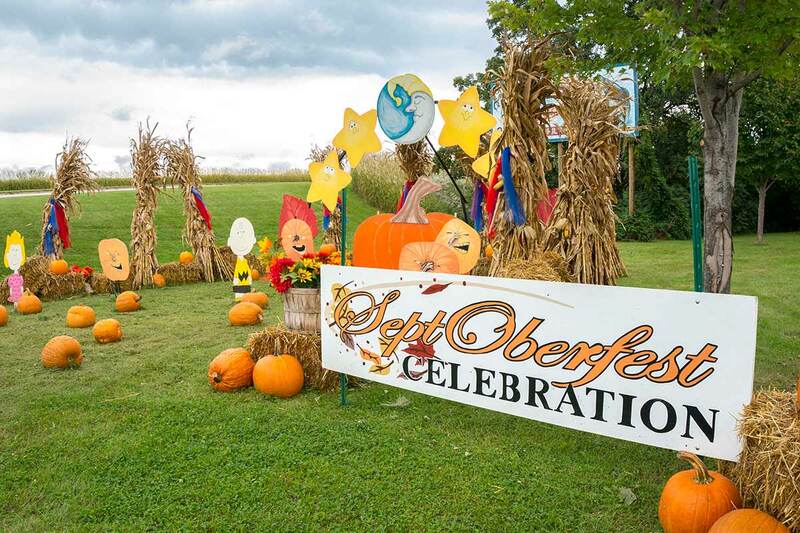 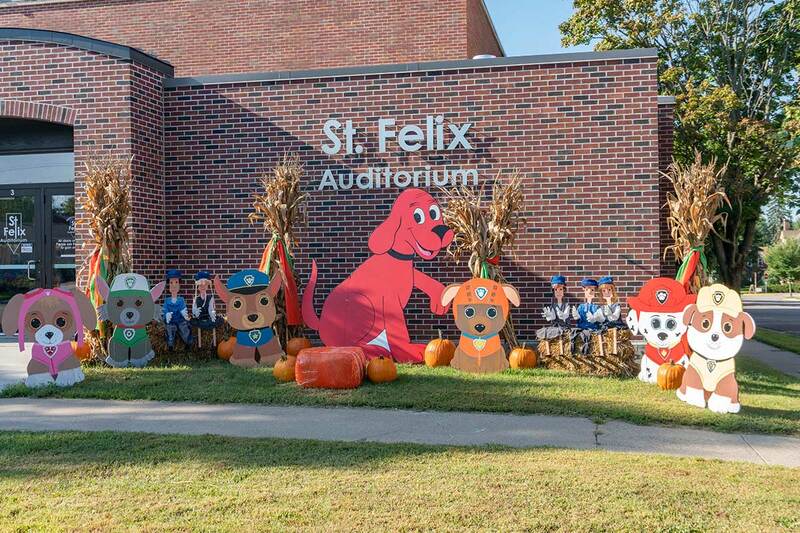 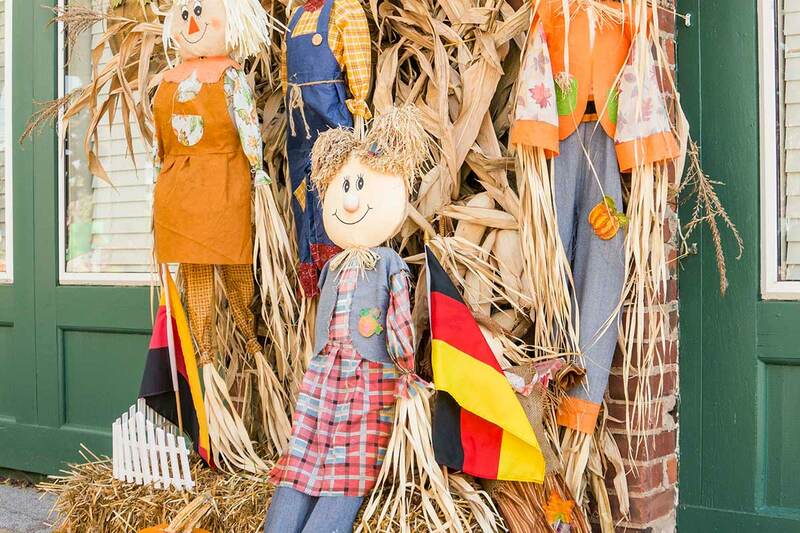 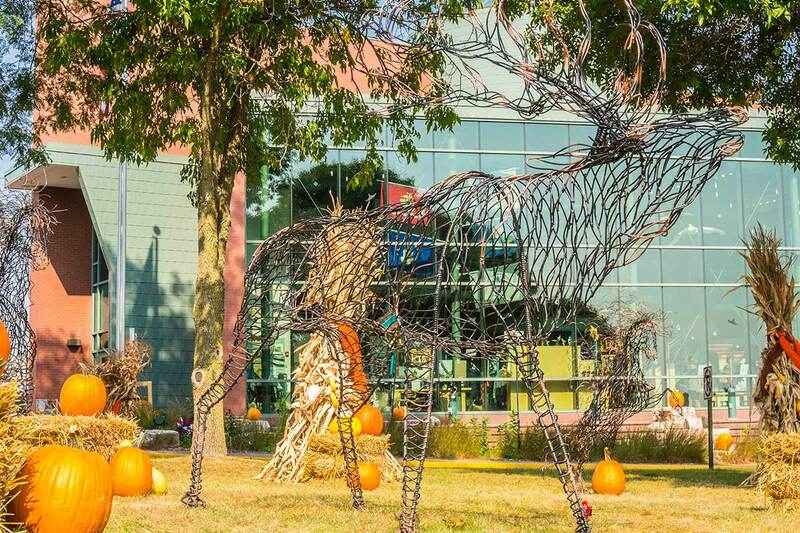 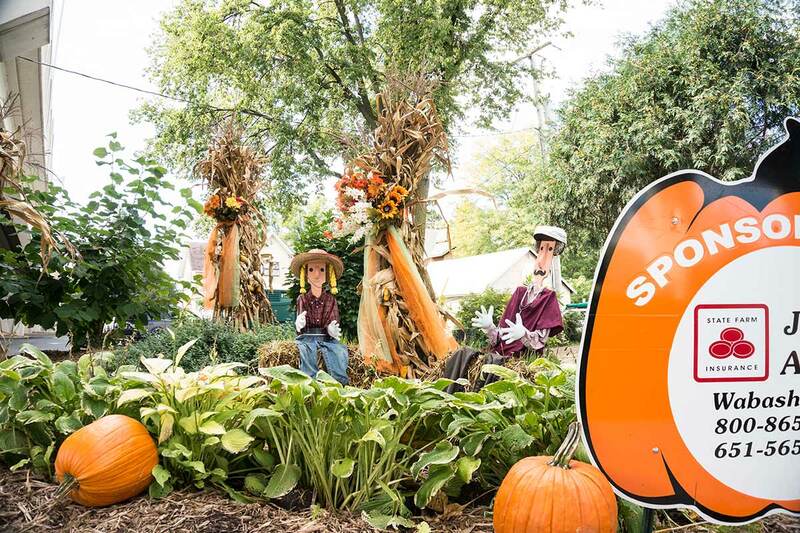 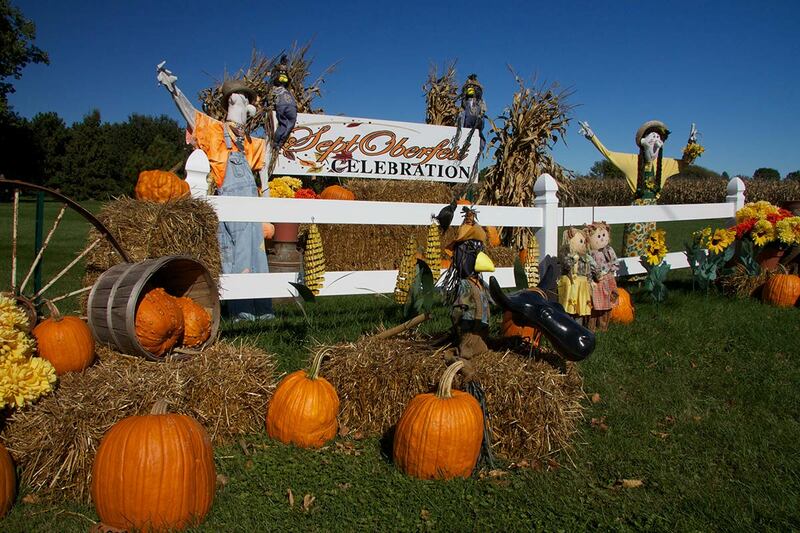 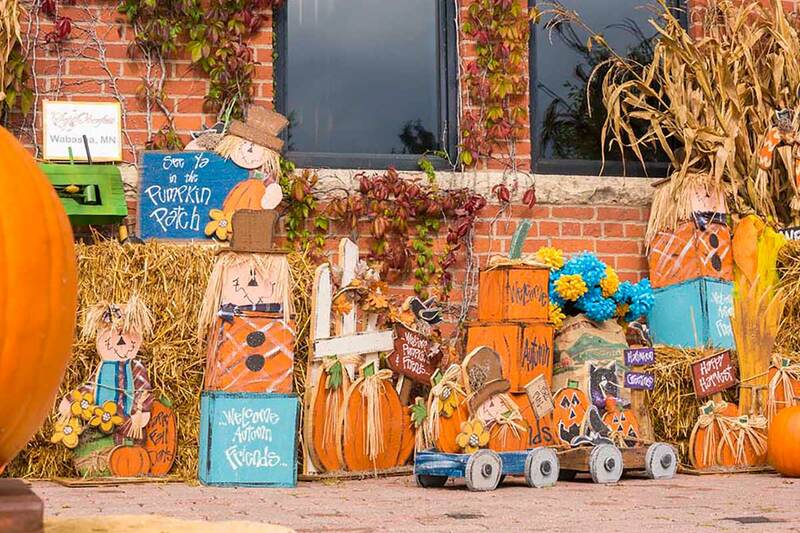 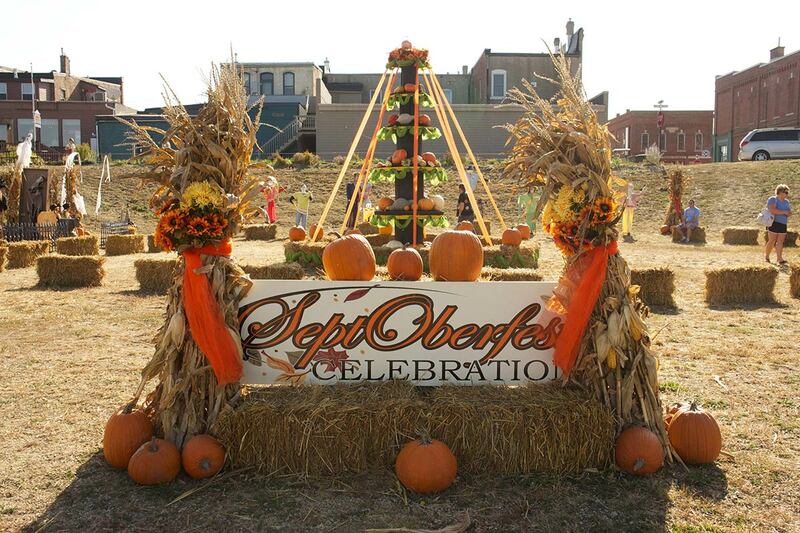 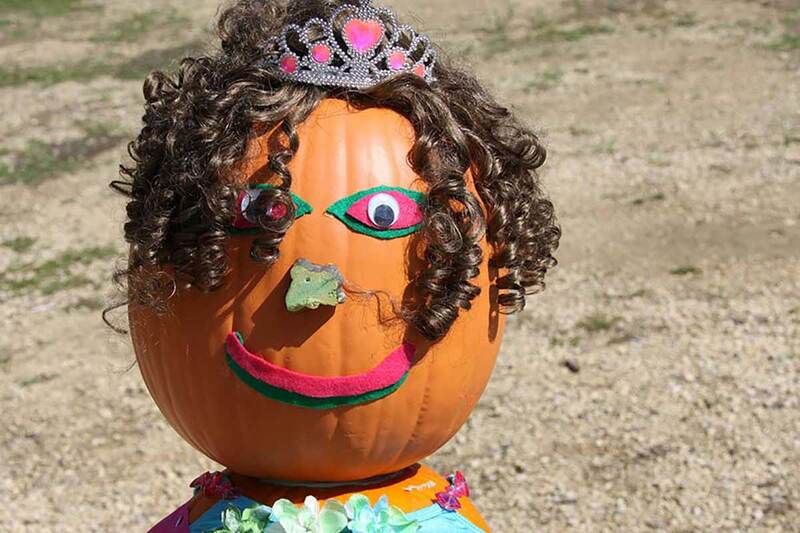 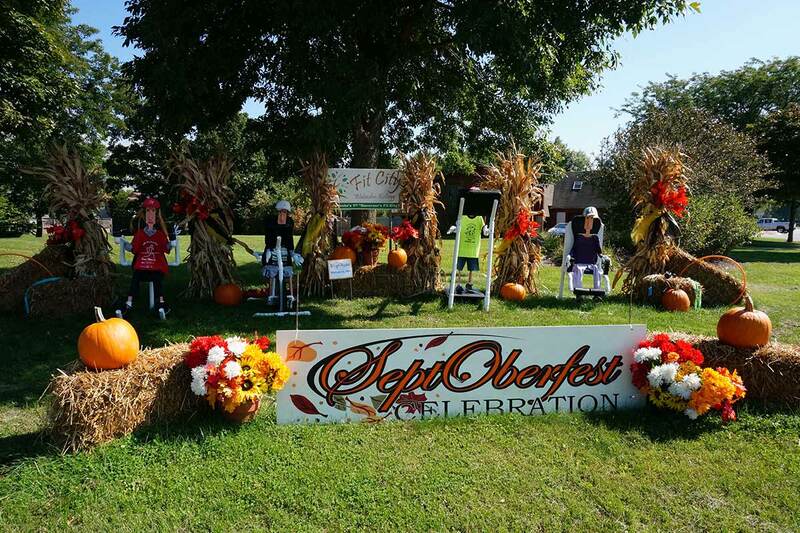 SeptOberfest is a time for the community to come together to create amazing works of art out of pumpkins, hay bales, cornhusks, scarecrows, and recycled materials. 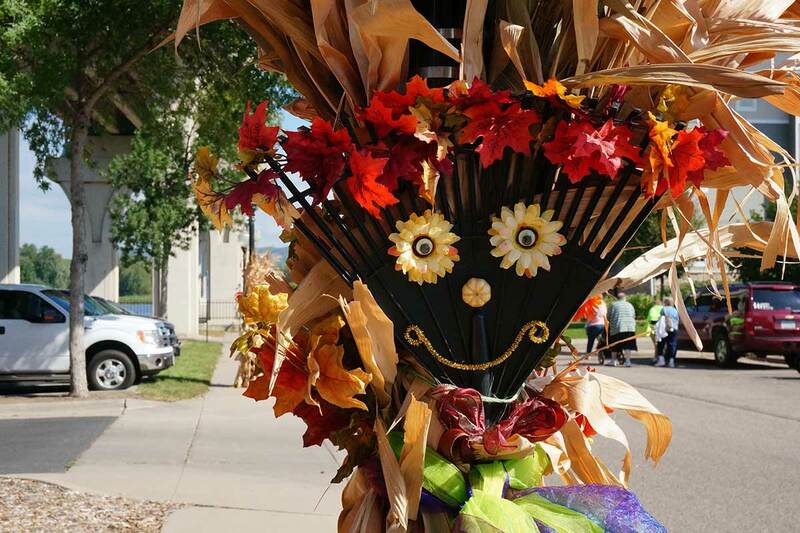 Artists, community members and families are encouraged every year to create crazy, colorful displays for everybody to enjoy. 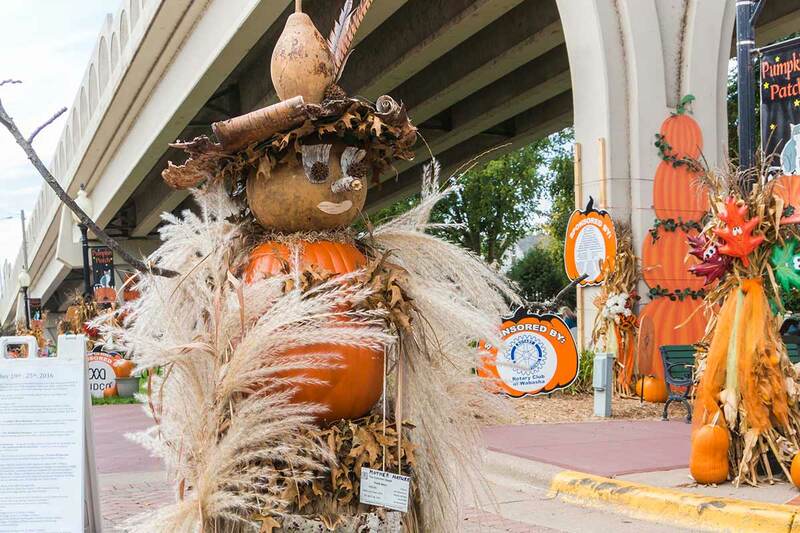 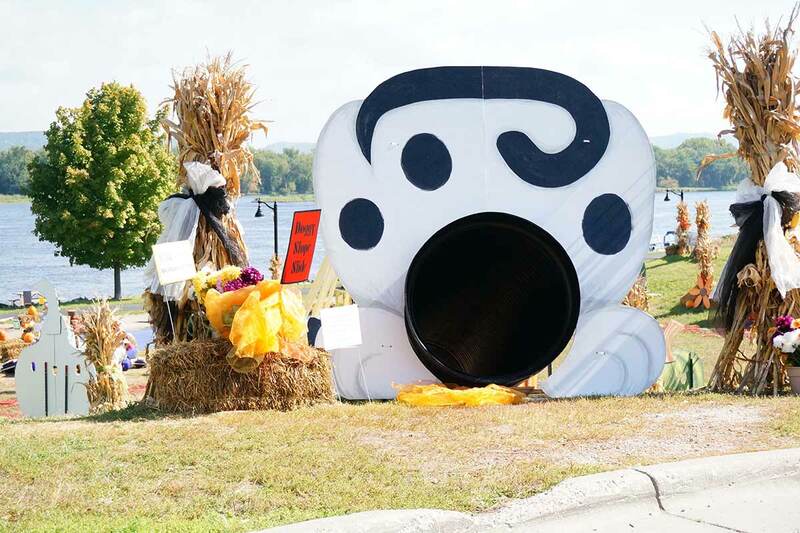 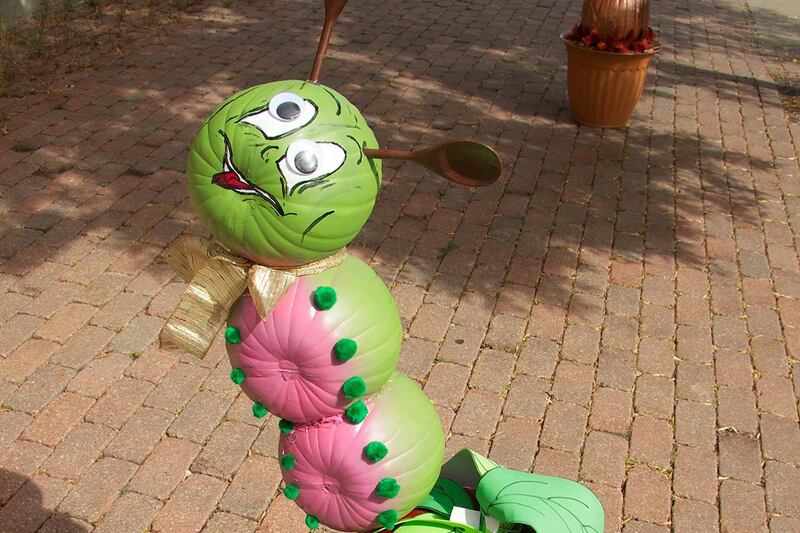 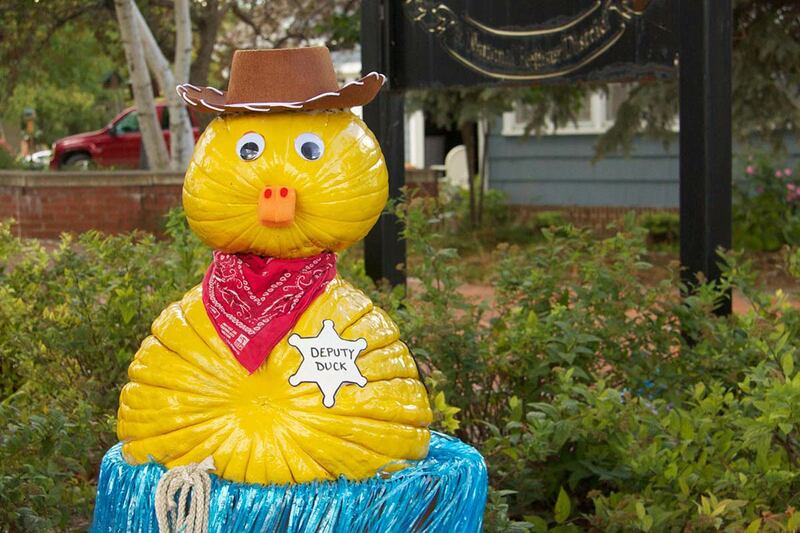 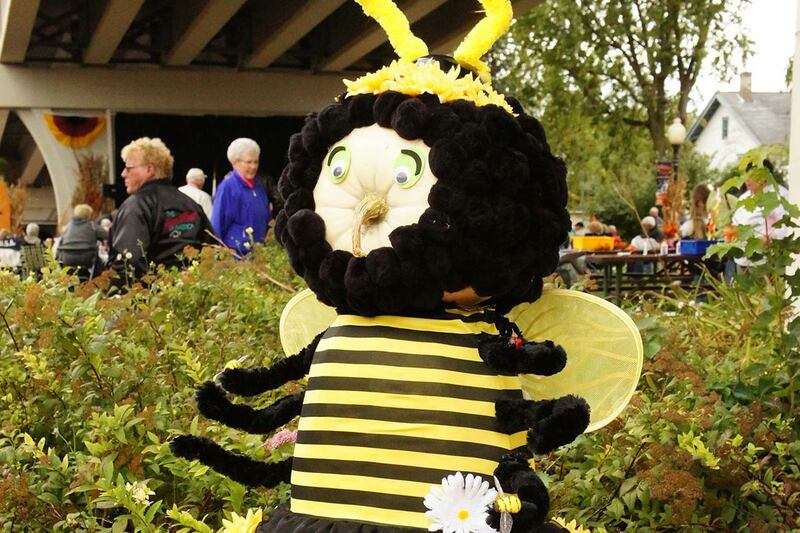 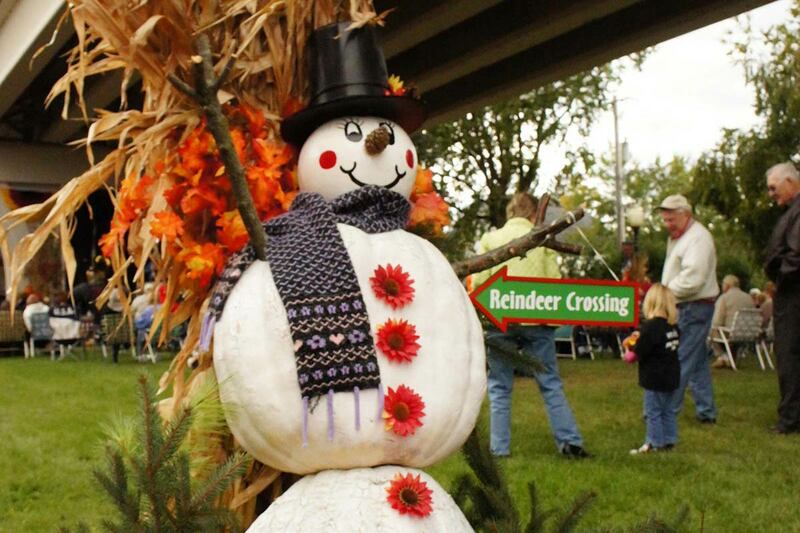 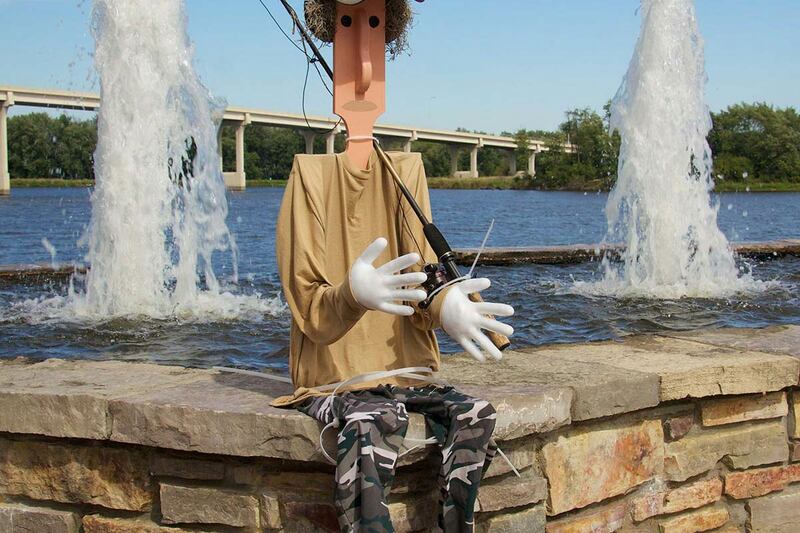 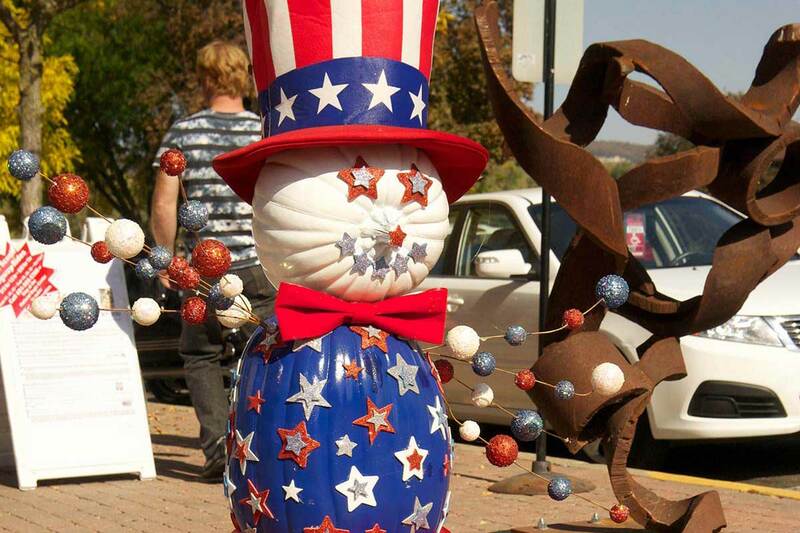 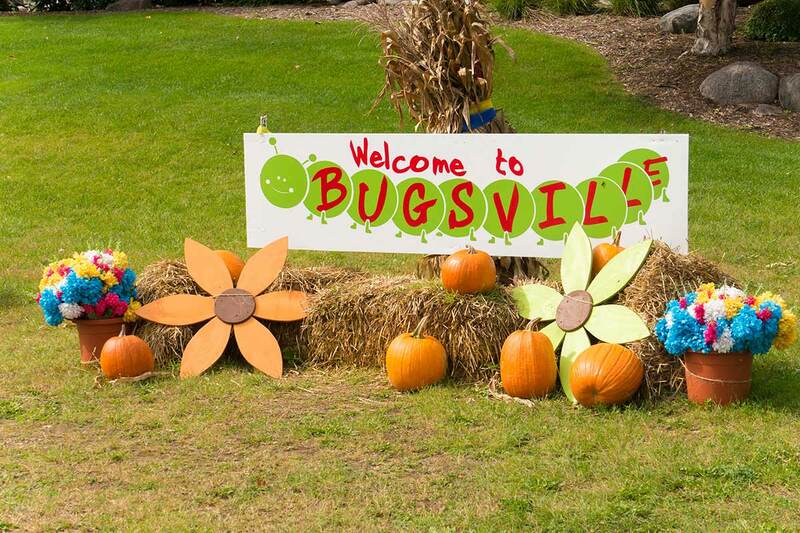 The wooden displays such as the smiling candy corn and friendly forest creatures are sights the community and visitors alike have come to look forward to every year, and all hand painted by dedicated women in the community. 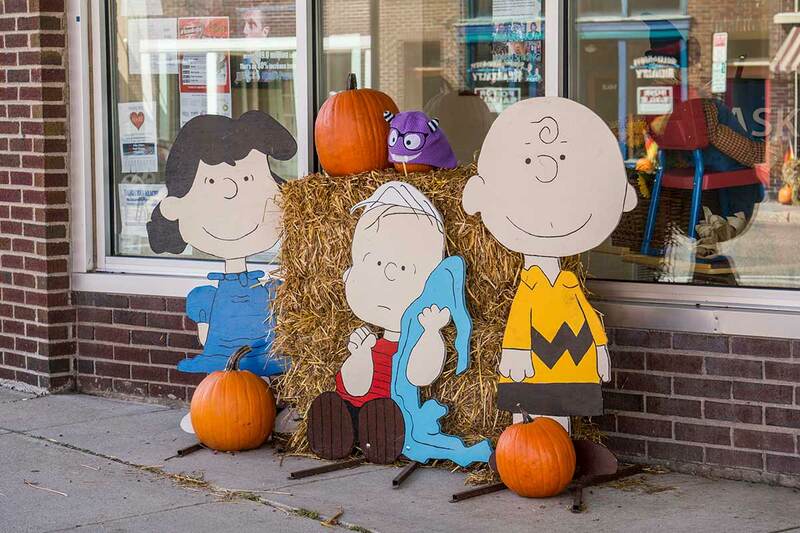 Need a tip for your own display next year? 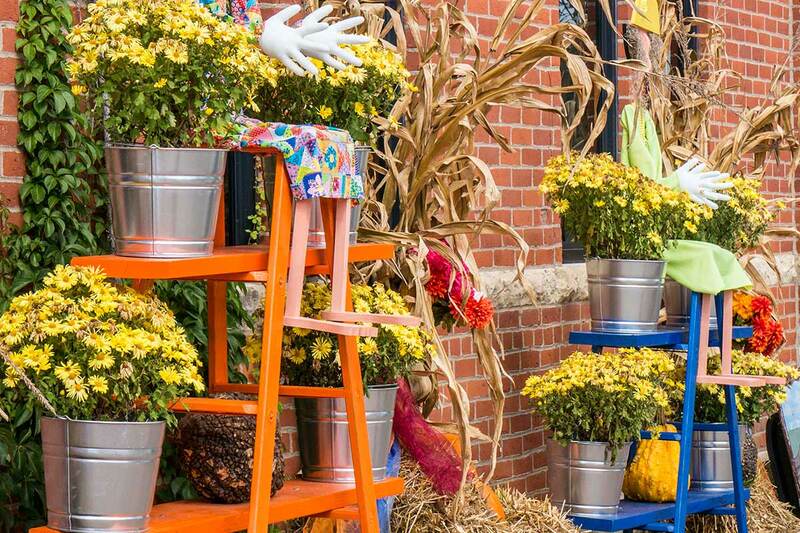 Use polyurethane paint to ensure a vibrant and long lasting color. 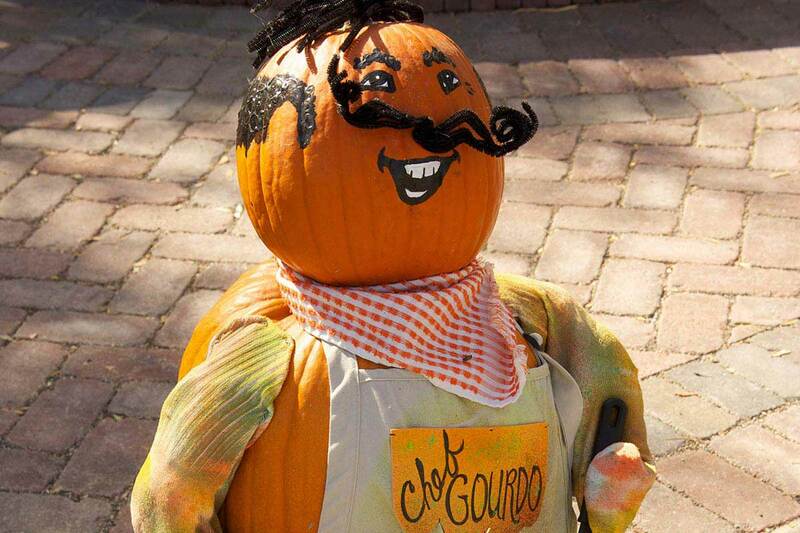 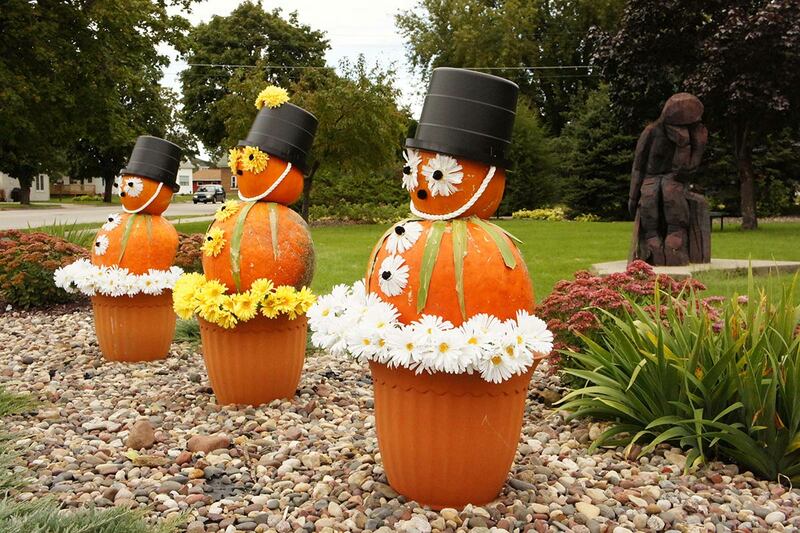 When it comes to the annual pumpkin displays, every year is a little different. 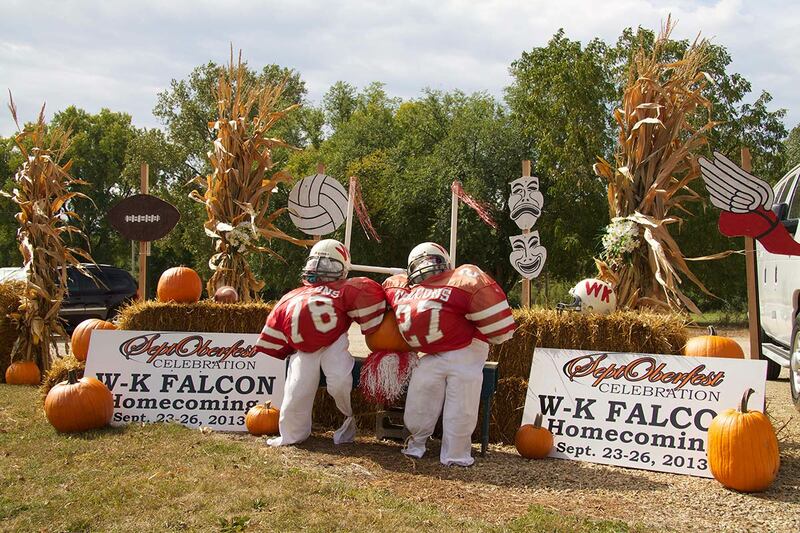 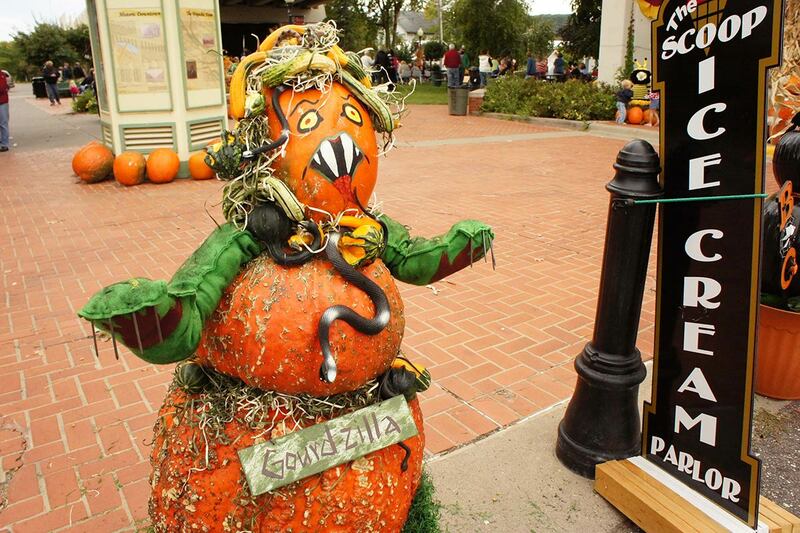 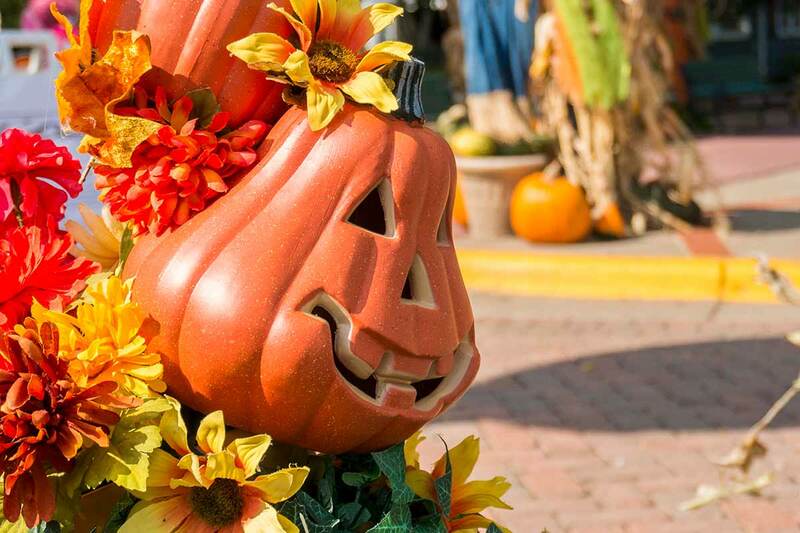 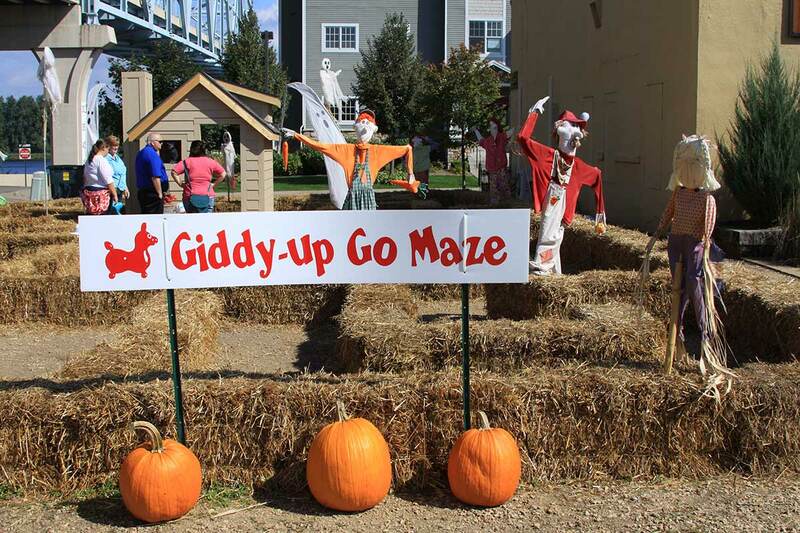 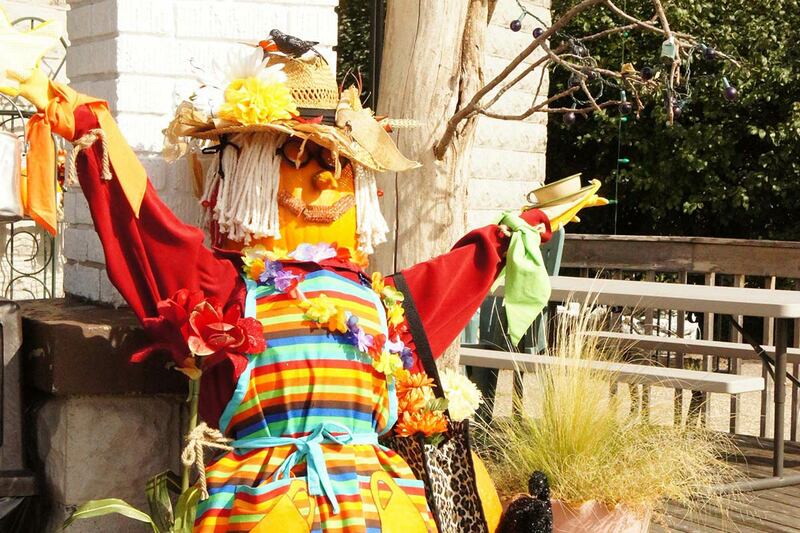 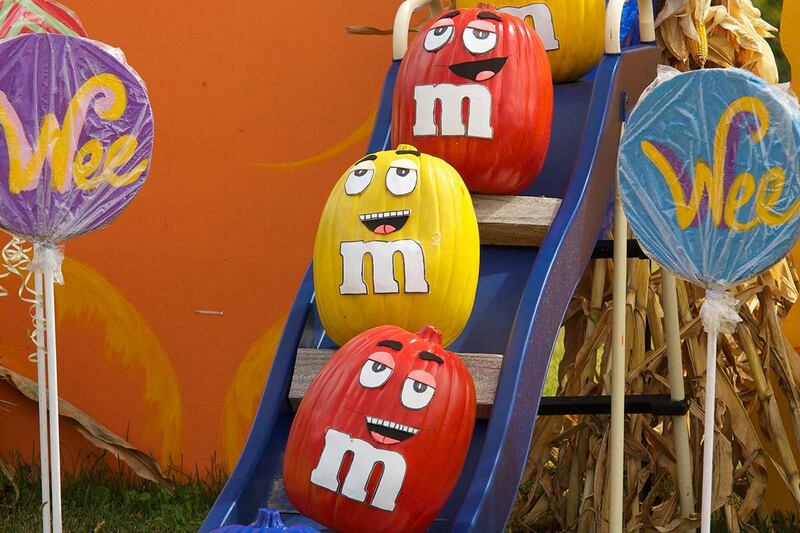 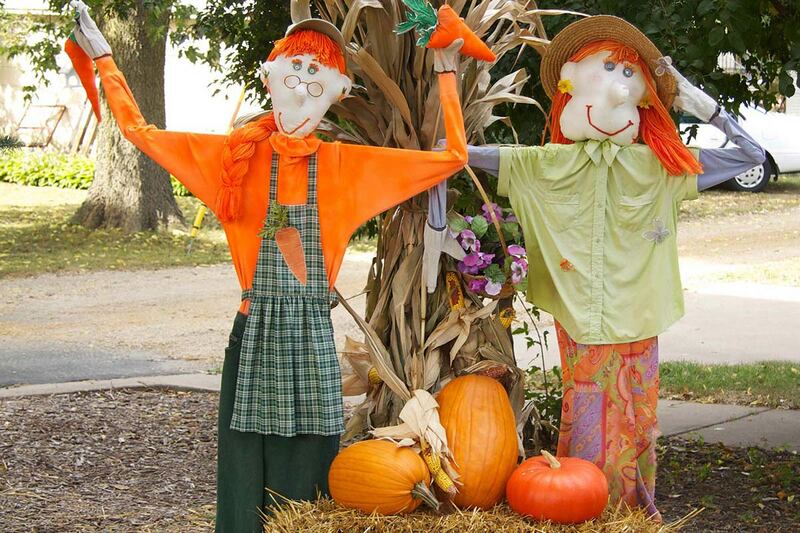 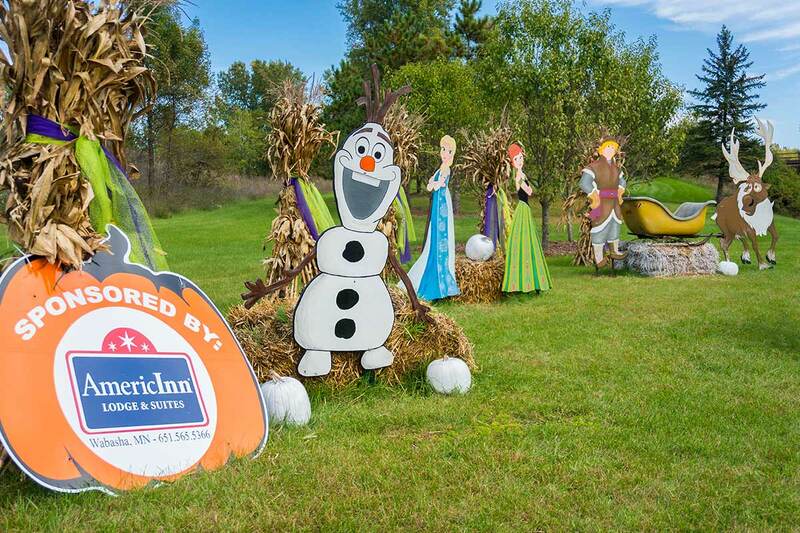 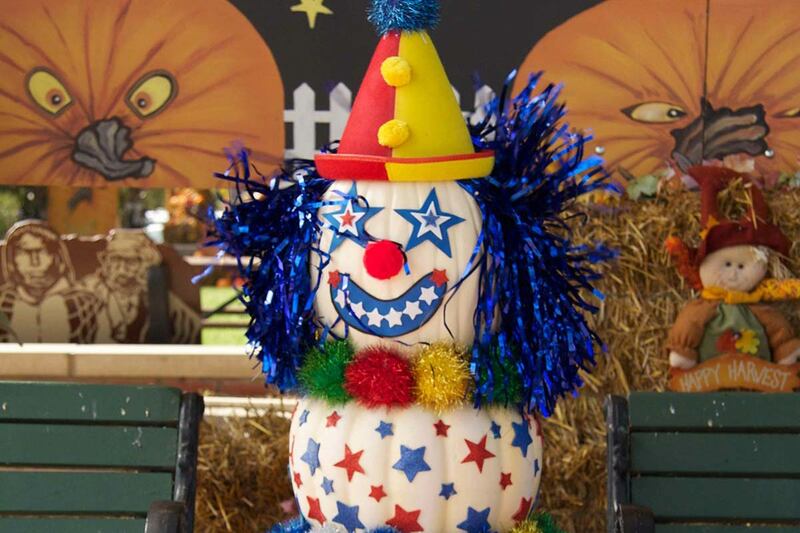 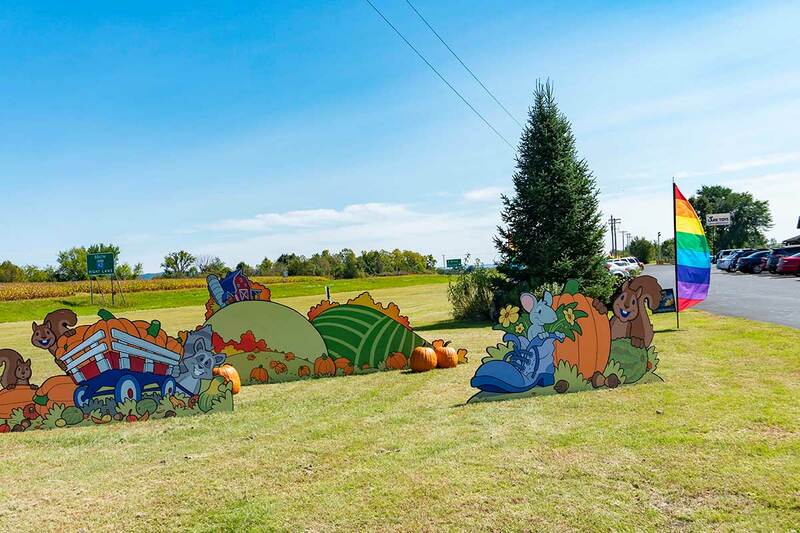 While some non degradable pieces have made several appearances throughout the years, over 3000 organic pumpkins and 5000 cornstalks, straw bales, squash, gourds, and scarecrows are used every year to create the unique displays. 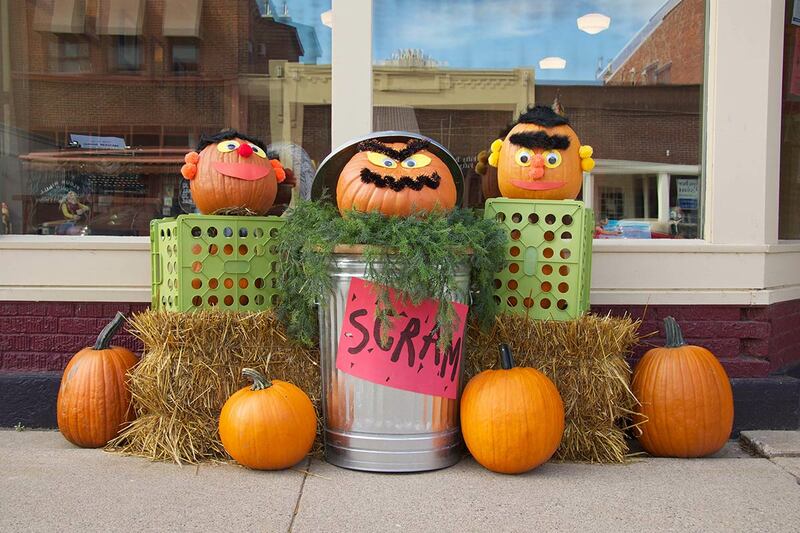 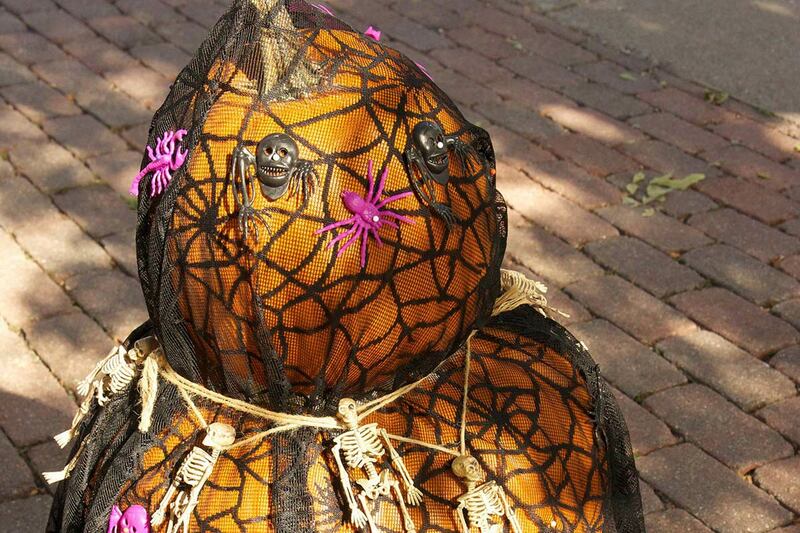 For many in the community, recycled materials make the best decorations. 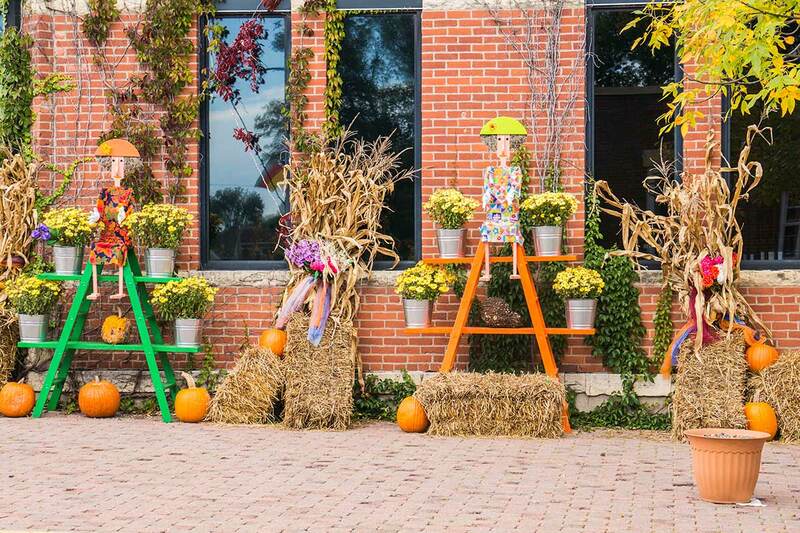 Look closely at these displays throughout the years to find everyday items used in very creative ways! 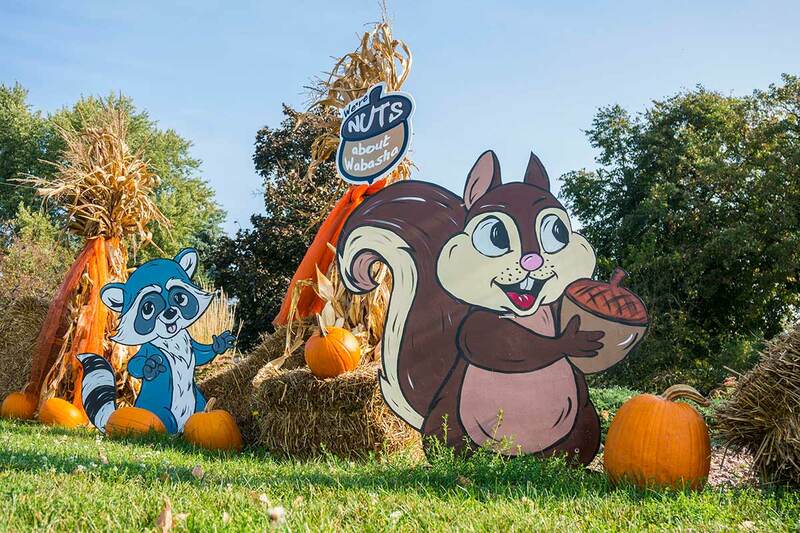 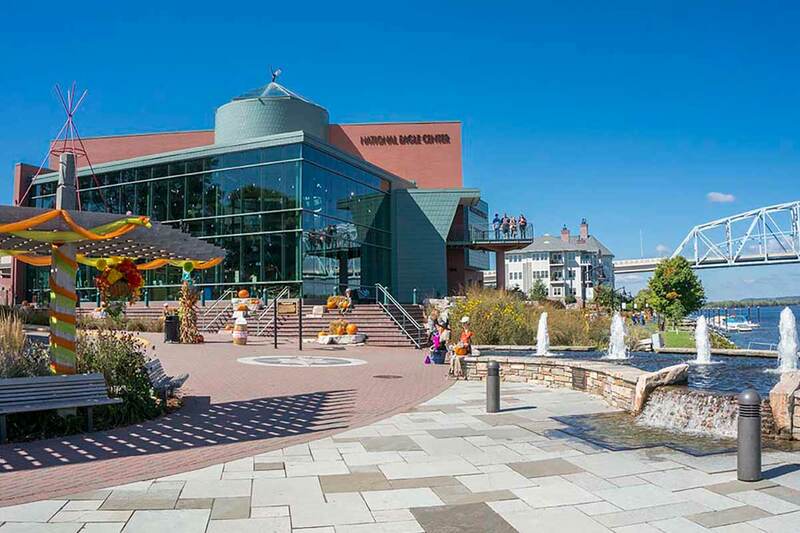 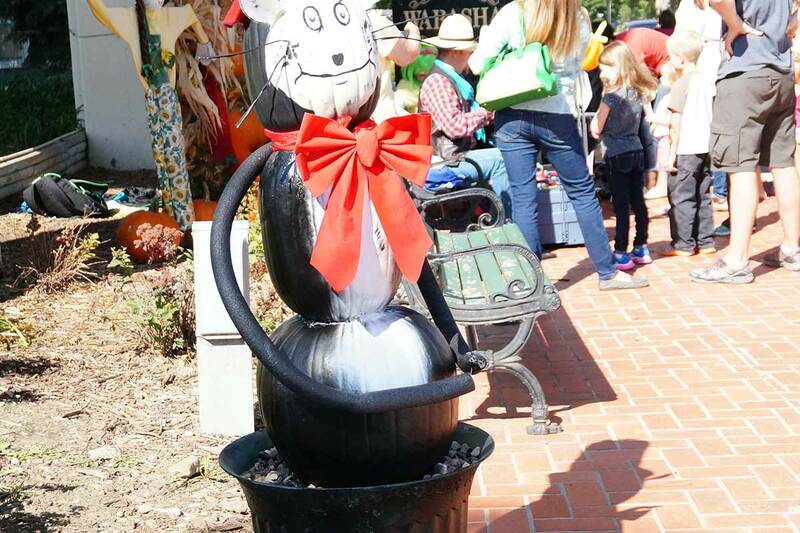 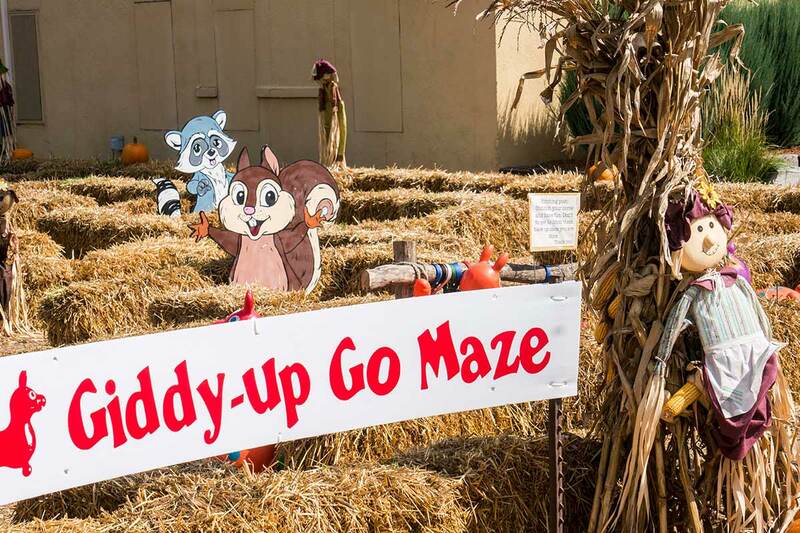 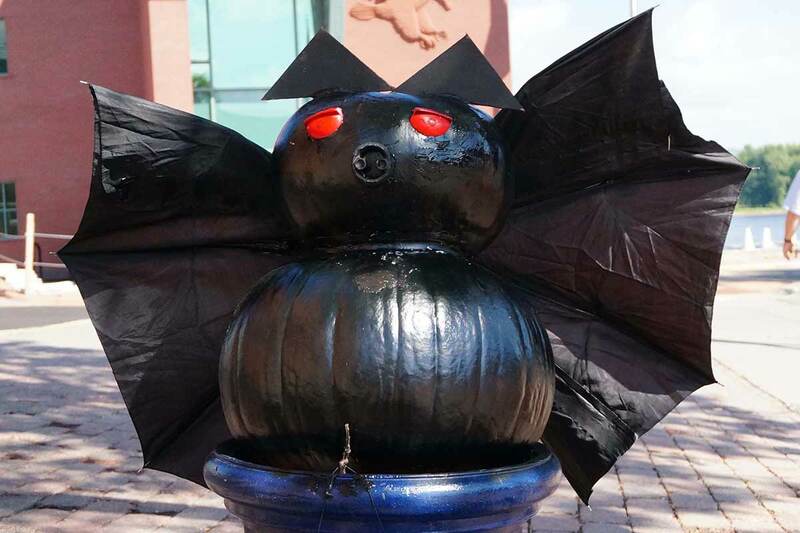 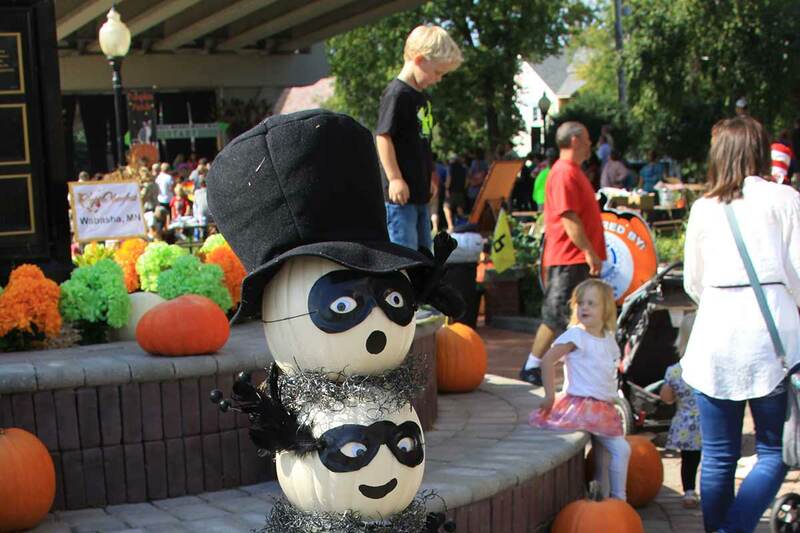 Every year, these exciting displays take over the town and visitors can explore the streets to discover displays transformed into friendly animals, spooky creatures, crazy designs, and so much more. 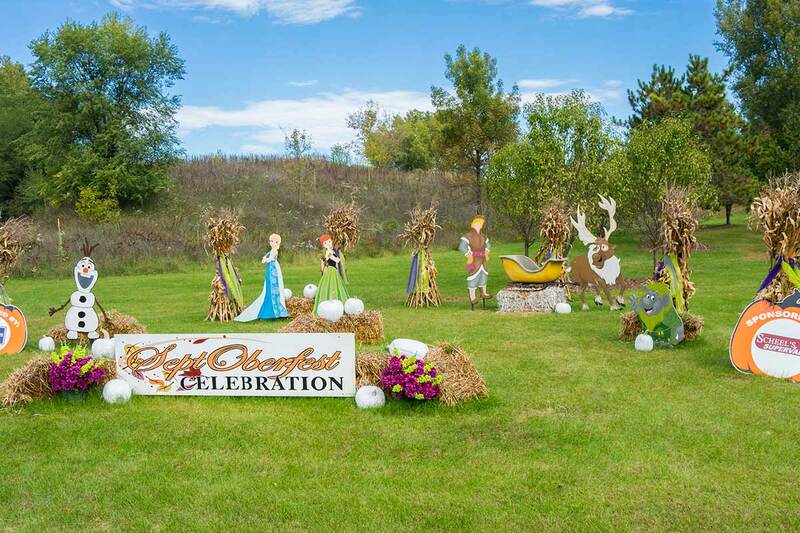 The best part is that every year means even more creative displays for everyone to enjoy! 2016 was filled with beloved characters from classics like Charlie Brown to children favorites including Elsa, Anna, and the infamous Angry Birds! 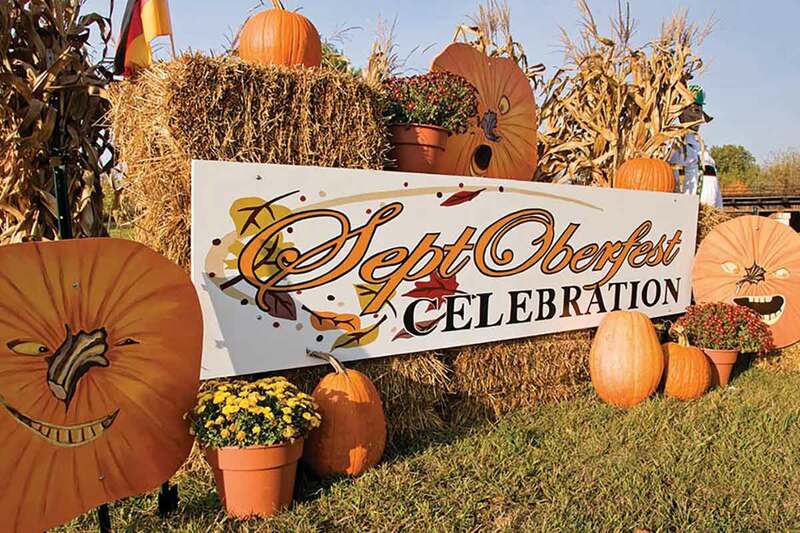 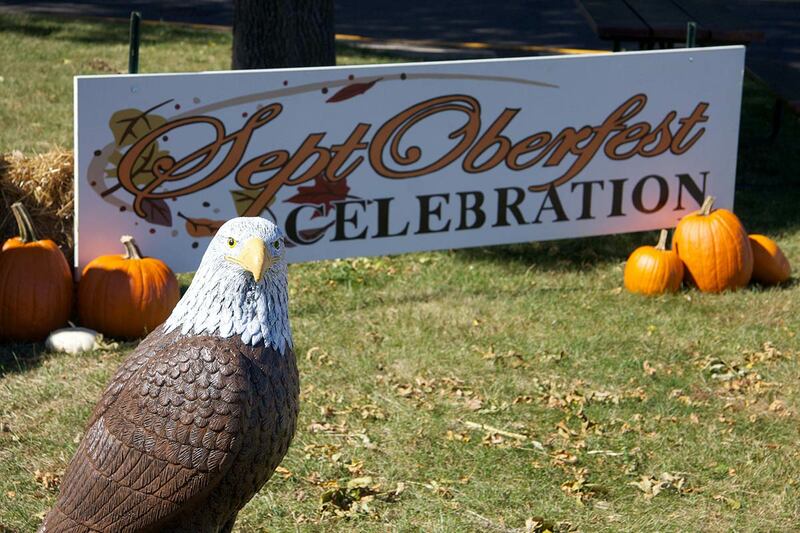 Over 60 volunteers in the Wabasha-Kellogg community help prepare the city for the annual SeptOberfest. 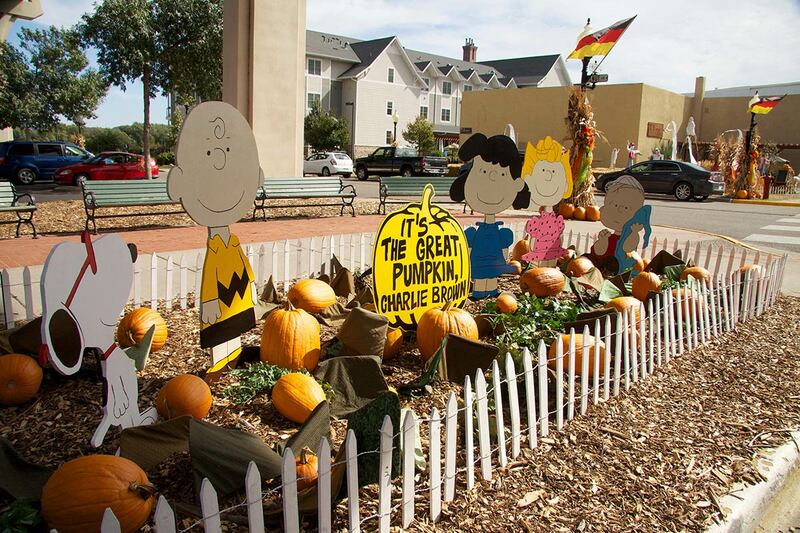 But where do the pumpkin displays come from? 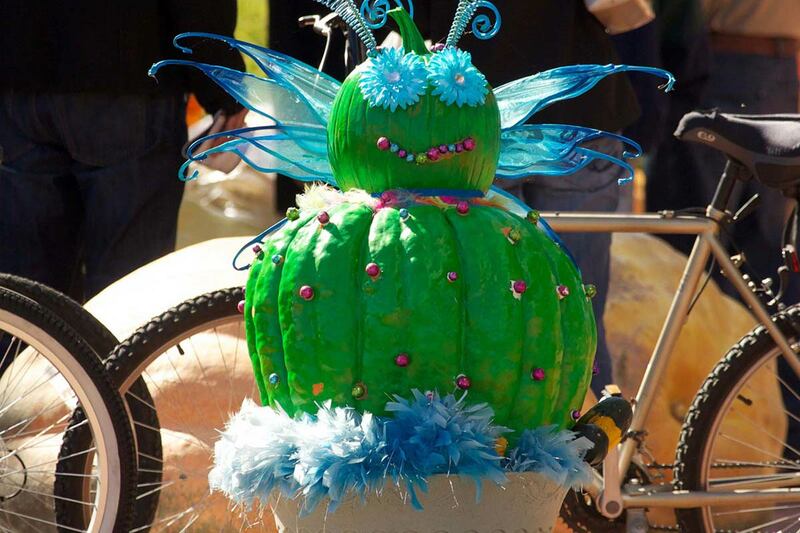 Artists, community members, and families alike spend the year gathering ideas for fun displays. 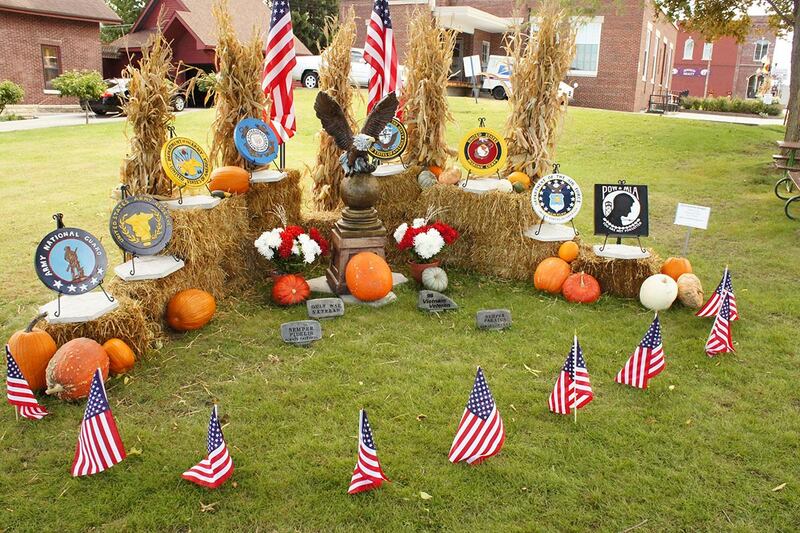 When the time comes to decorate the streets, anyone is welcome to create a display! 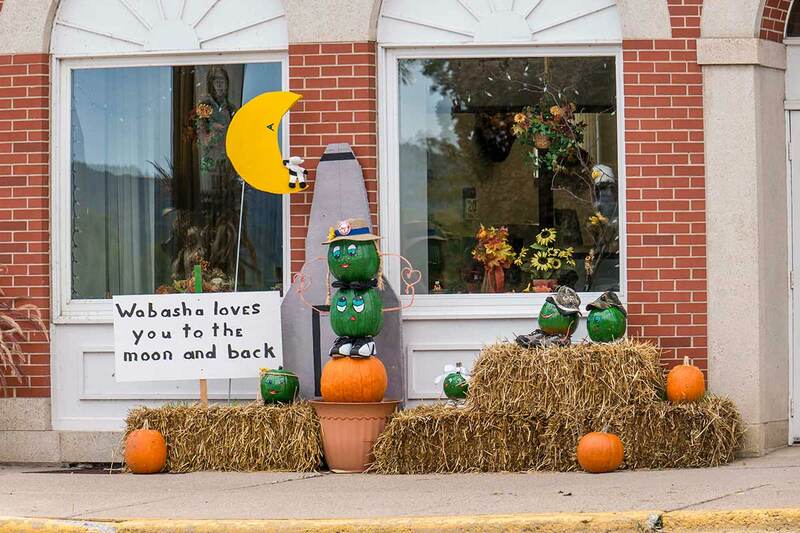 Each year, the Wabasha-Kellogg community tries to find new ways to make the pumpkin topiary displays even more exciting. 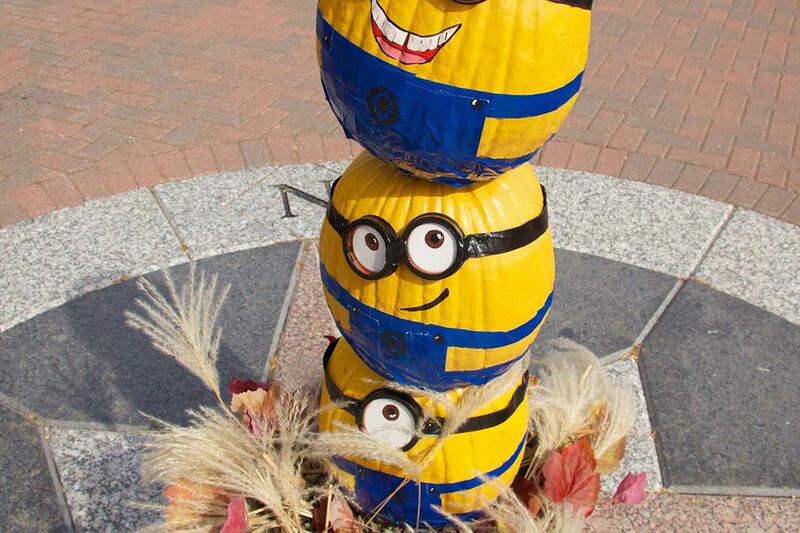 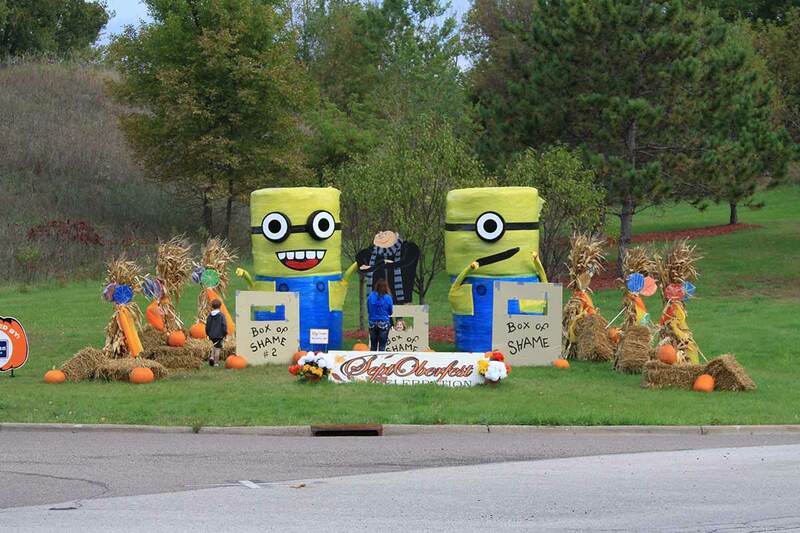 2014 was one of the first years the community began using stacked hay bales to creates larger than life characters such as the memorable Despicable Me display with the friendly Minions! 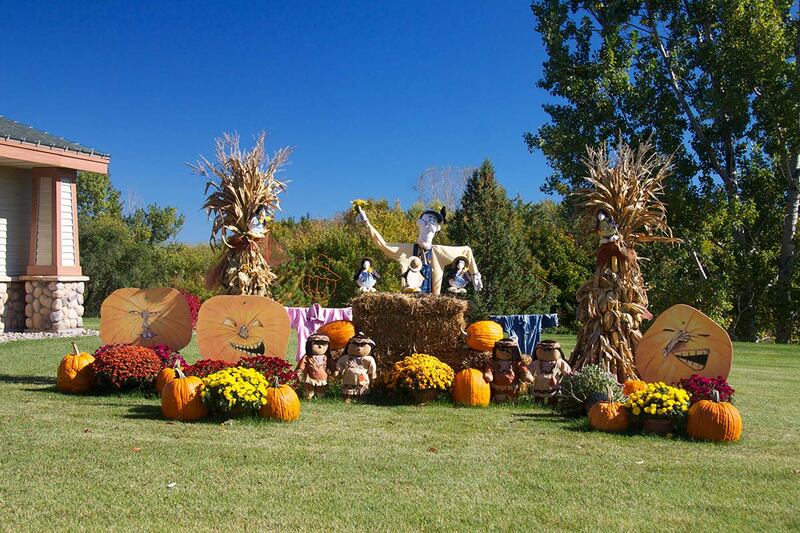 The idea to stack hay bales came from a local farmer, and every year since, onlookers can find at least one display that continues to use this technique. 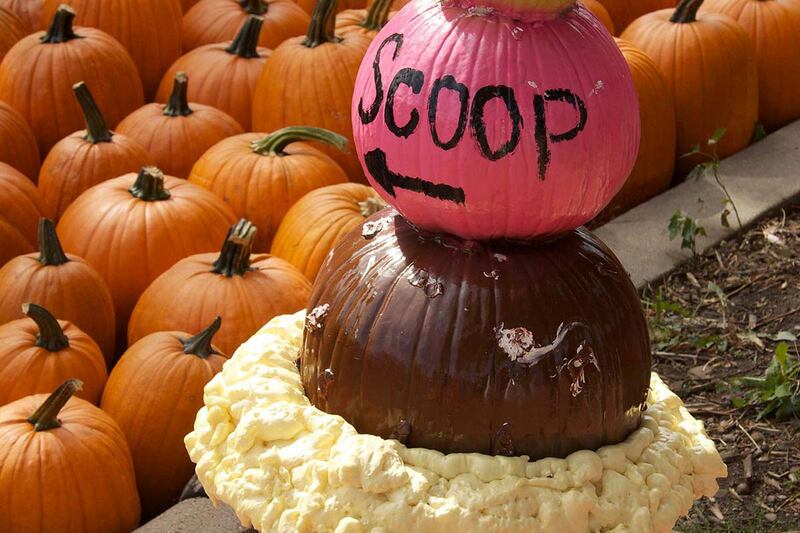 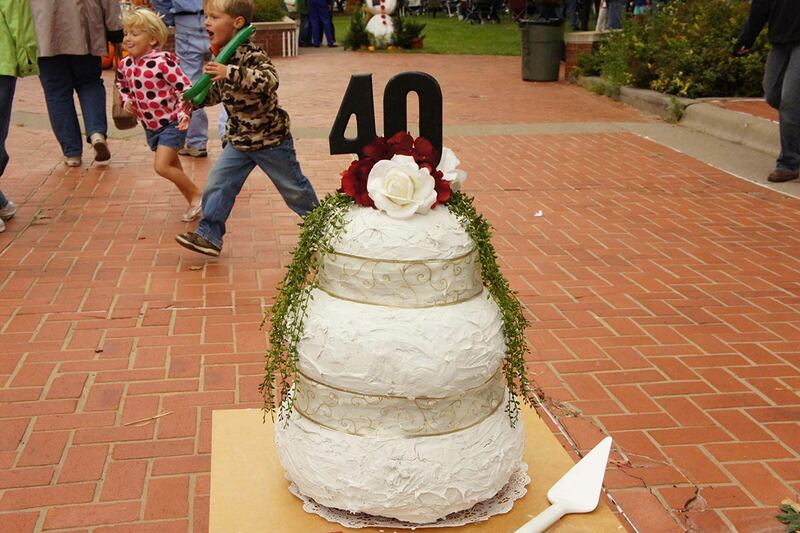 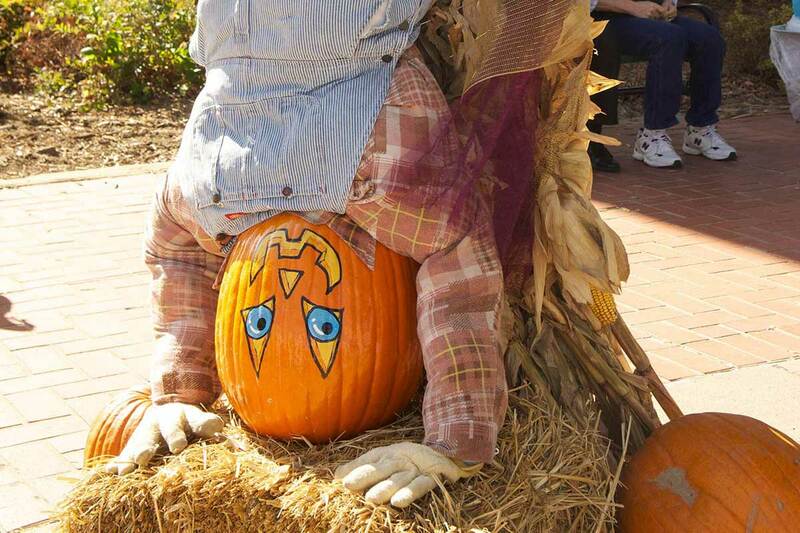 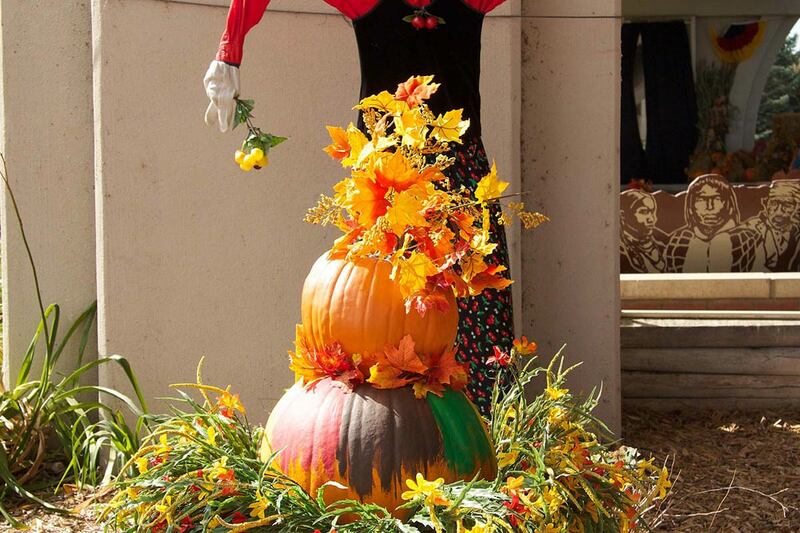 2013 was the year for gravity defying pumpkin displays. 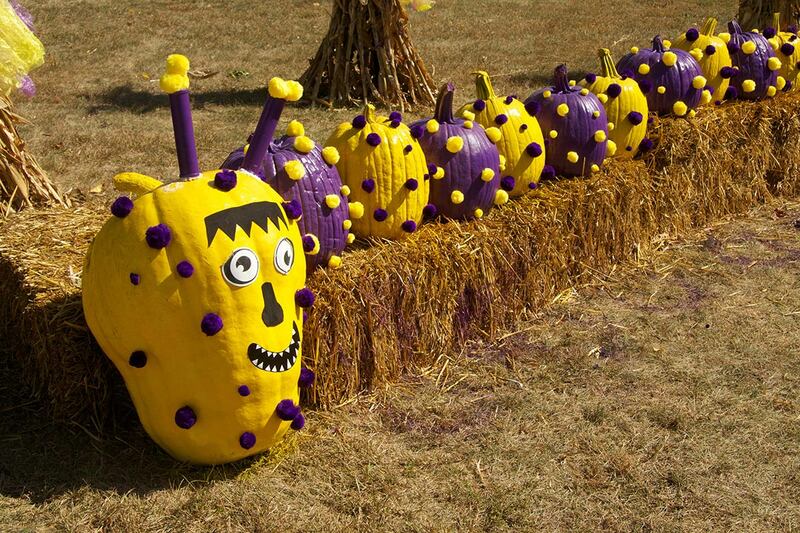 From playful Minions to a friendly caterpillar, the creativity was amazing! 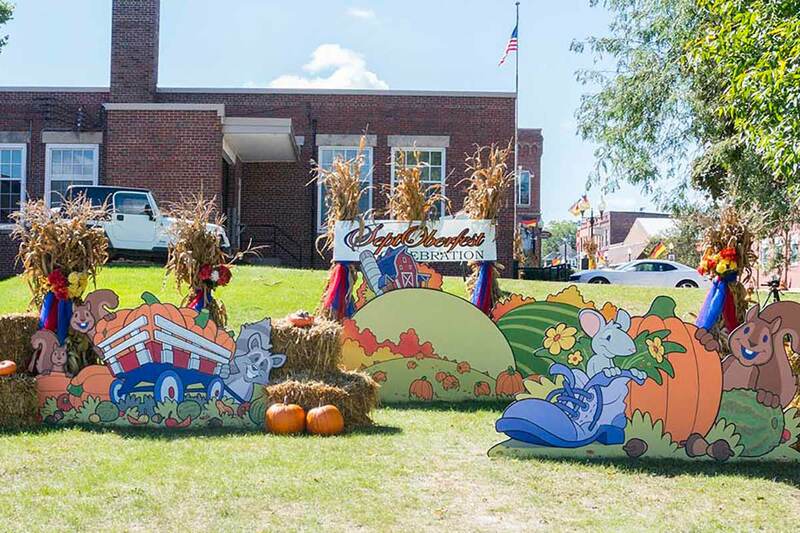 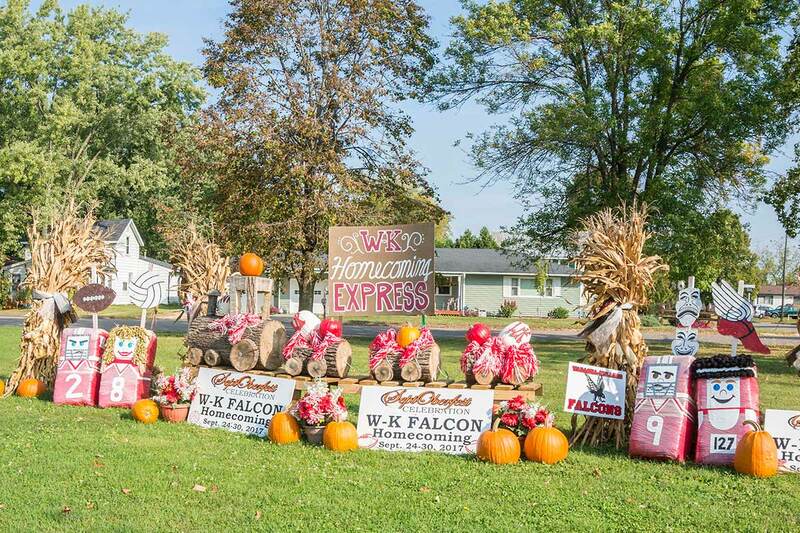 Like most years, many businesses took part in the fun with creative and colorful displays that represented their services in the community. 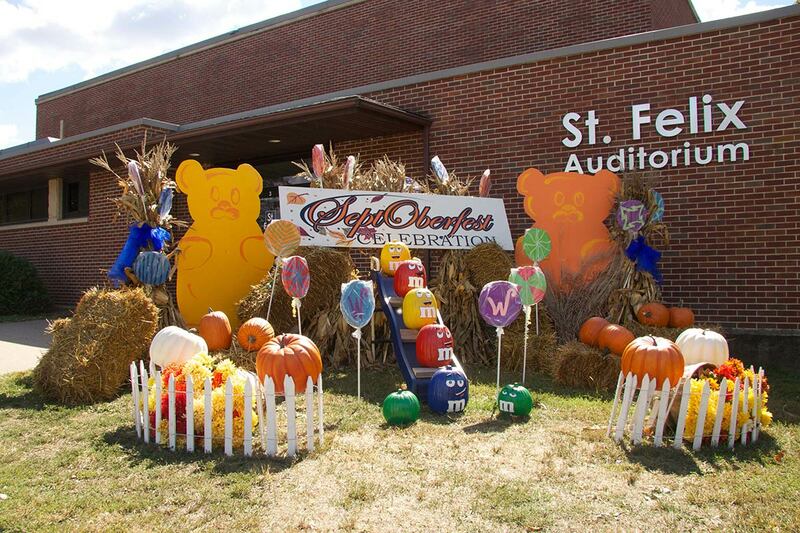 There was no shortage of creativity that year from the community members who created the displays! 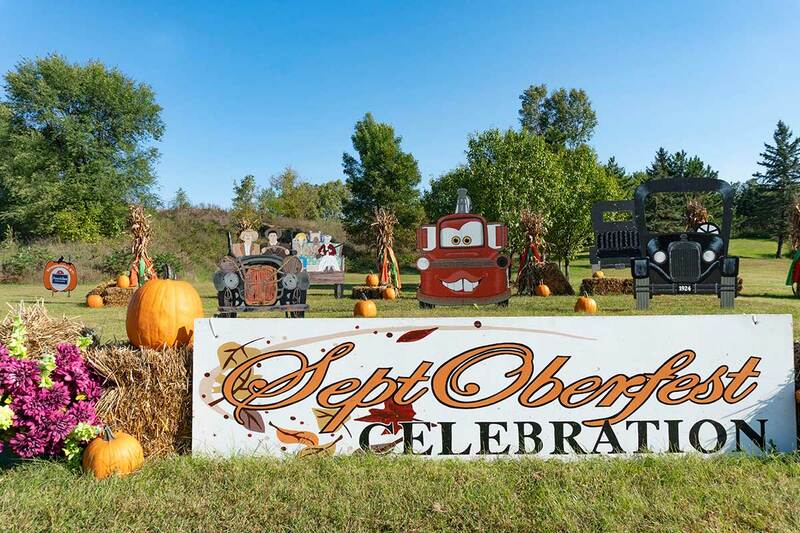 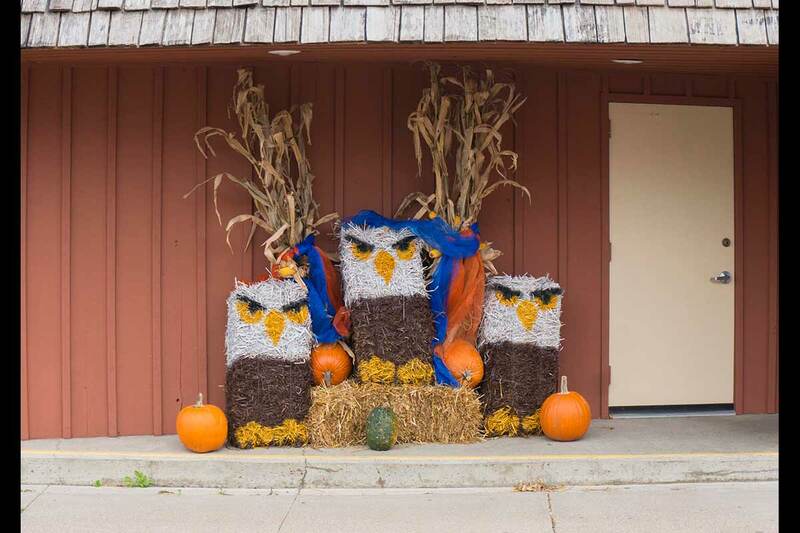 When asked how she comes up with themes for her displays, local community member and SeptOberfest council member, Shary Meuer explained that inspiration can come from the simplest things. 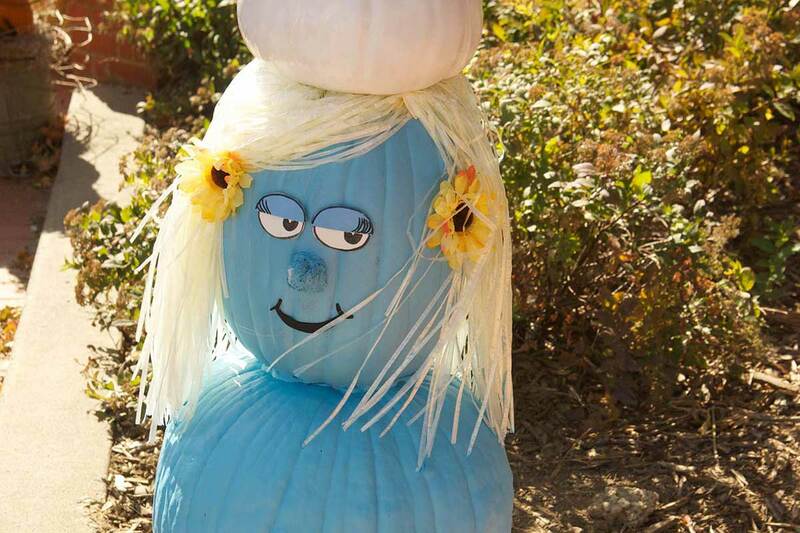 Pommes grass she found along the side of the road once transformed into the pigtails of an adorable pumpkin girl, while an elongated gourd with a fat bottom had a handle glued onto it and became a coffee pot! 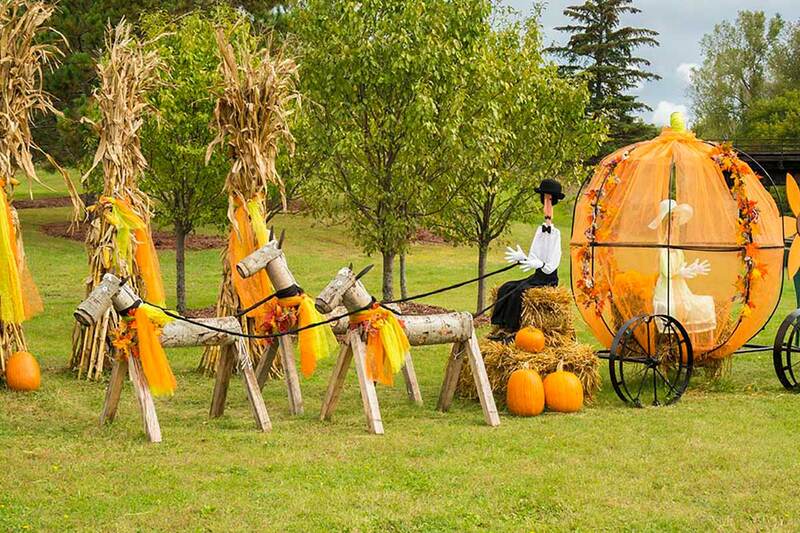 With a little imagination, anything is possible! 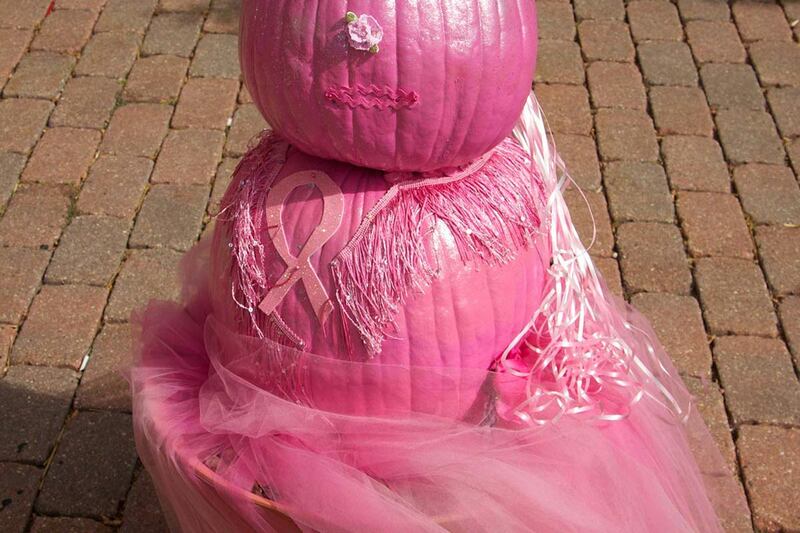 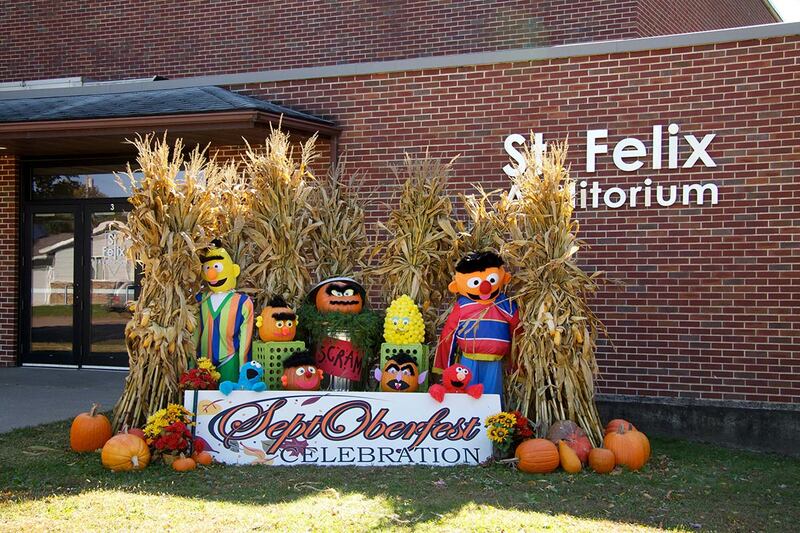 One of the most exciting part of the annual pumpkin displays is the community involvement and friendly competition! 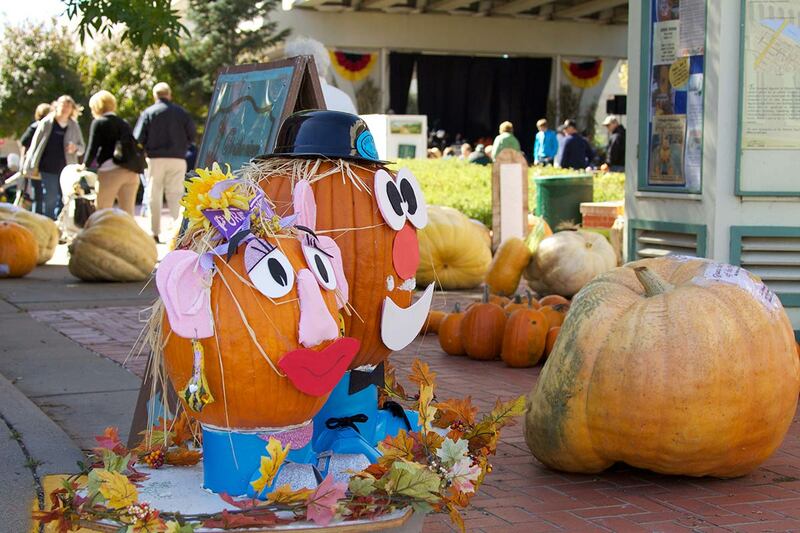 At the end of every SeptOberfest, the pumpkin displays are judged for creativity and unique designs. 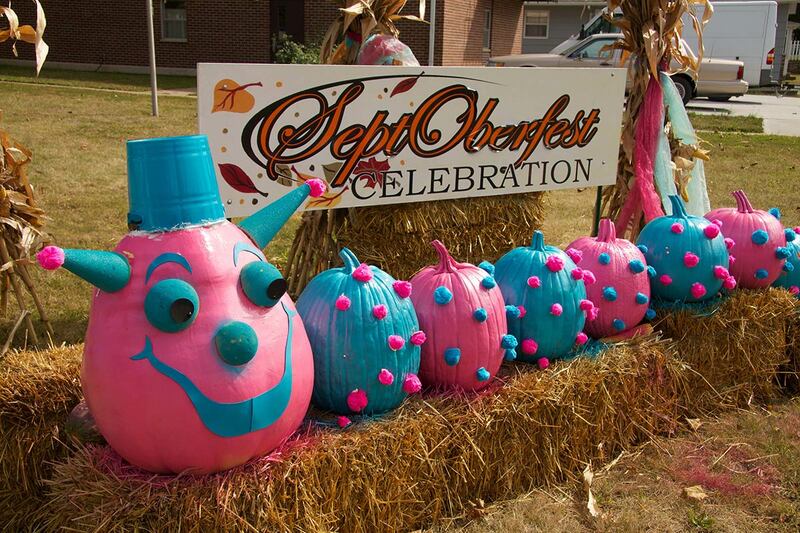 It is a fun incentive for artists to try new ideas every year! 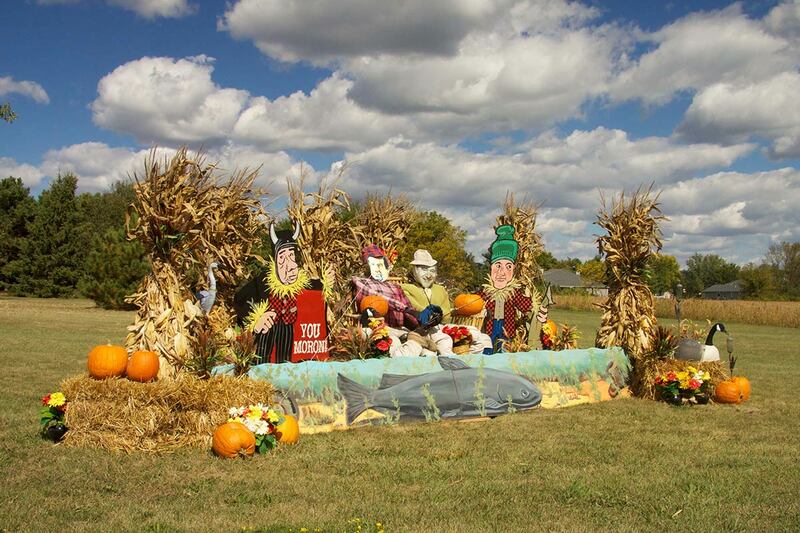 2010 marked the second year of the topiary display, and the community was really beginning to fall in love with the idea. 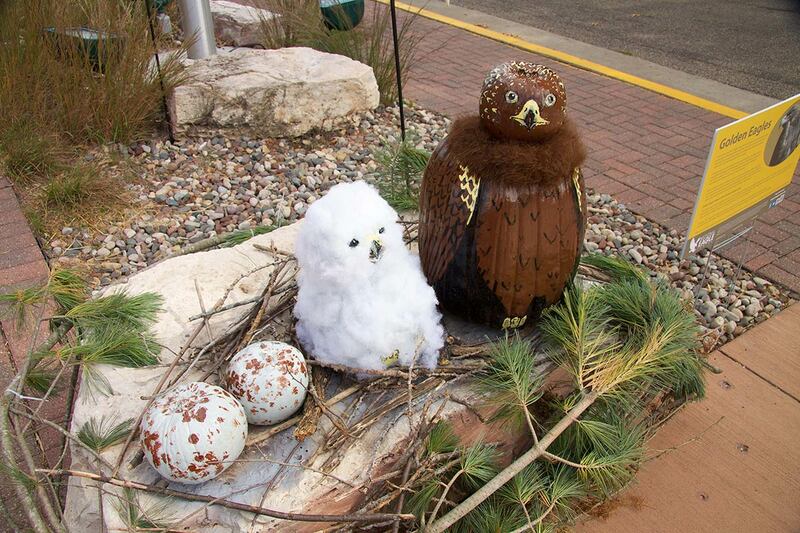 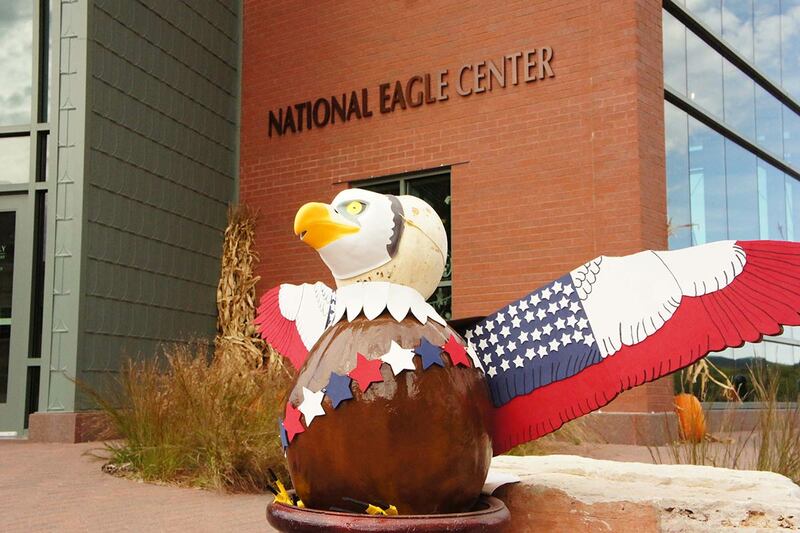 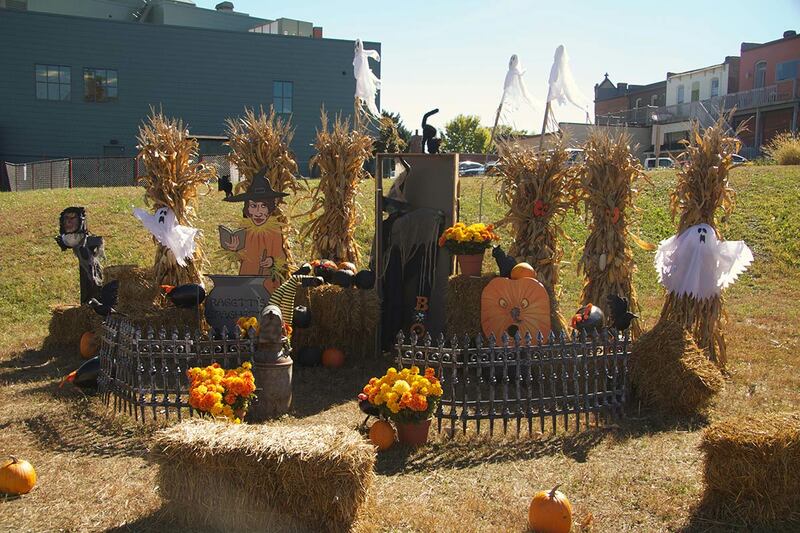 As the fun activity gained momentum, more and more people began creating displays for the community and visitors to enjoy. 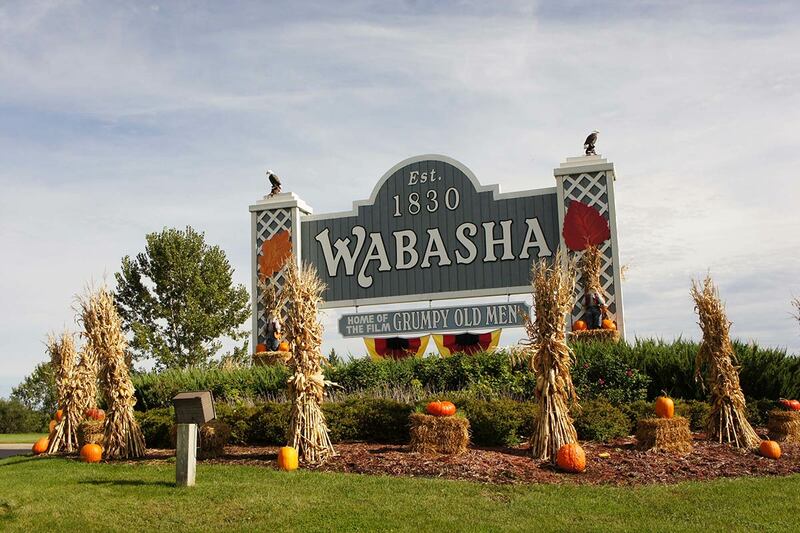 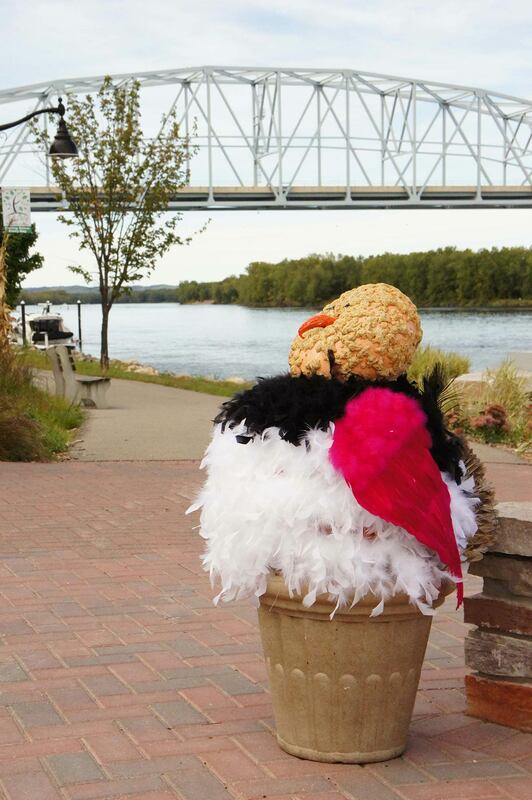 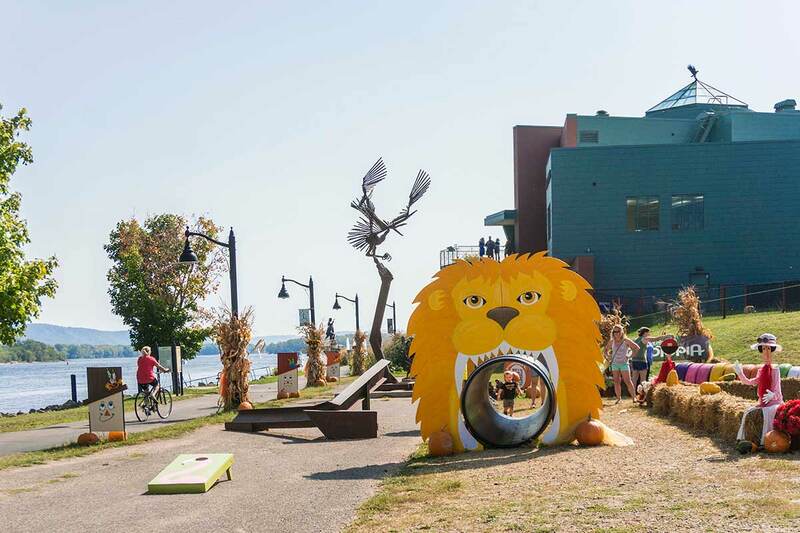 It has been a great way to color and creativity to the Wabasha area for many years. 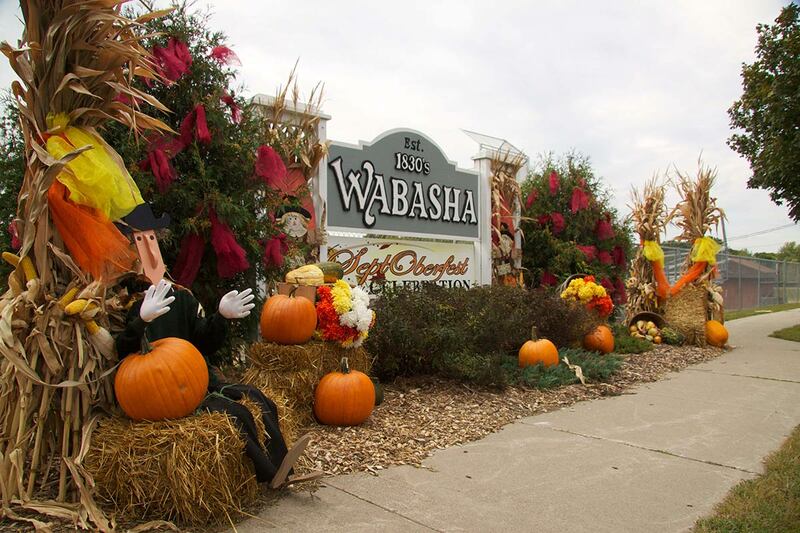 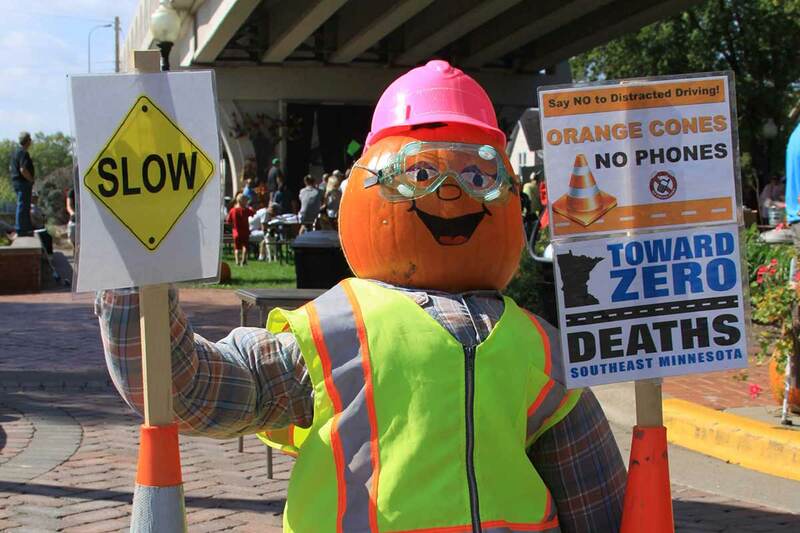 In 2009 when the first pumpkin displays were set up in Wabasha, nobody knew that this tradition would take over the hearts of the community. 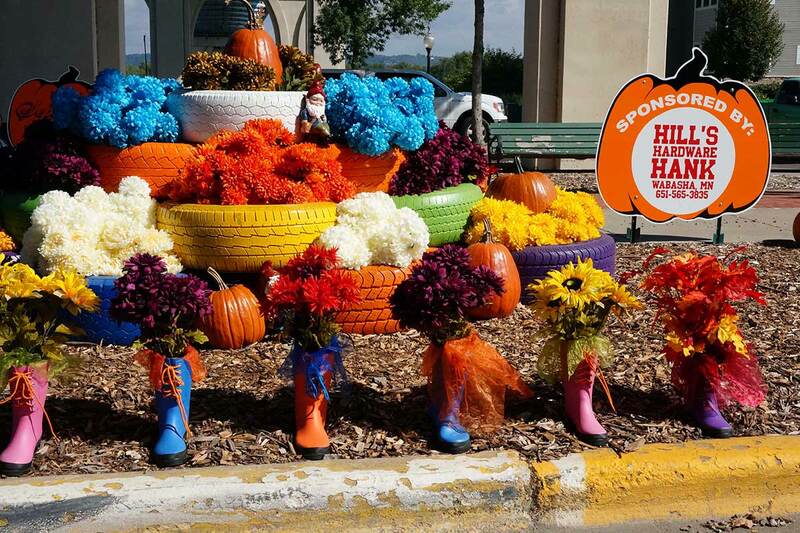 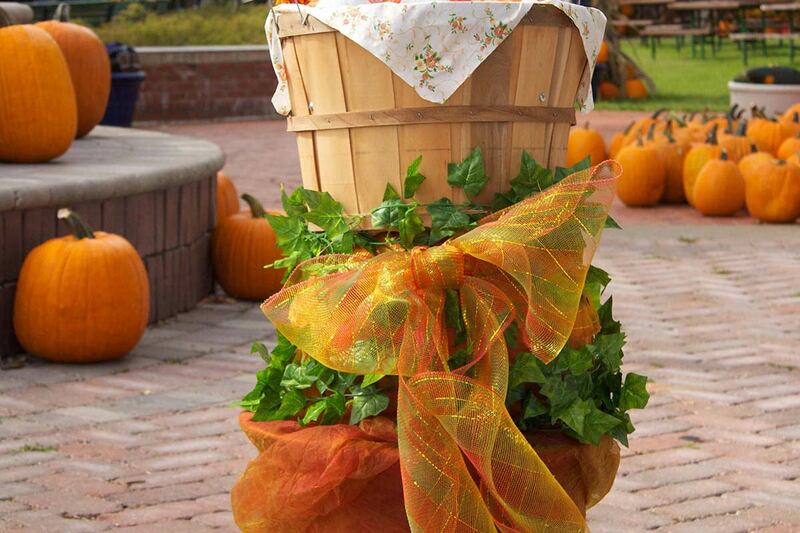 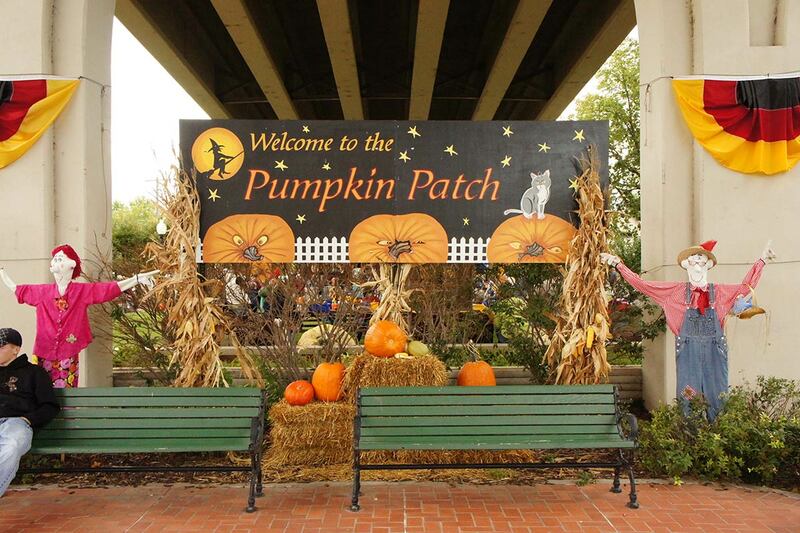 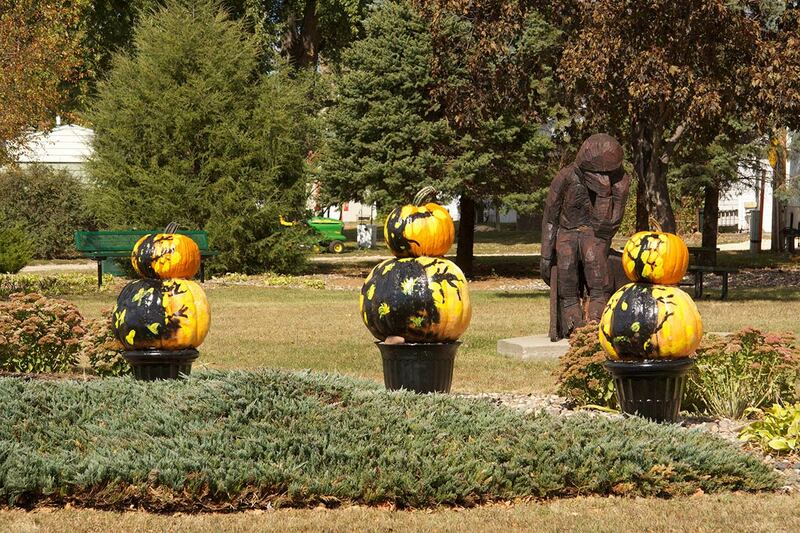 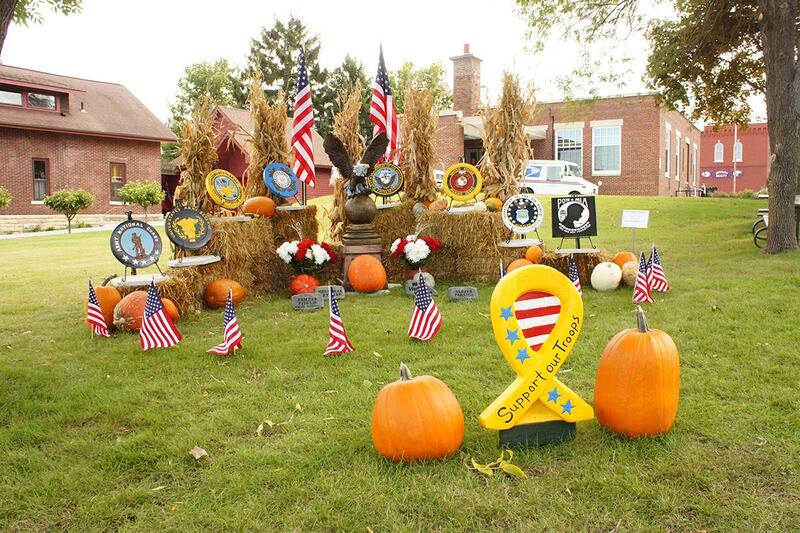 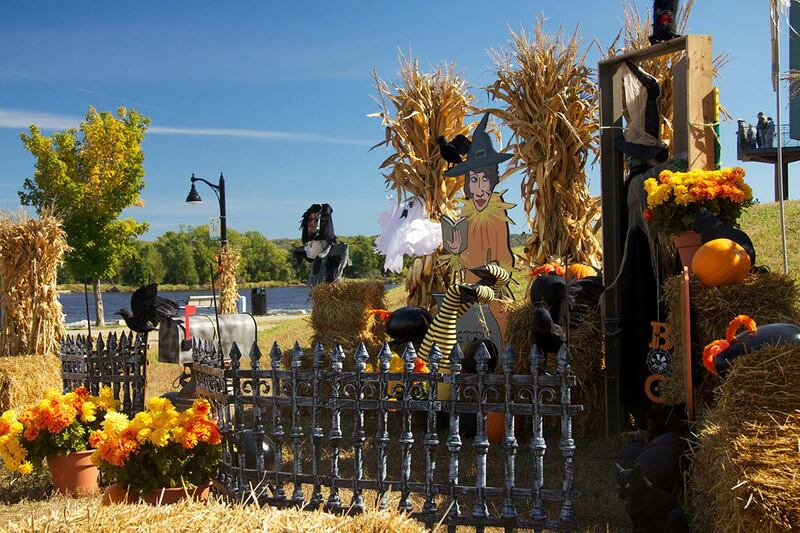 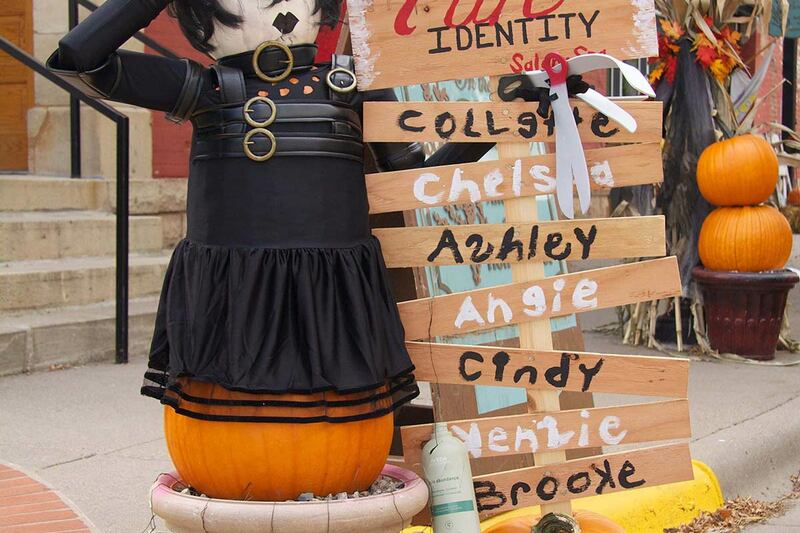 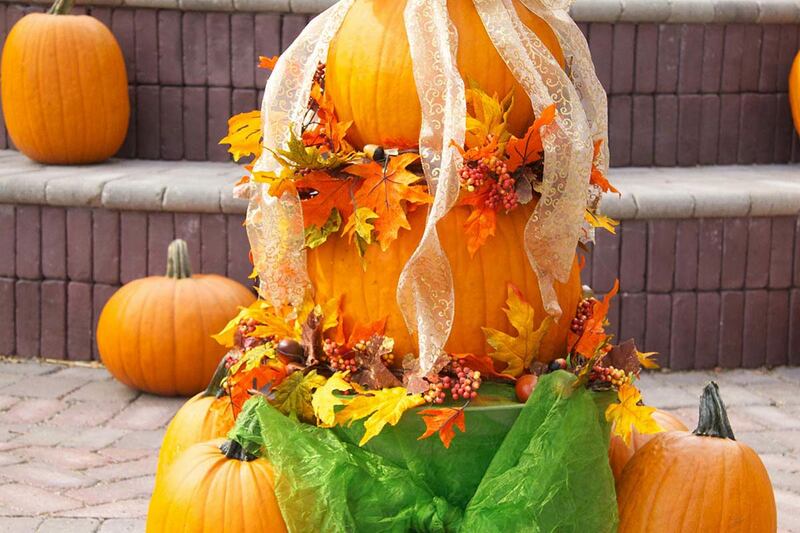 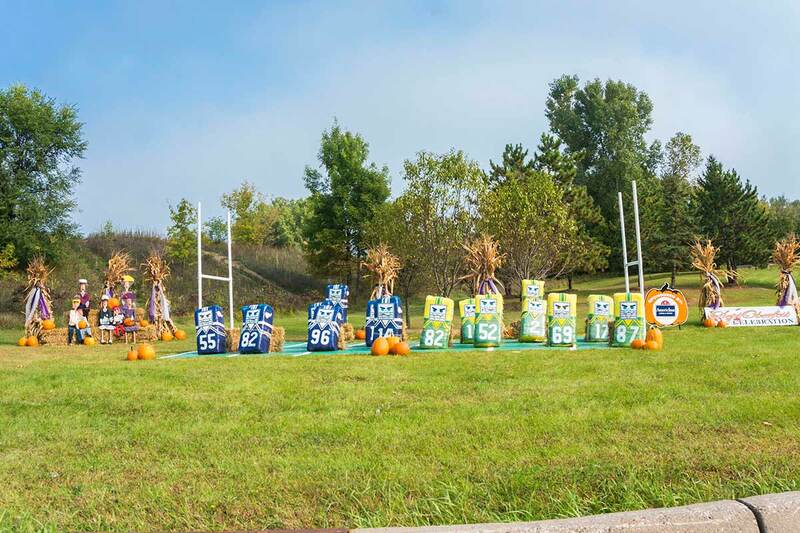 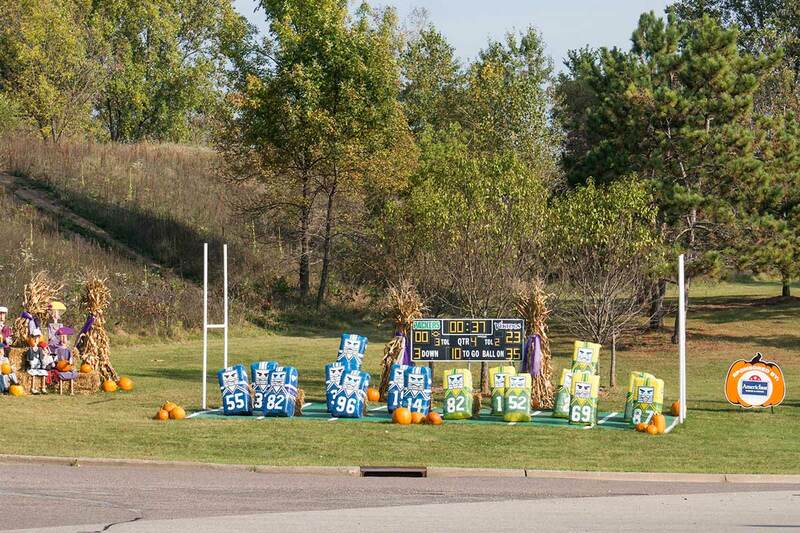 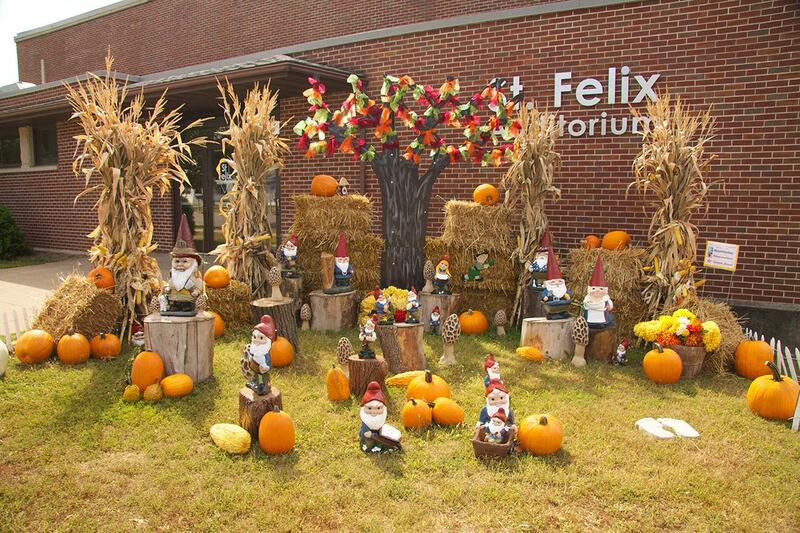 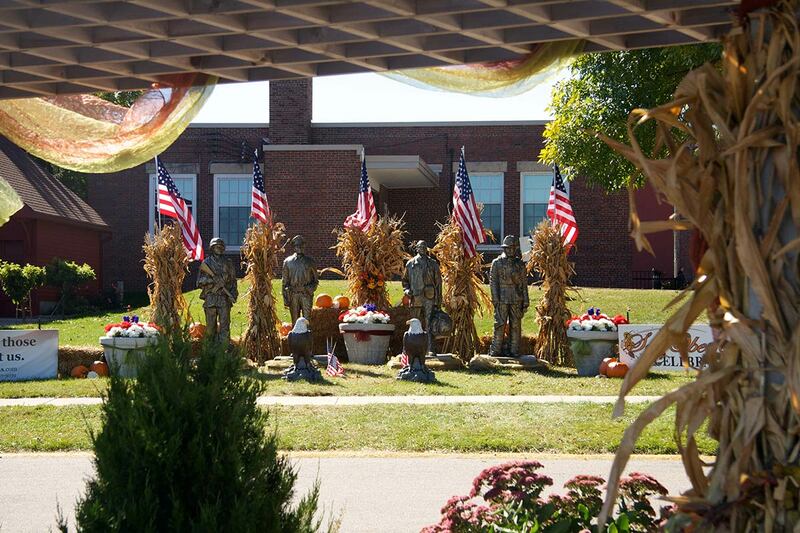 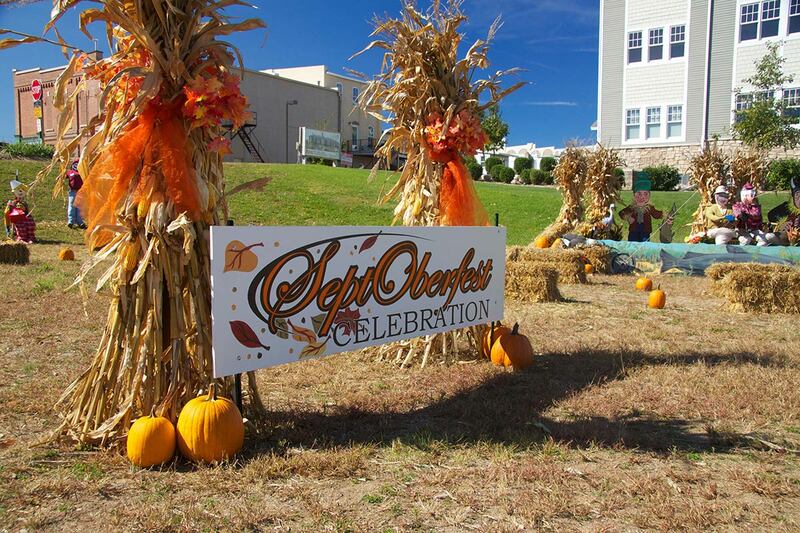 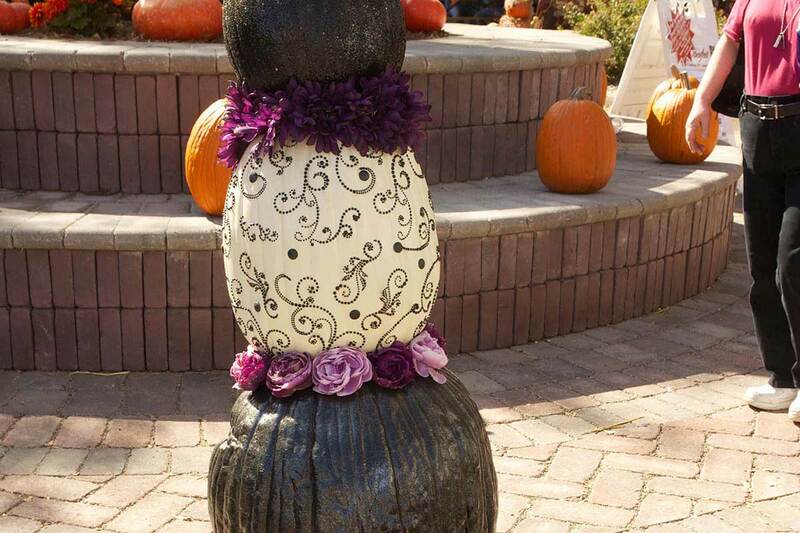 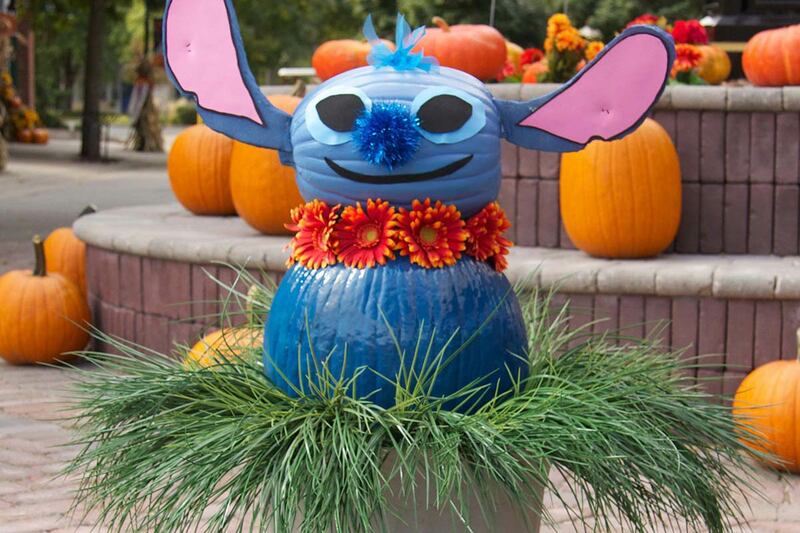 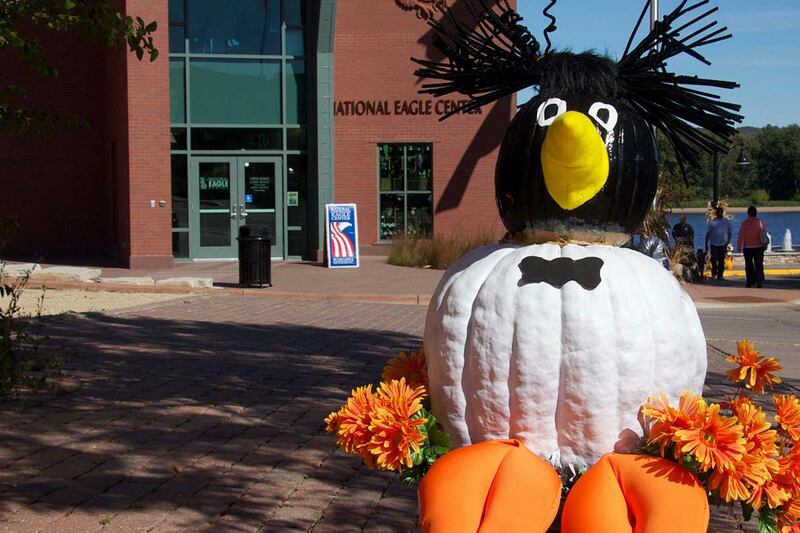 The displays began as an assortment of pumpkin topiaries that were created to celebrate the life of the community! 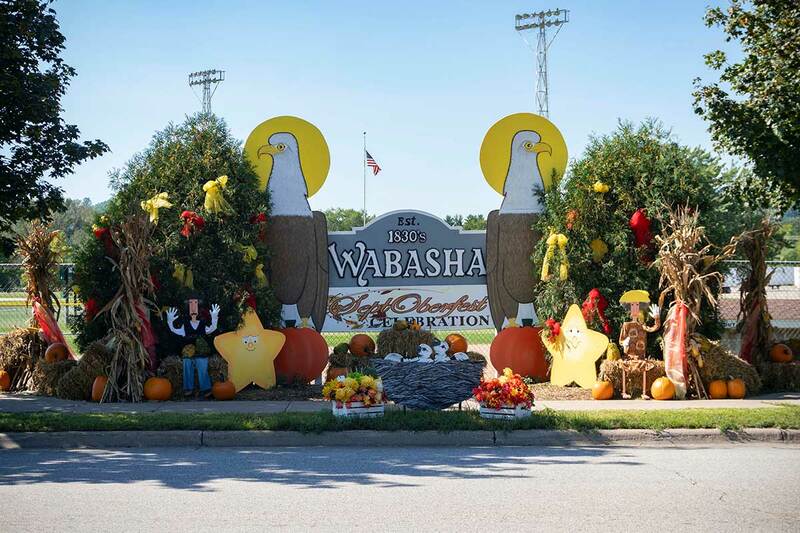 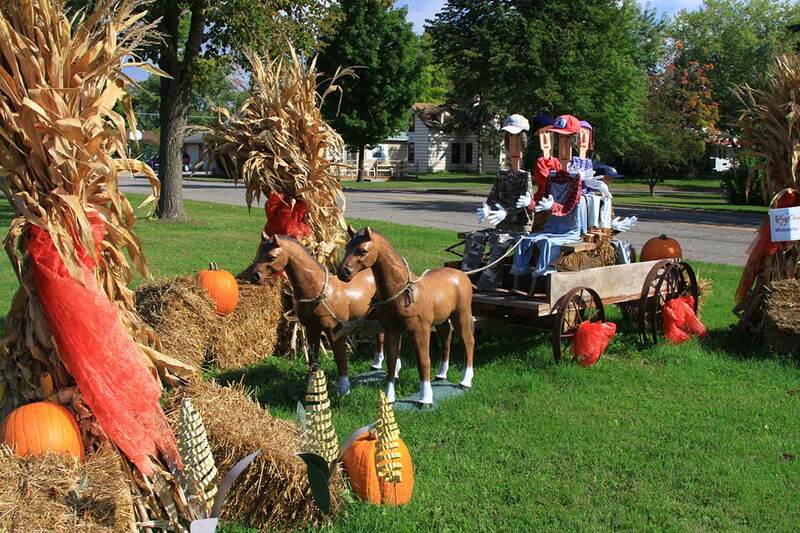 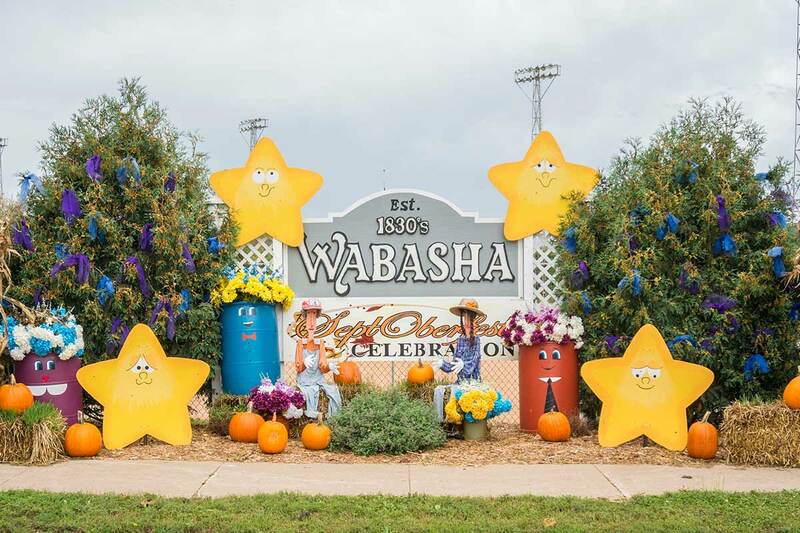 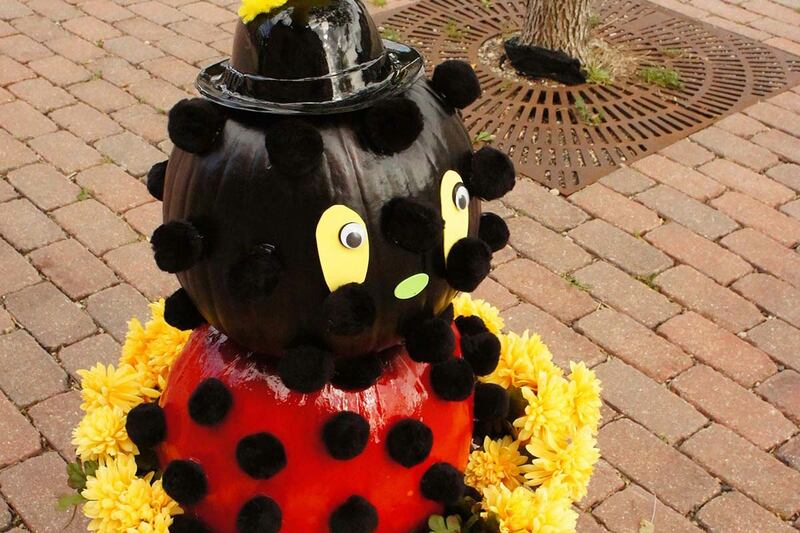 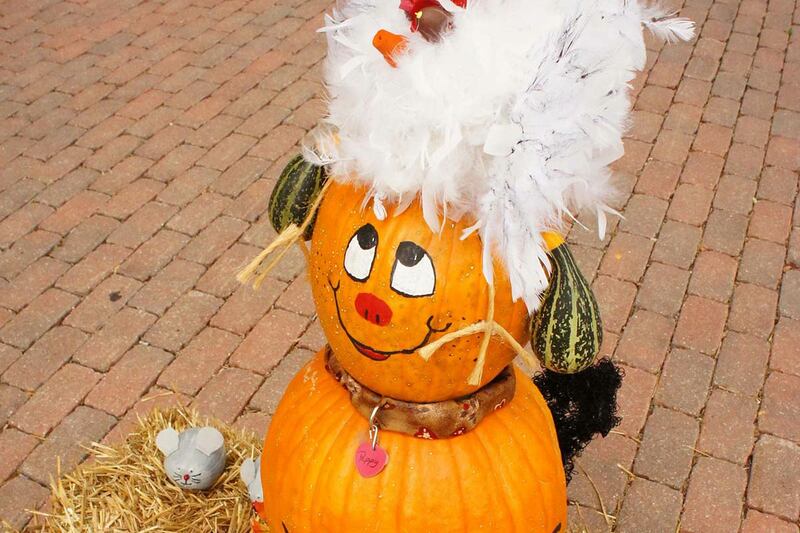 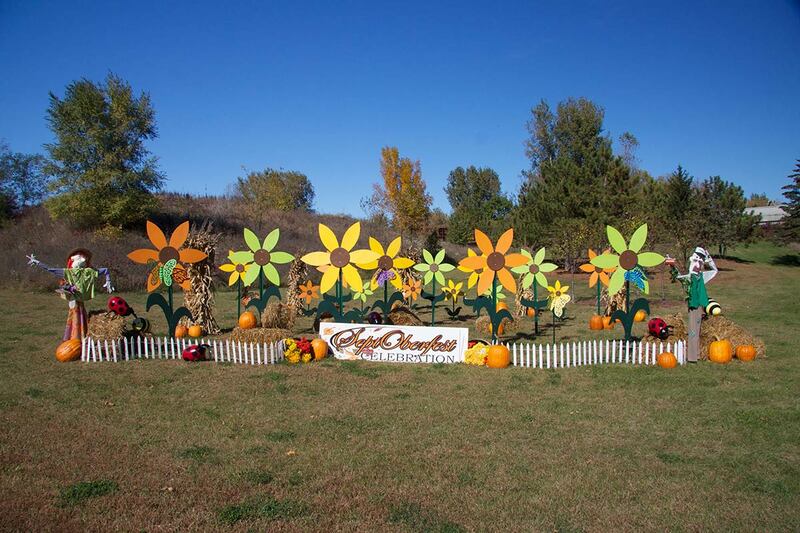 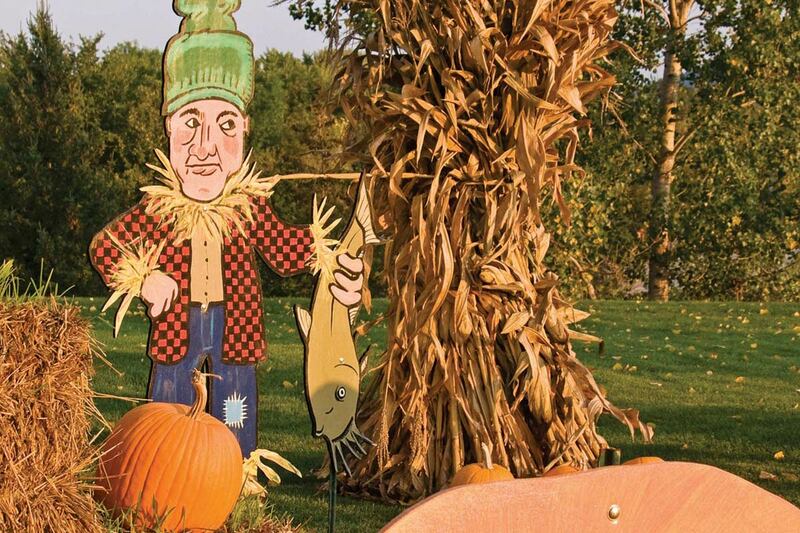 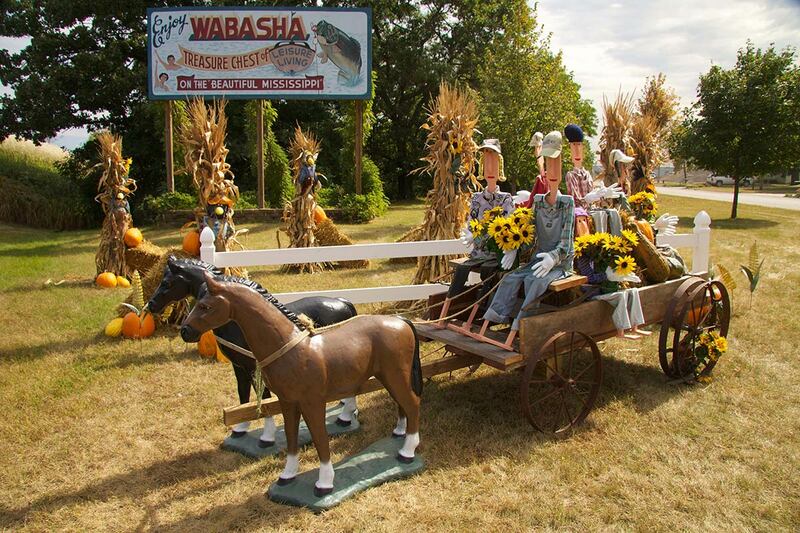 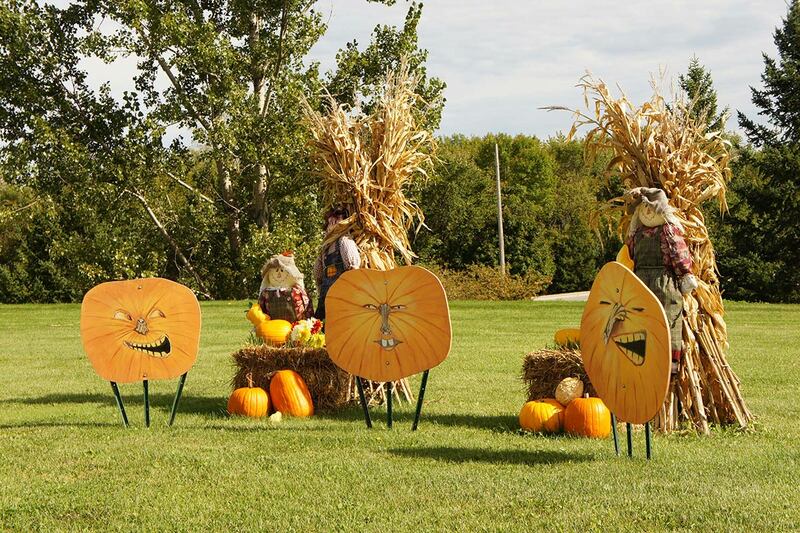 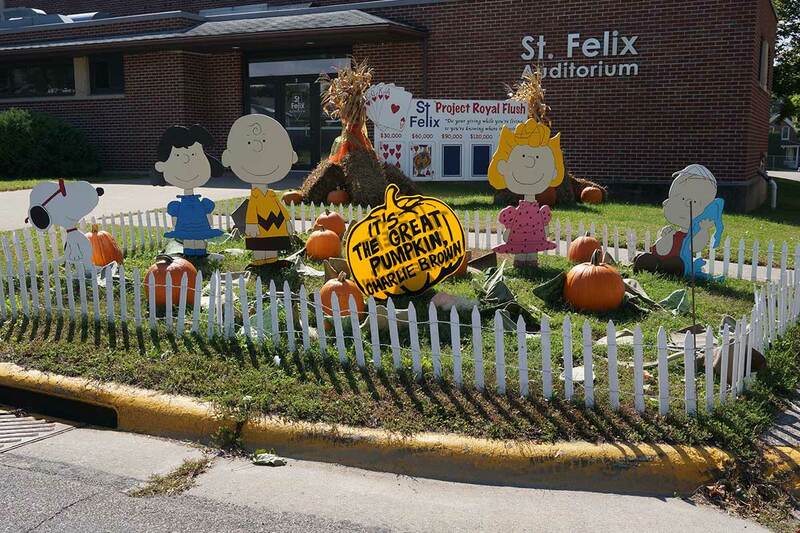 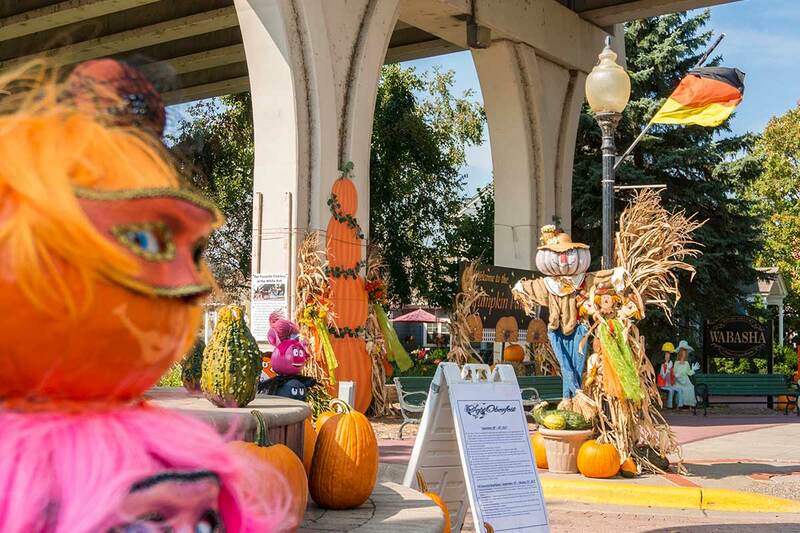 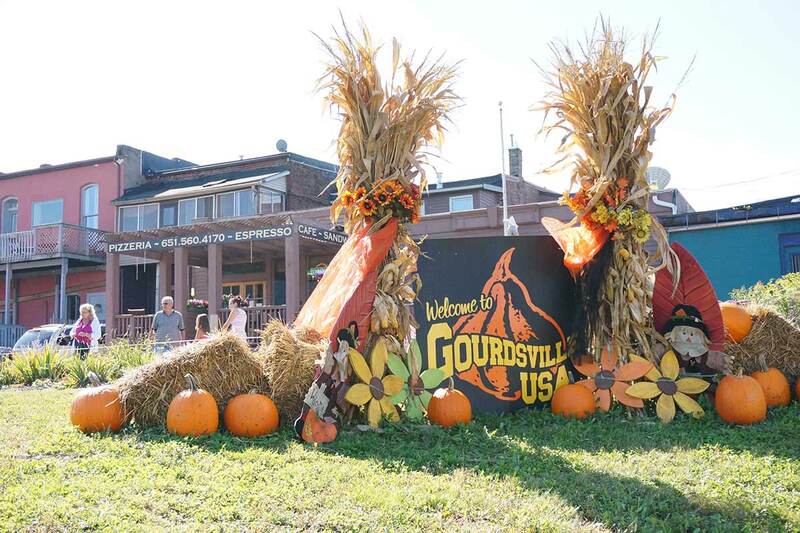 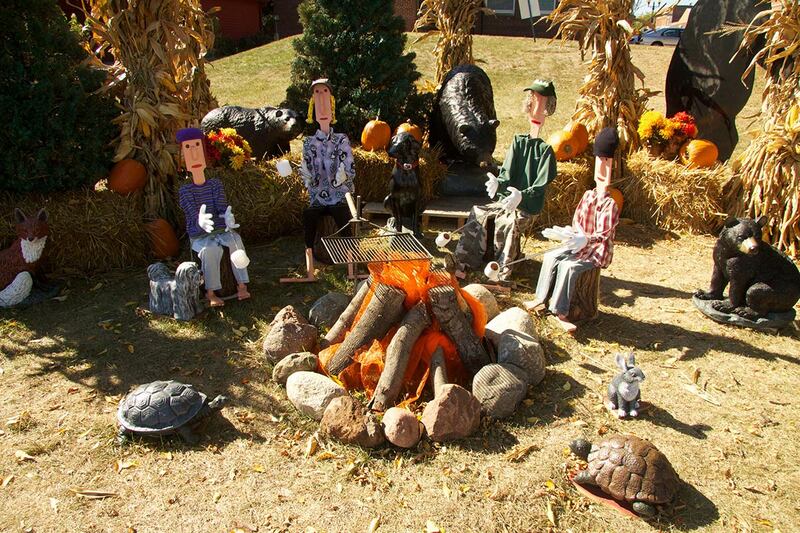 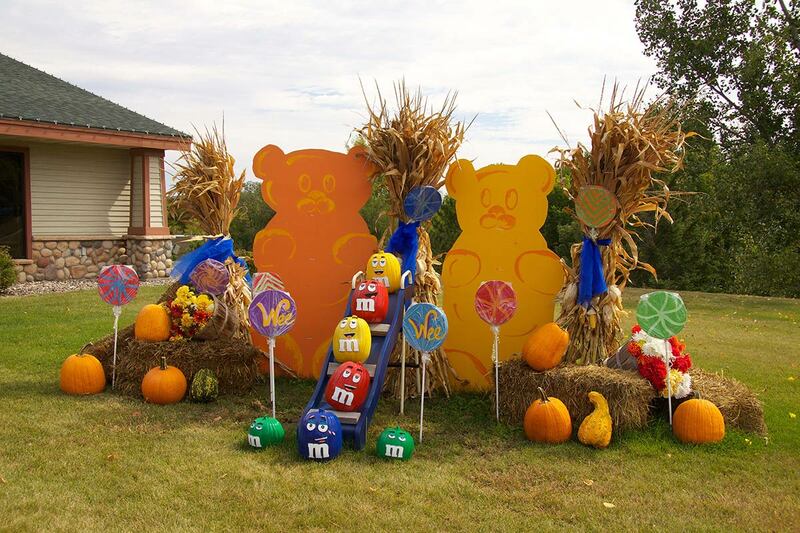 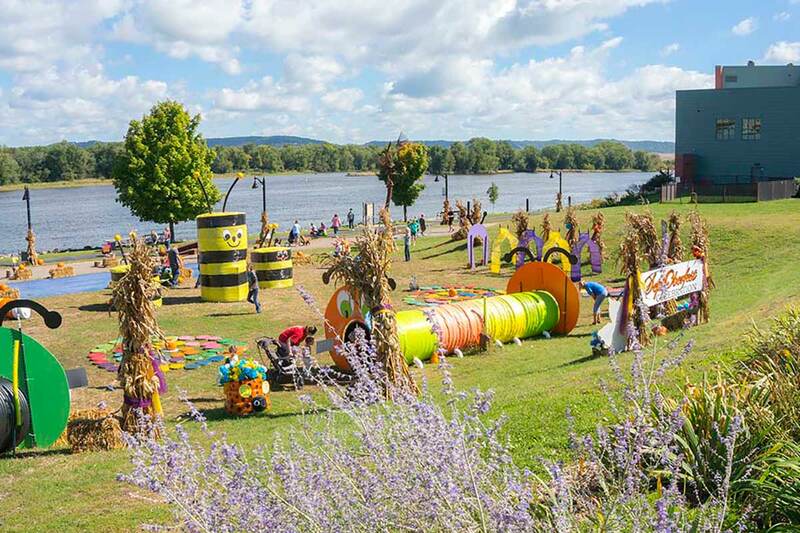 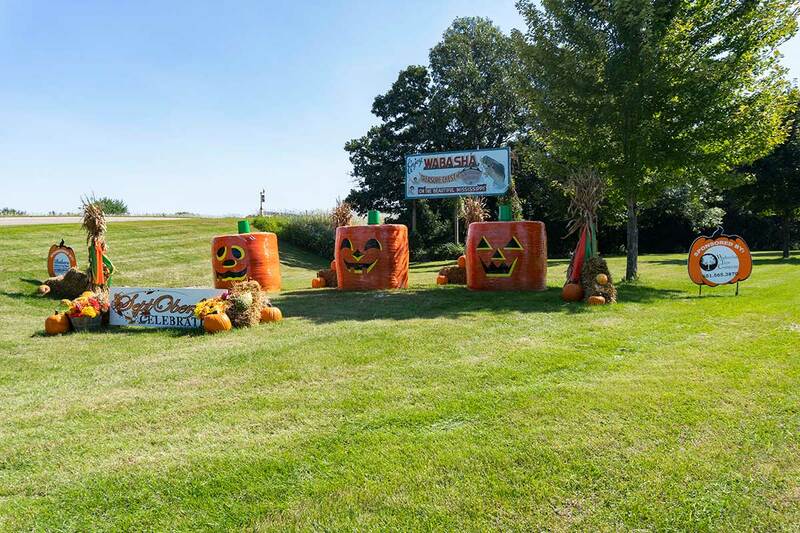 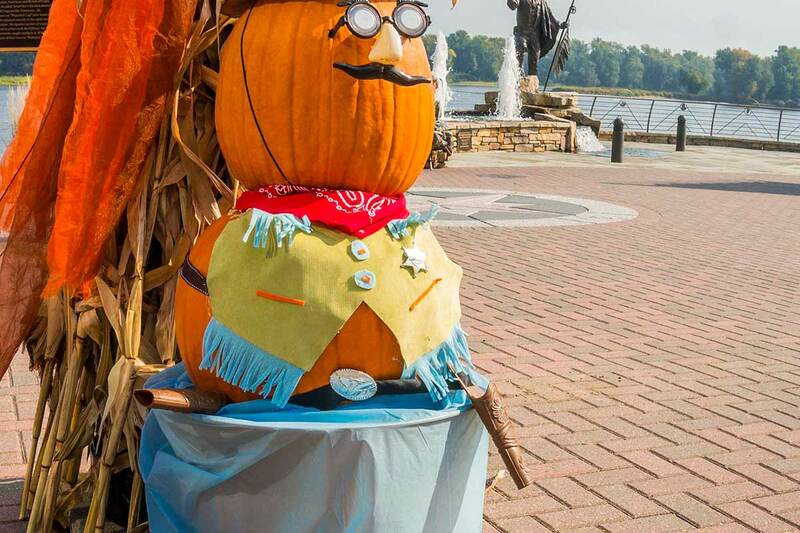 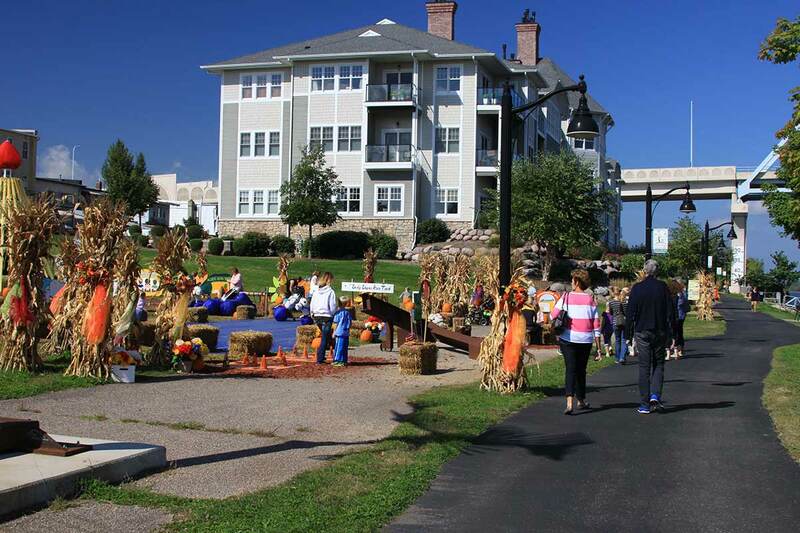 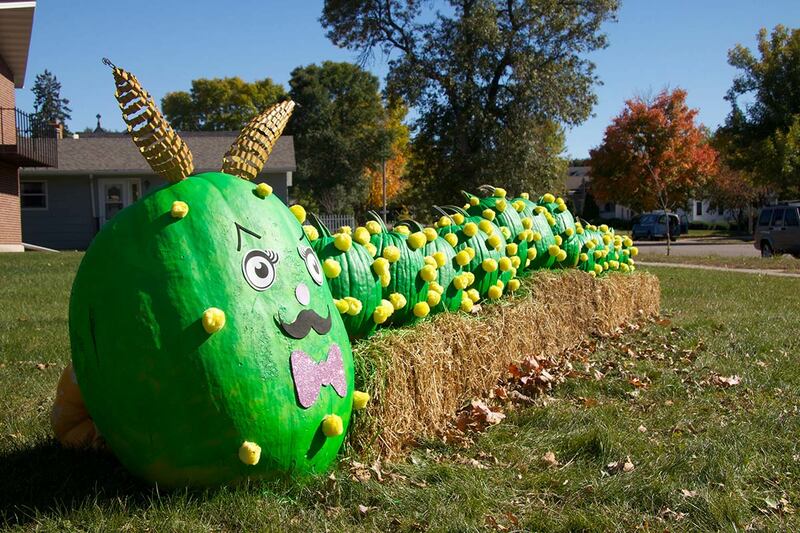 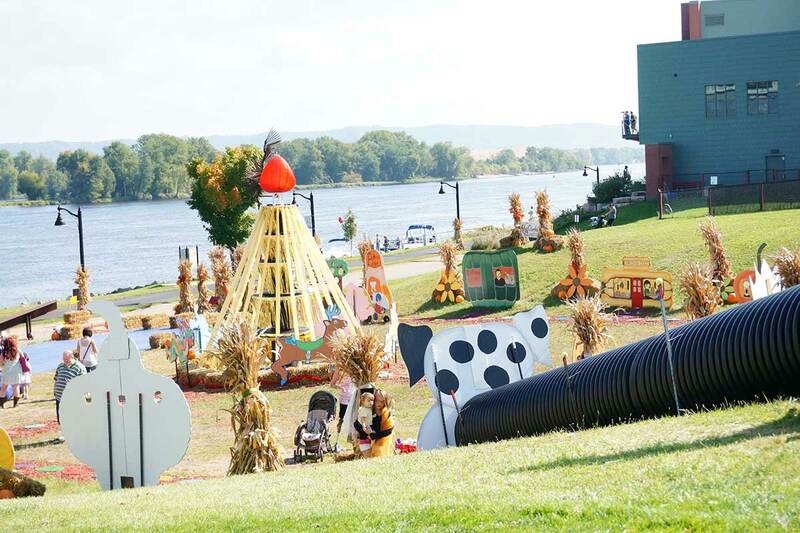 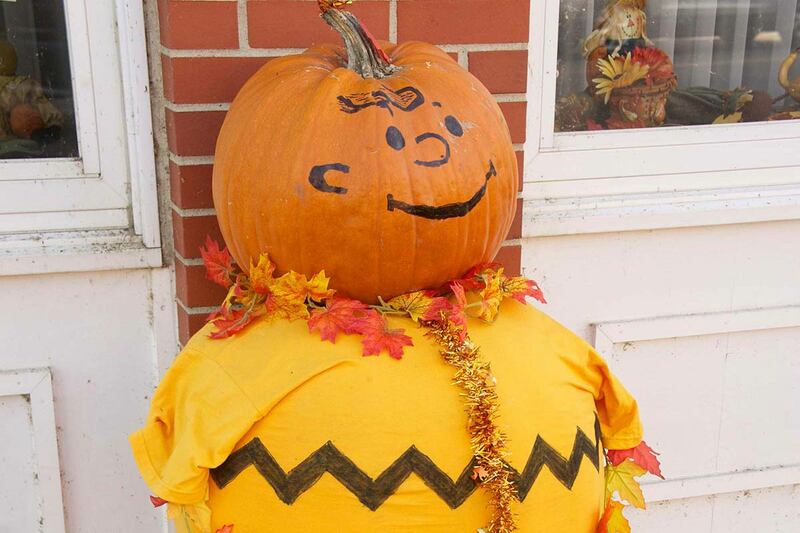 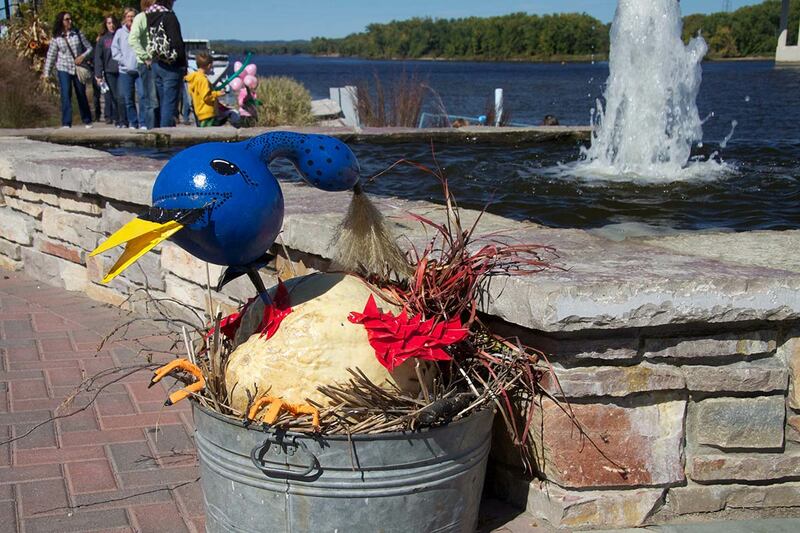 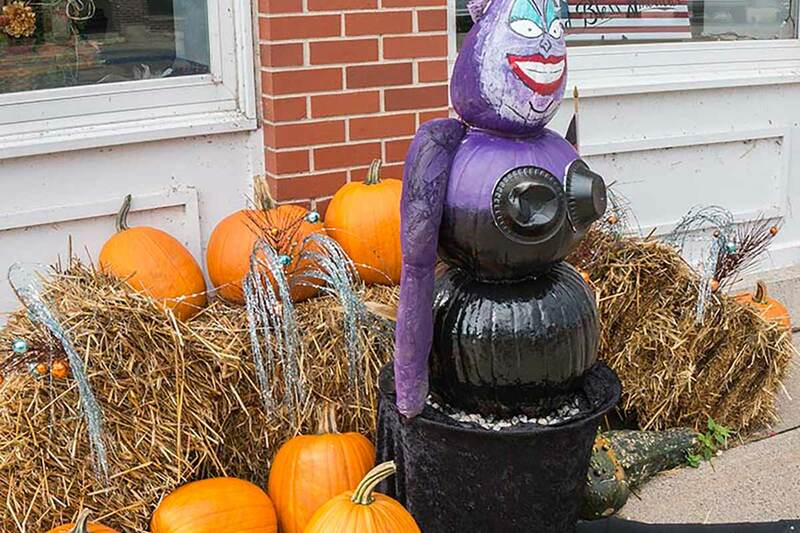 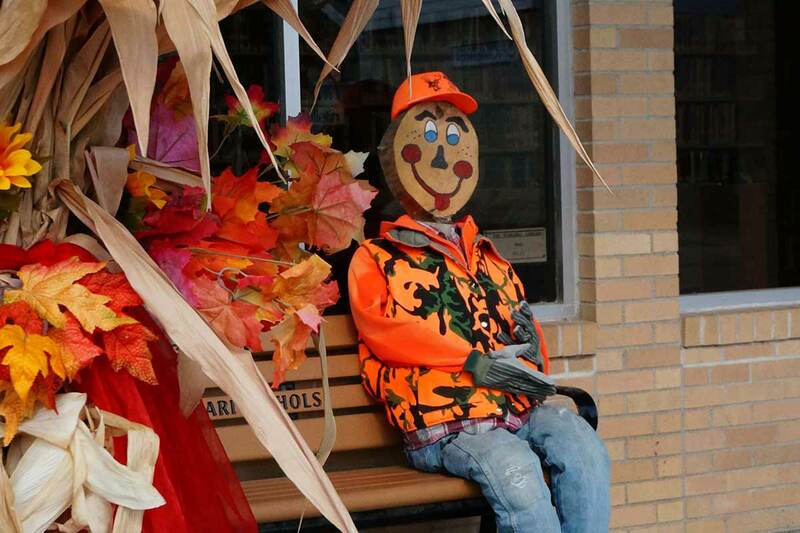 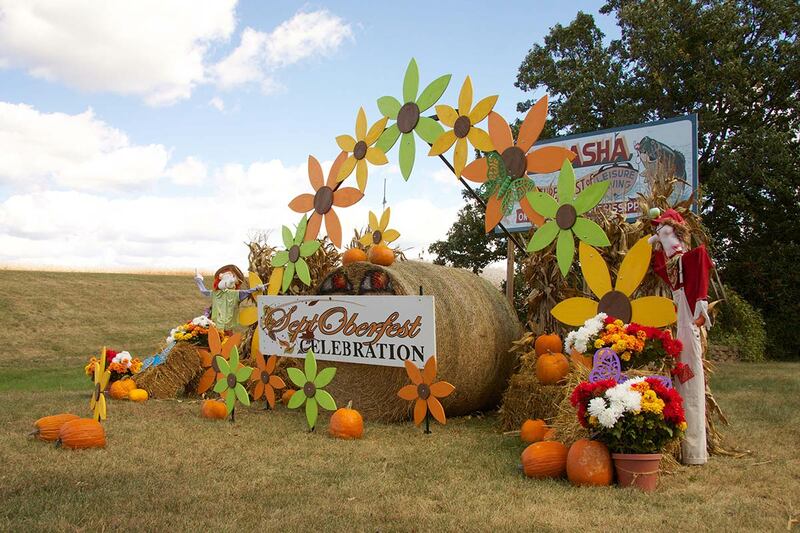 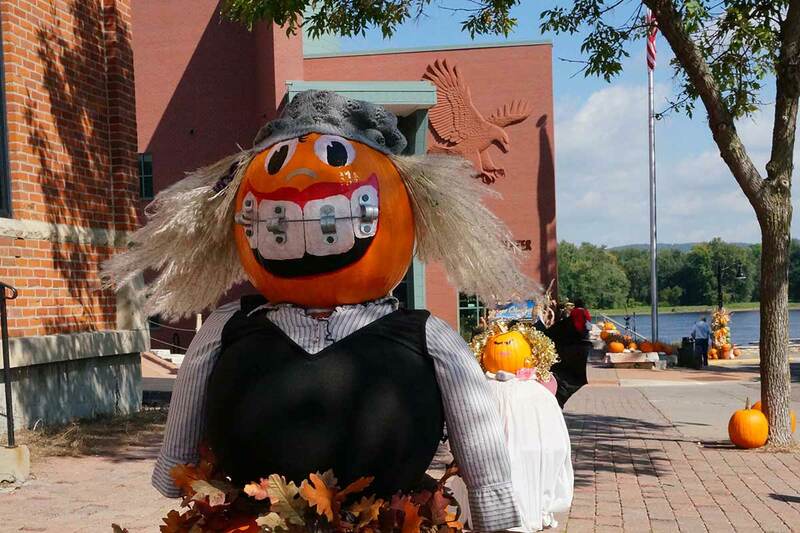 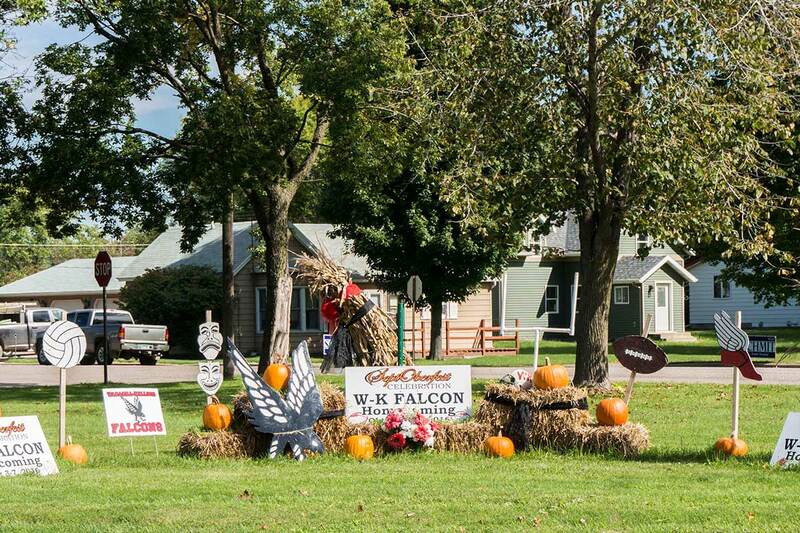 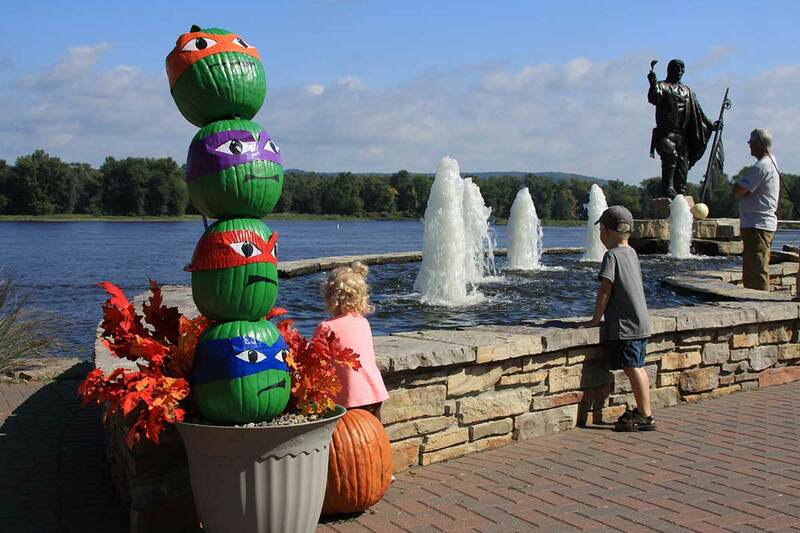 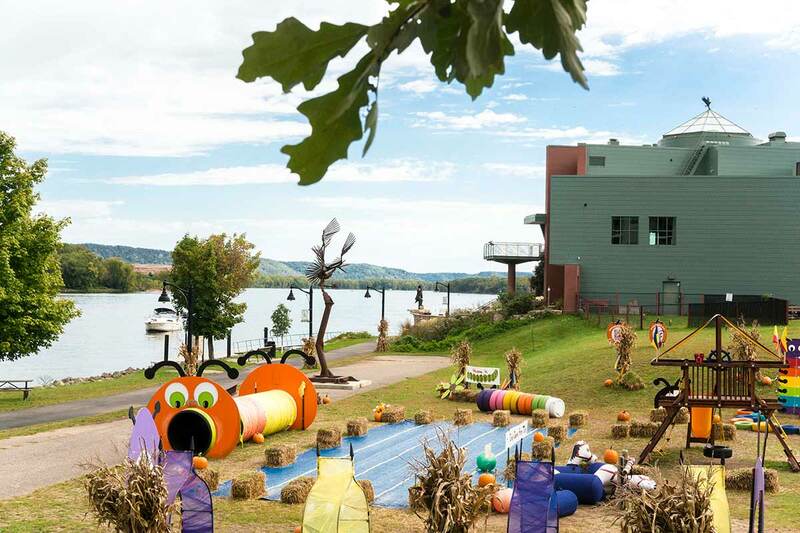 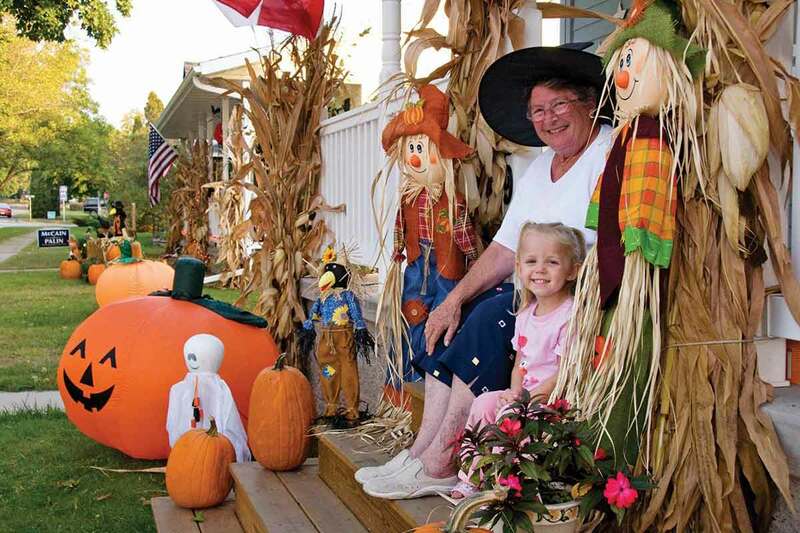 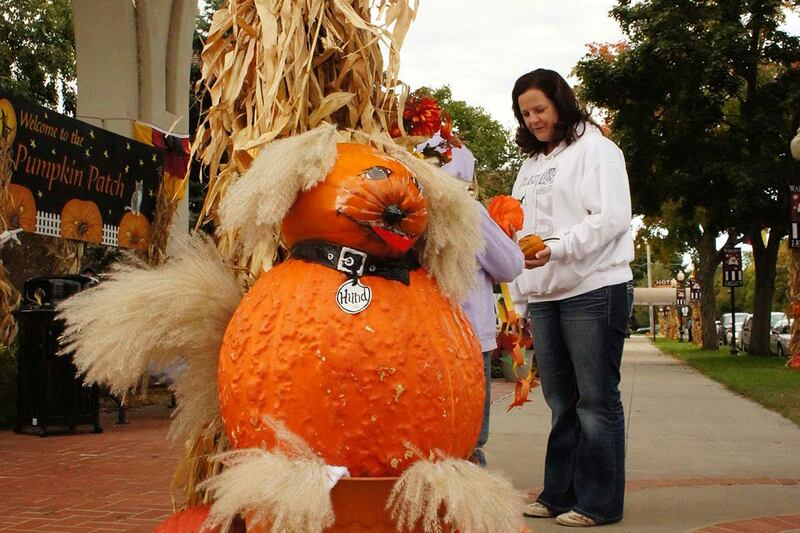 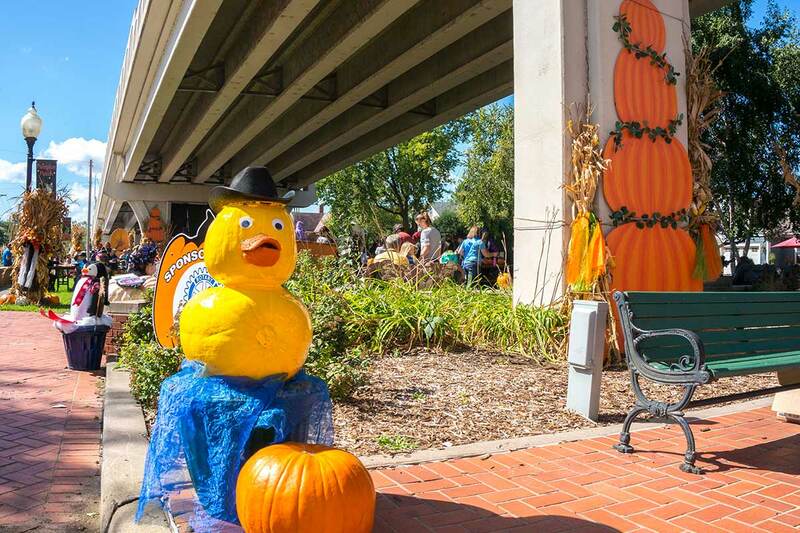 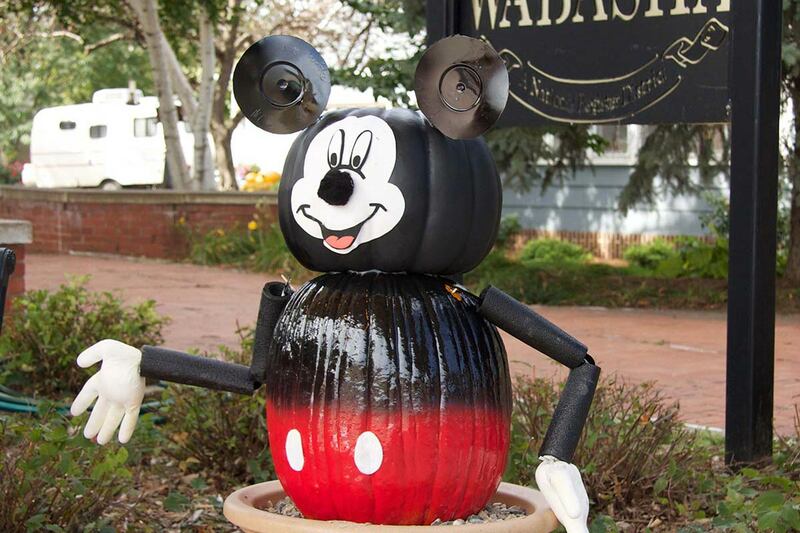 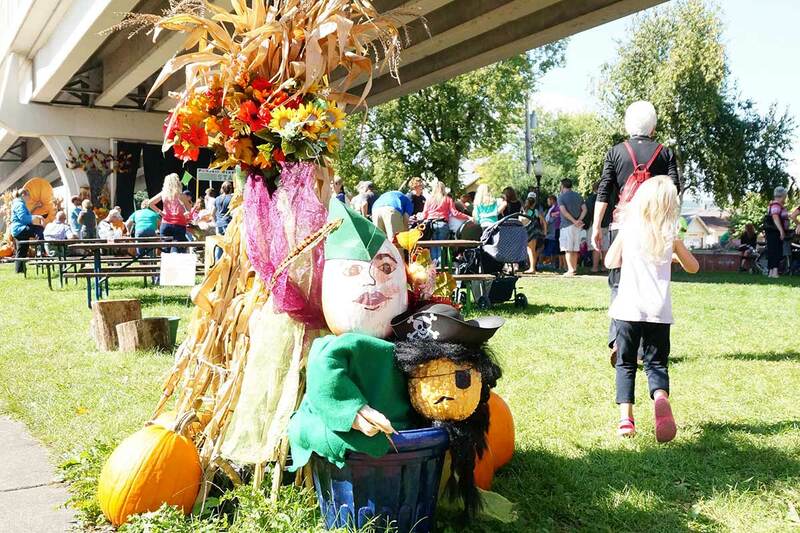 Since the first year the pumpkin topiaries began, the Wabasha-Kellogg community has continued to celebrate each other with crazy, colorful displays. 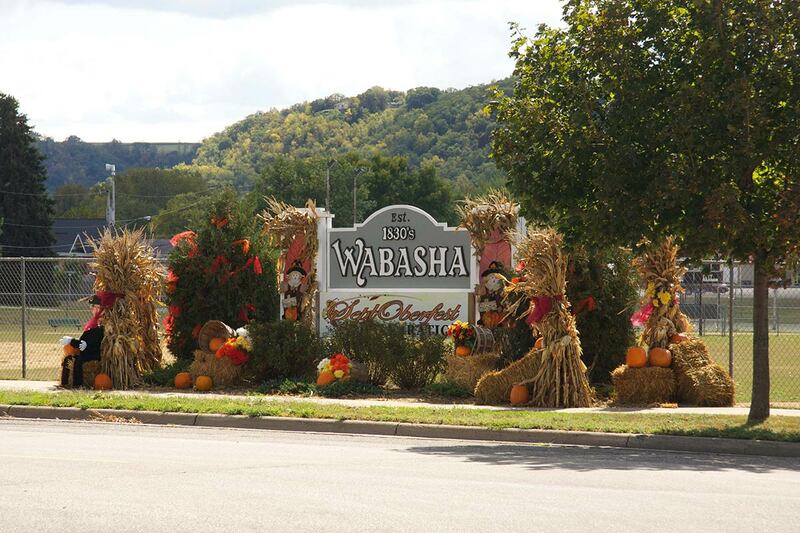 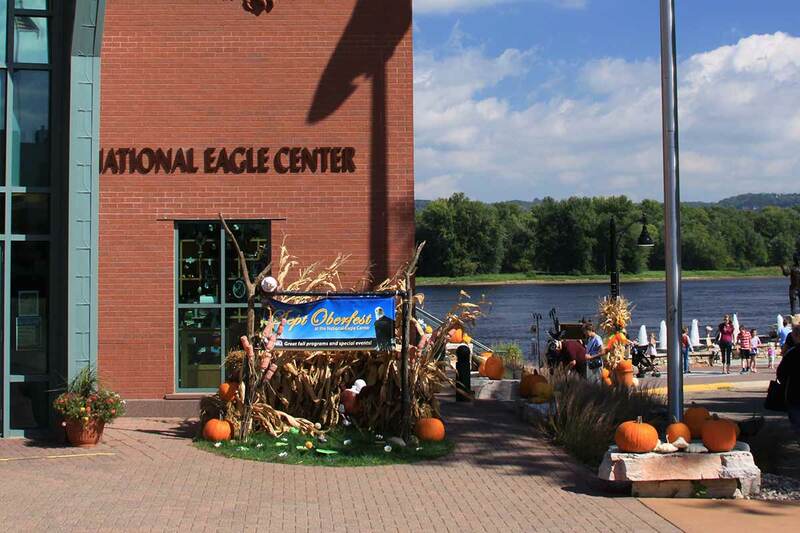 Wabasha truly is a remarkable river town!